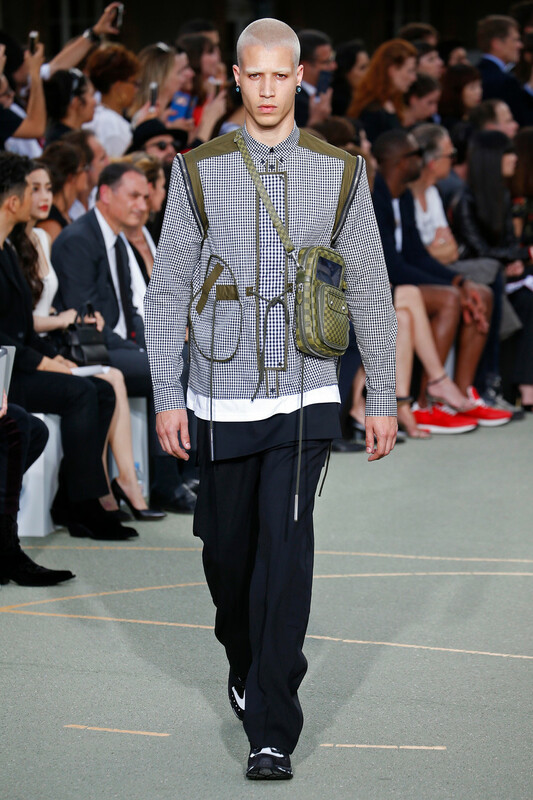 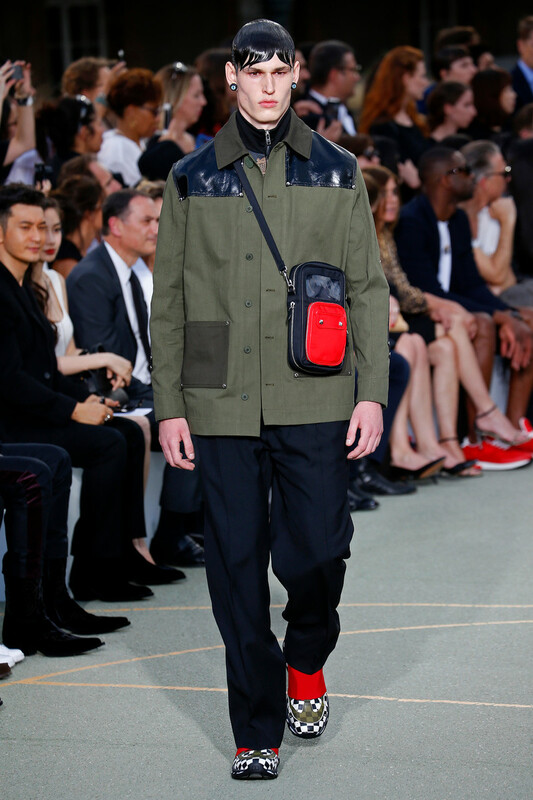 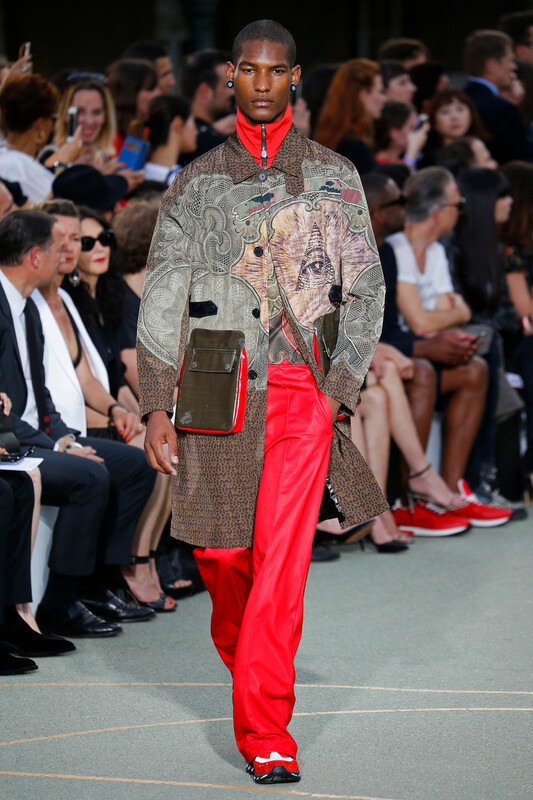 Tisci rigged his models for some kind of journey, backpacks laden with blankets — or split into three laptop-sized pouches attached to a harness. 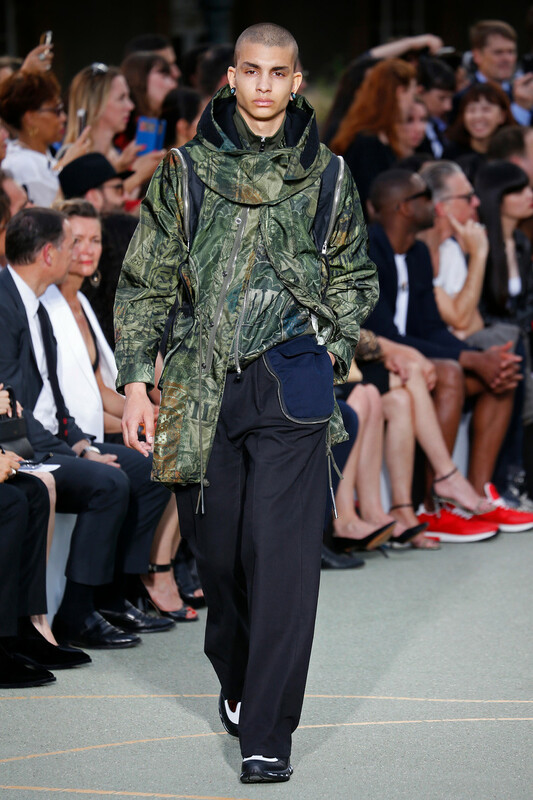 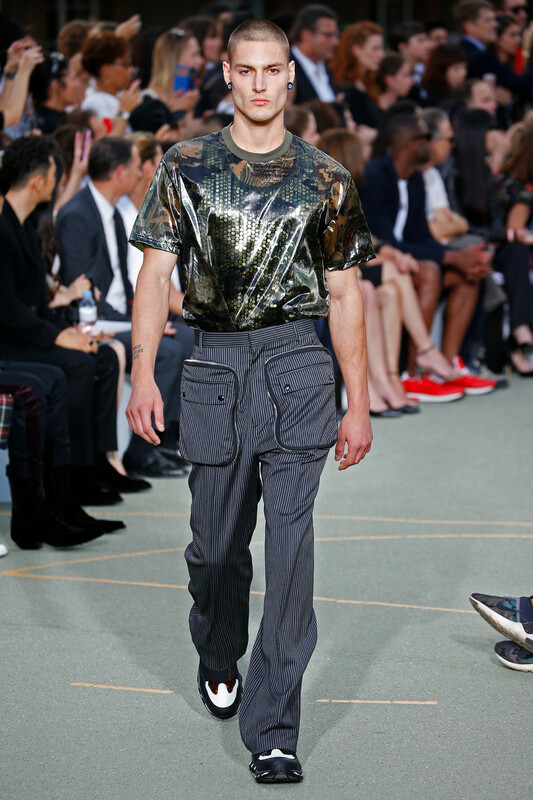 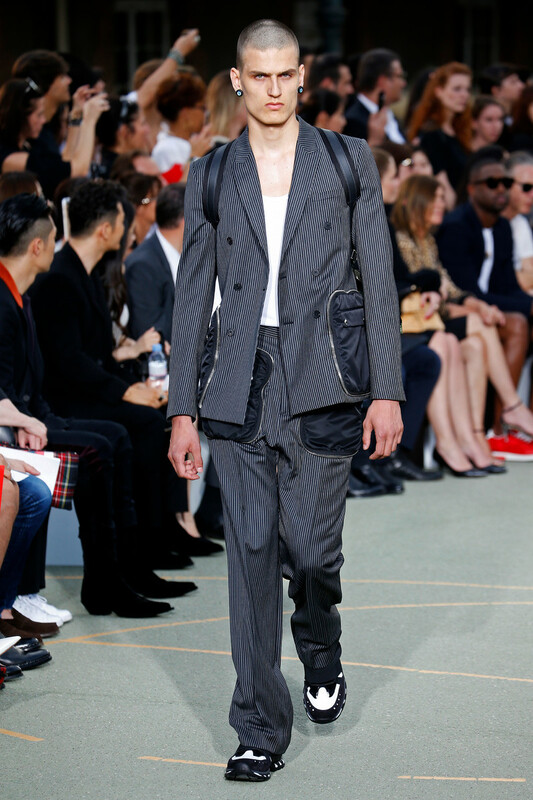 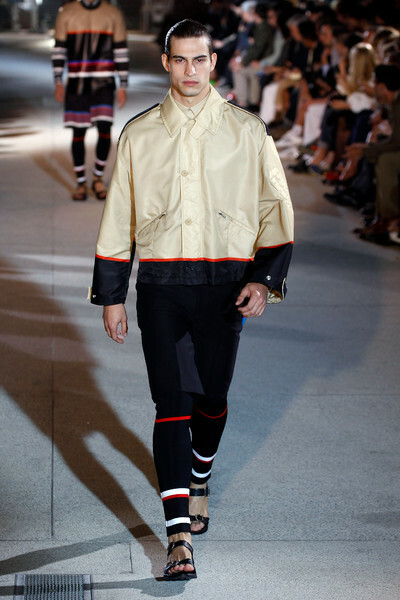 The pants, as loose and flowing as sweat pants and often licked with stripes, gave the collection an athletic aspect — as did the chunky, graphic hiking sneakers. 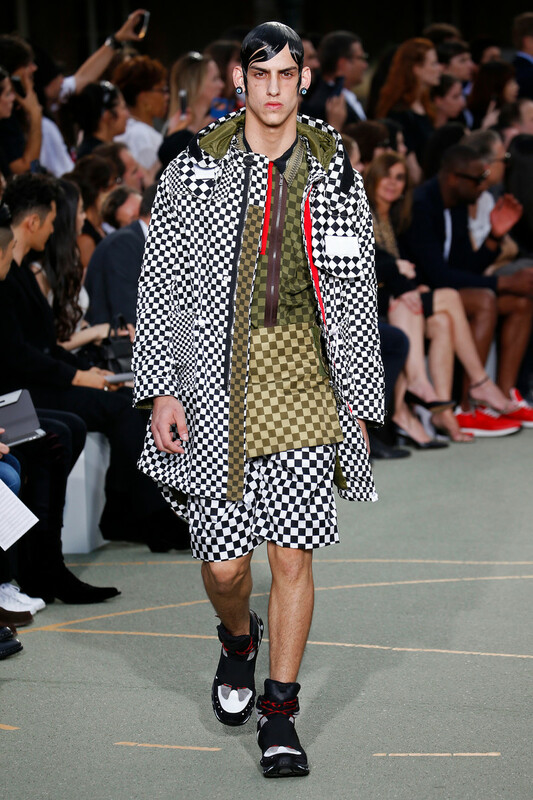 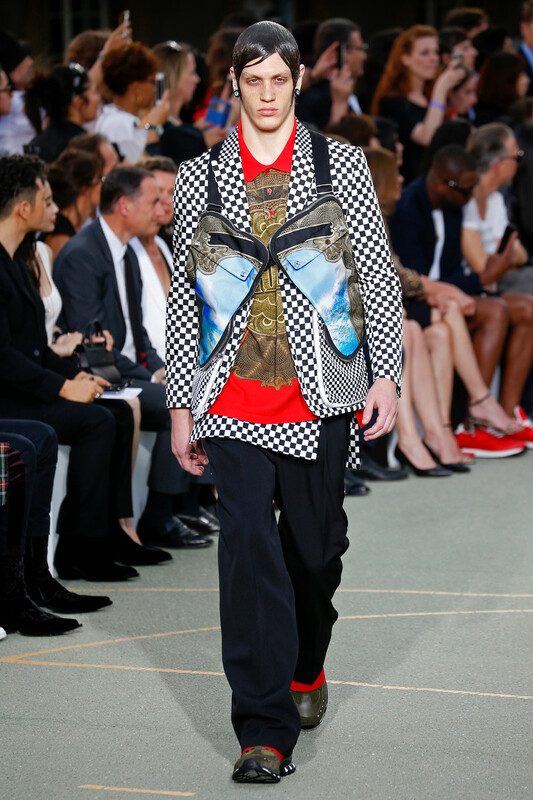 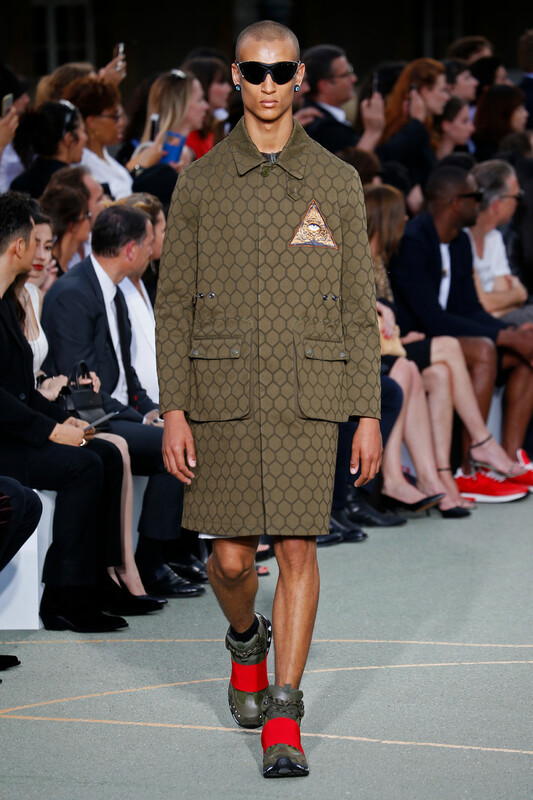 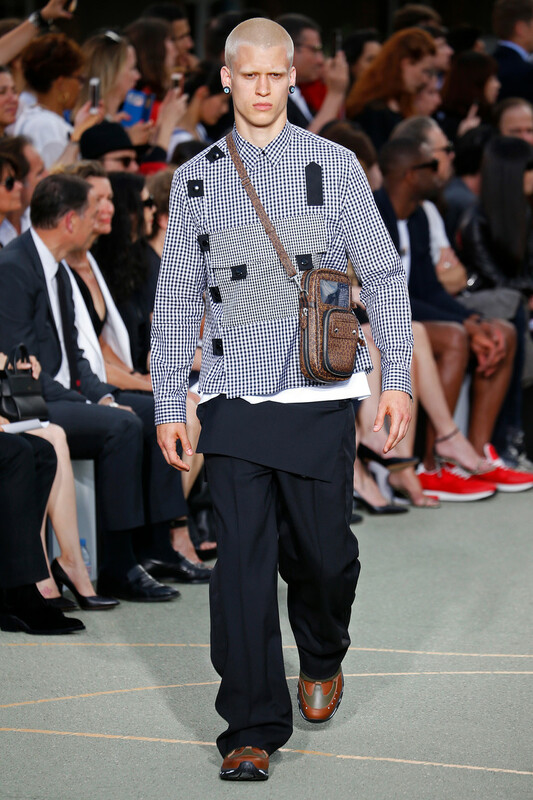 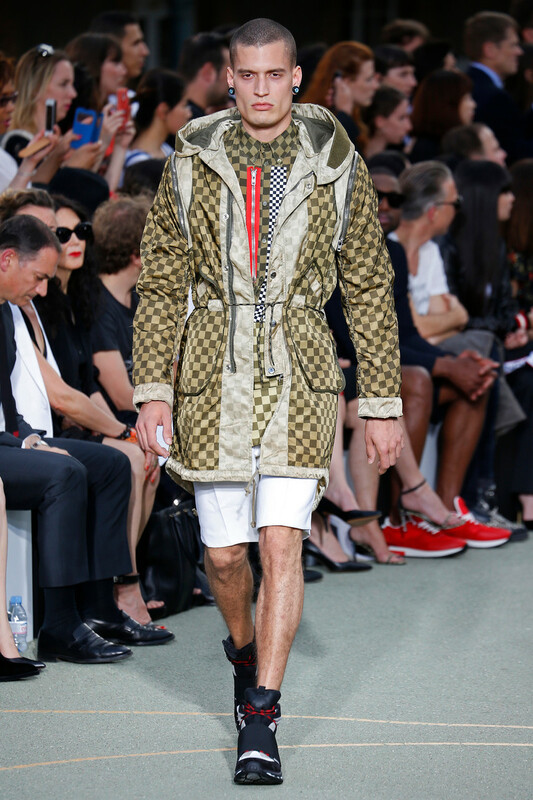 While the checkerboard patterns skewed a bit close to Louis Vuitton’s Damier check, the reference was games. 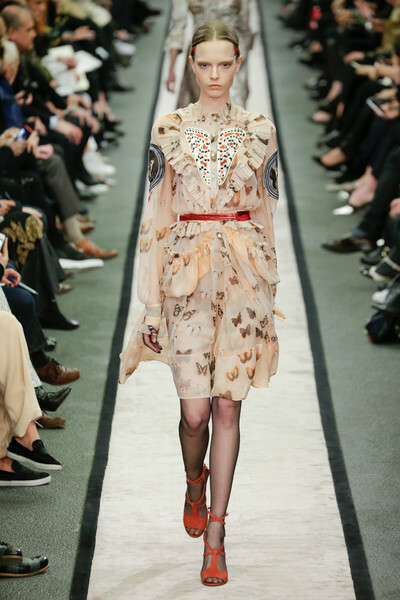 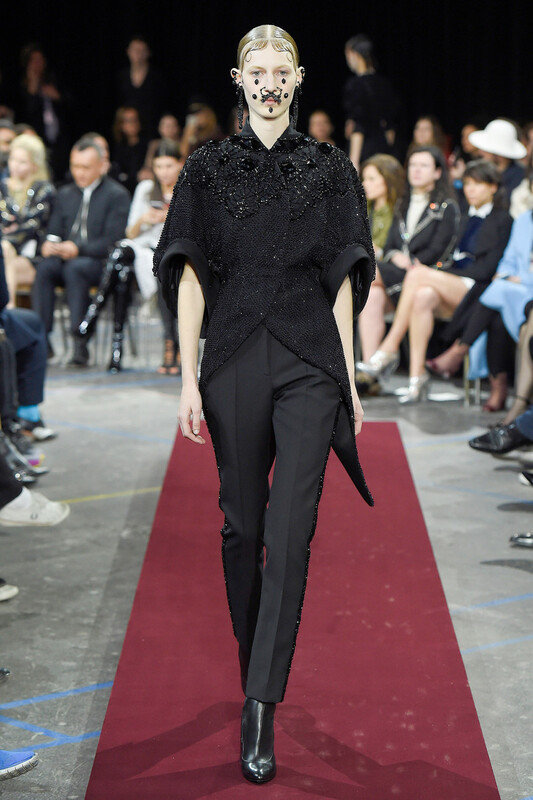 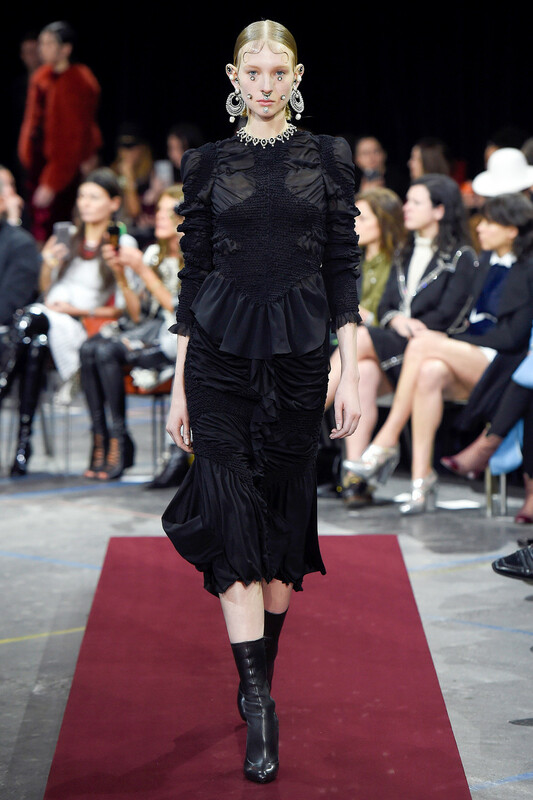 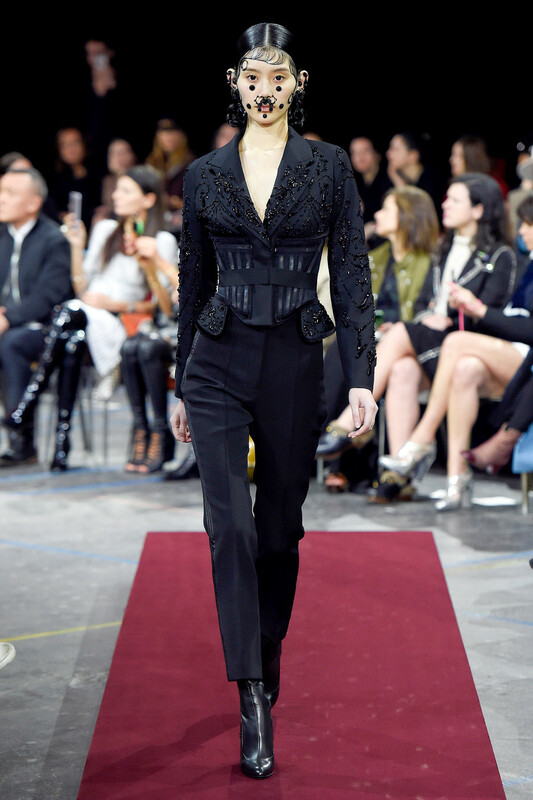 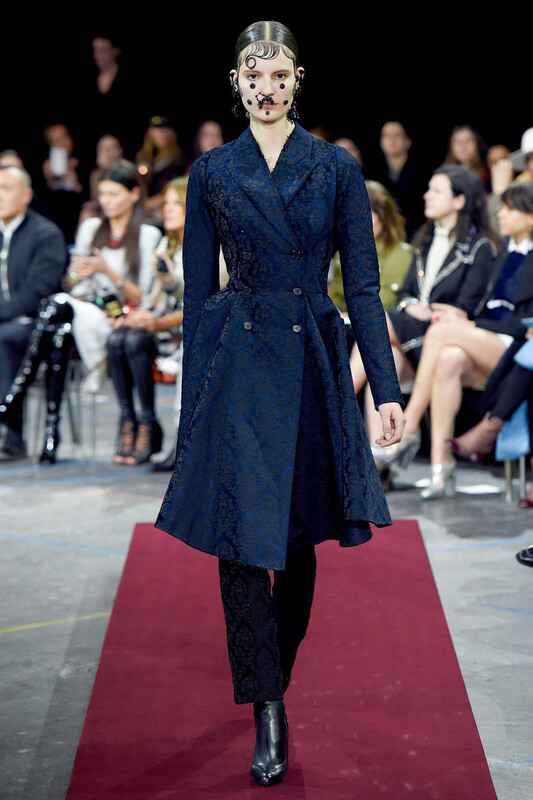 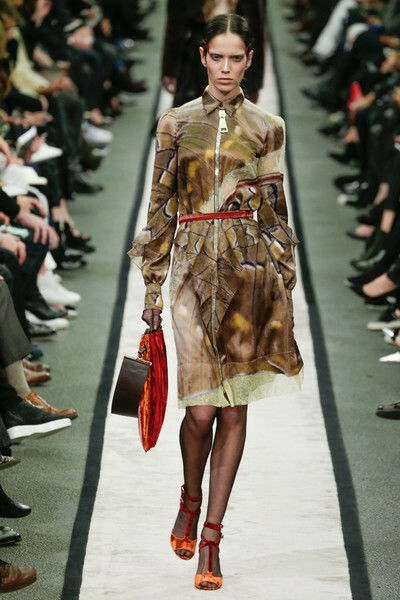 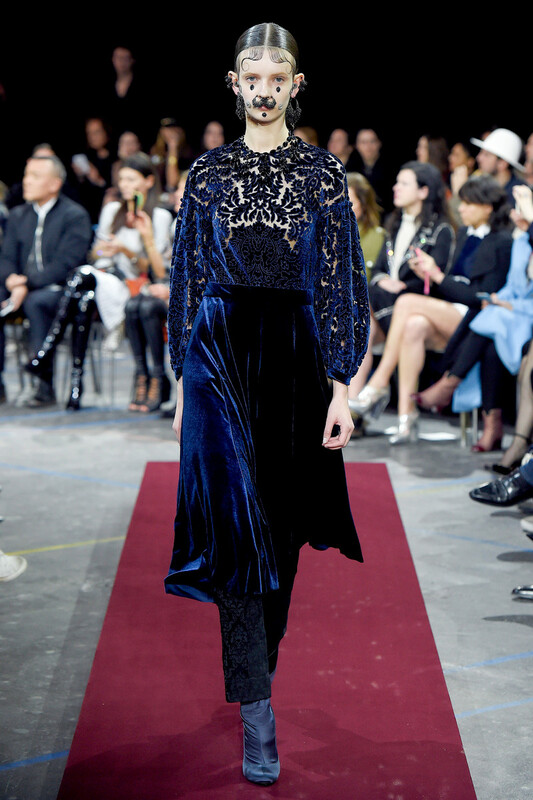 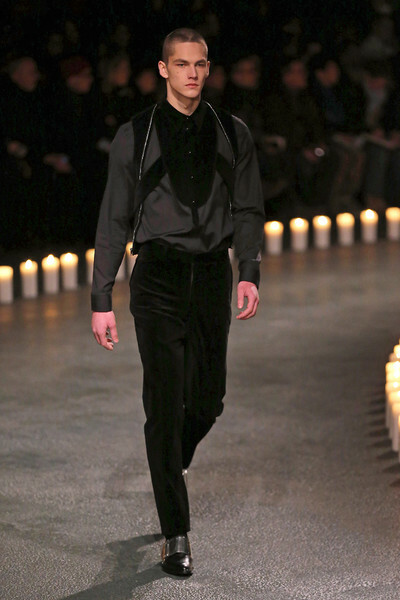 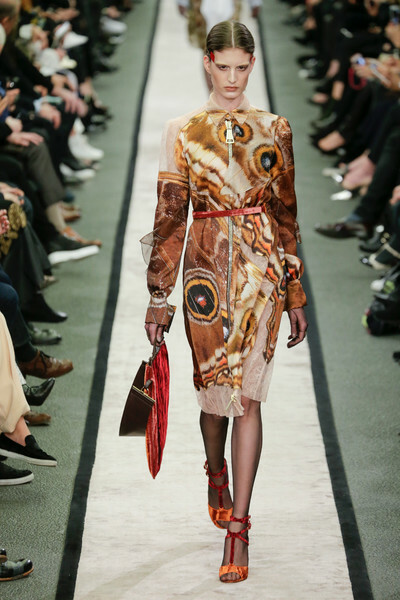 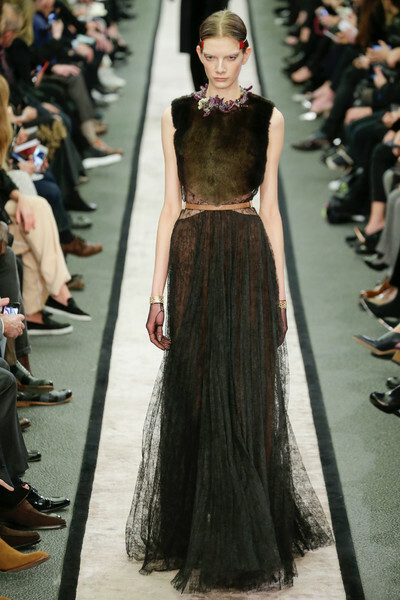 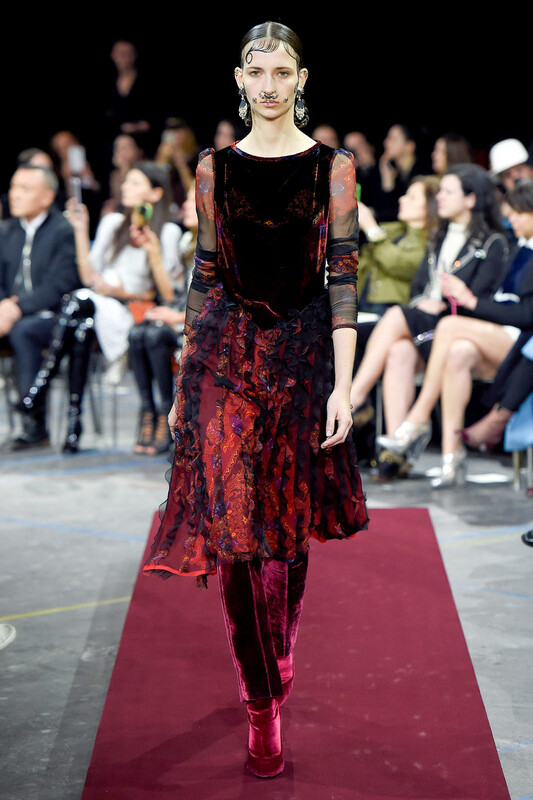 Riccardo Tisci of Givenchy found his inspiration for fall in Victoriana and the Latin toreador. 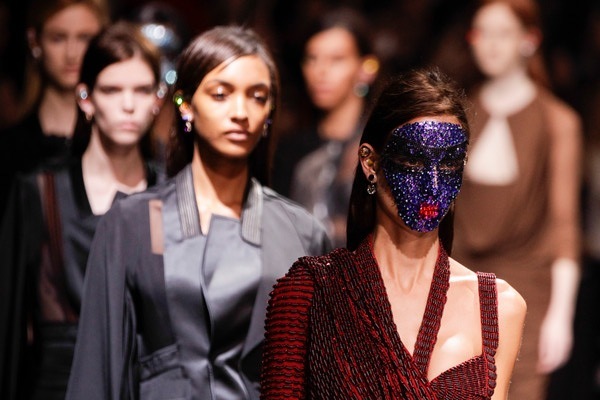 The models had their hair in tight, braided loops with exaggerated curls plastered onto cheeks and foreheads and the wore framing facial jewelry that replicated piercings and tattoos. 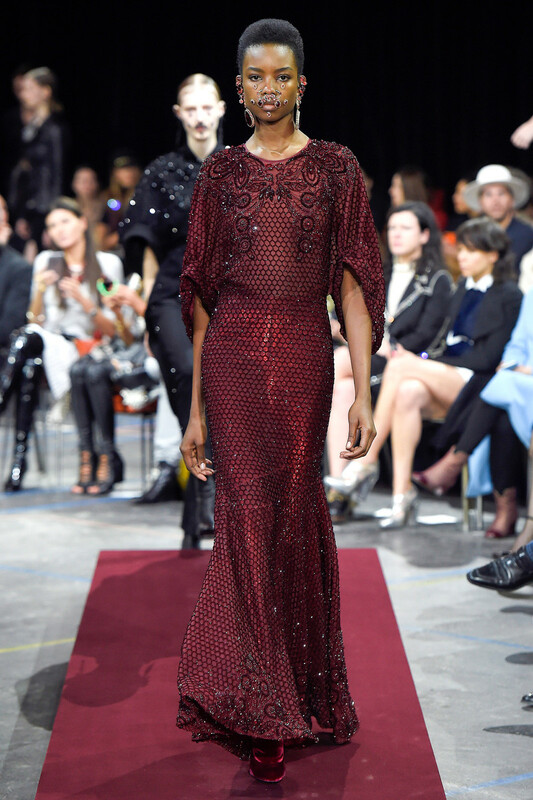 They looked beautiful and fierce. 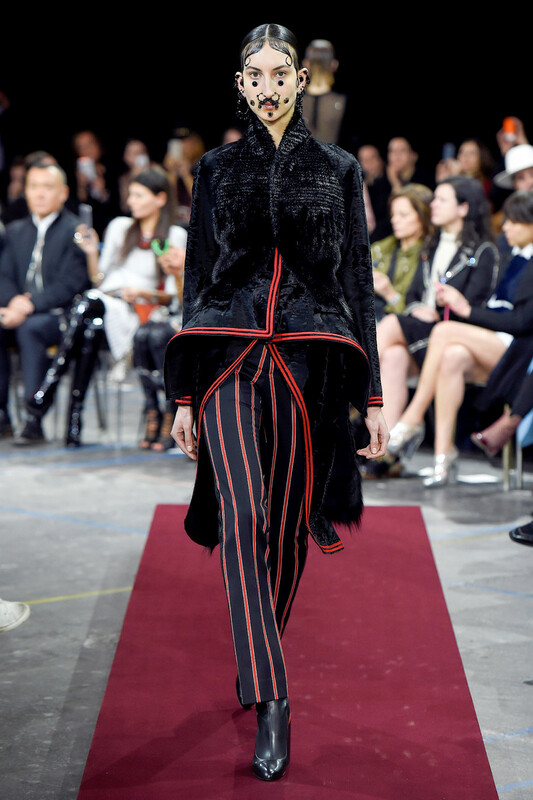 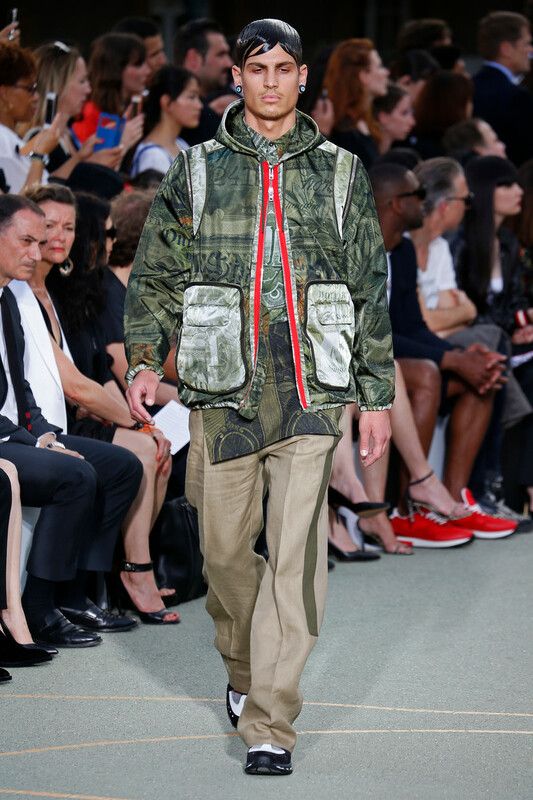 On Tisci’s runway the mix resulted in short, trim jackets over sleek pants which transitioned seamlessly to tailcoats, some with peplums or double cutaways; some piped in un-Brit scarlet. 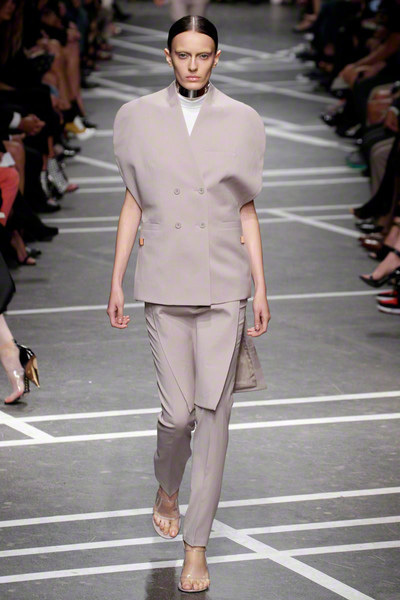 The tailoring was sensual but seldom arch, with considerable diversity within the sphere. 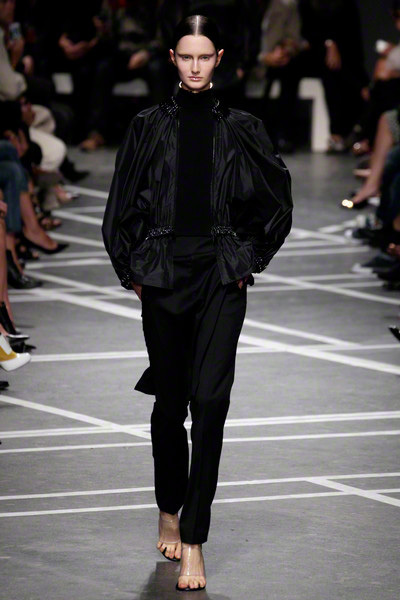 For example, while most jackets veered sleek, a pair of jeweled stunners featured dropped shoulders and short, cocoon-like sleeves. 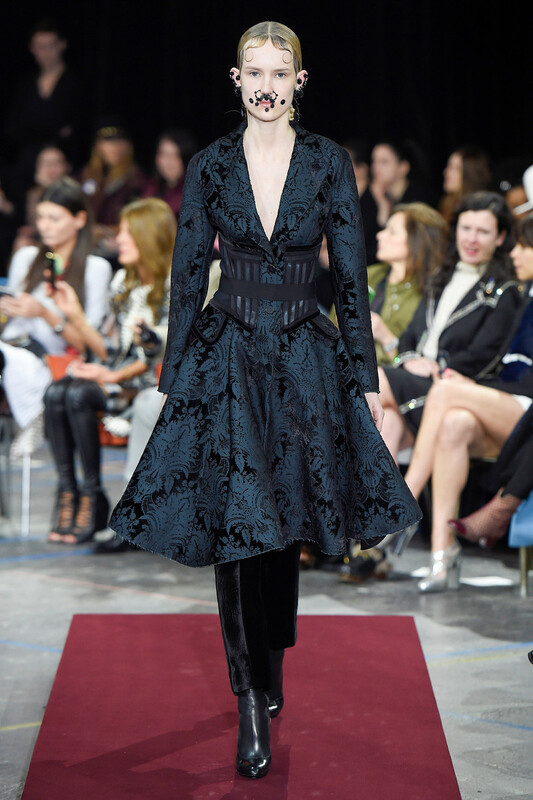 Dresses came mostly in velvets – cut, printed, crushed – some corseted, some almost medieval in their fluid lines and Byzantine palette. 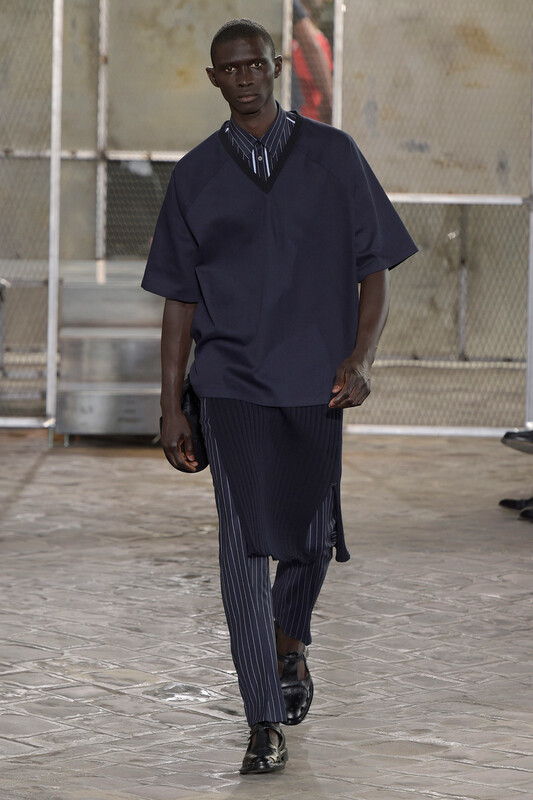 No bold, graphic shirts and mad fabrics, but a restrained and almost calm collection. 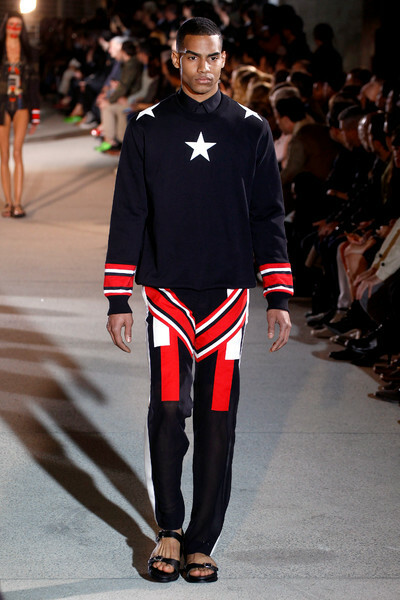 Riccardo Tisci thought it was time to do something different. 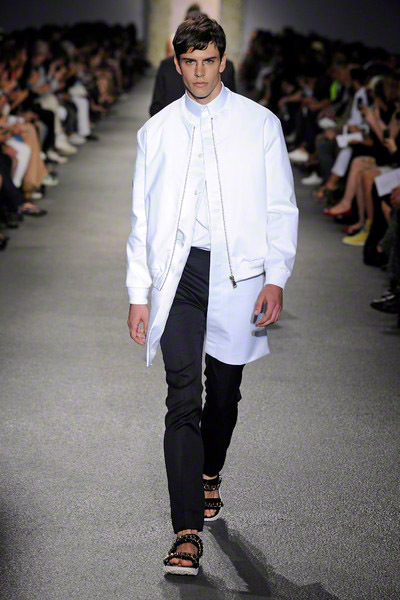 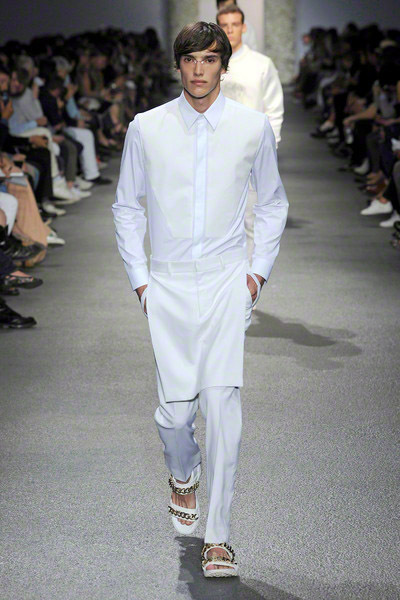 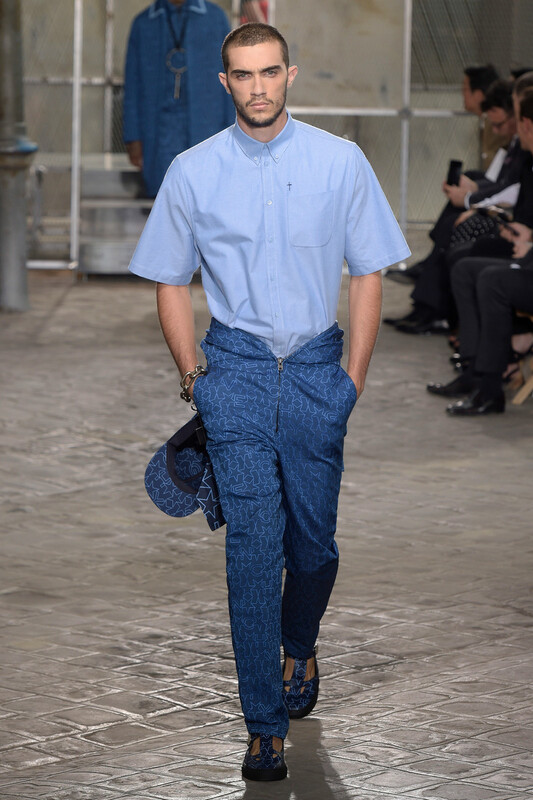 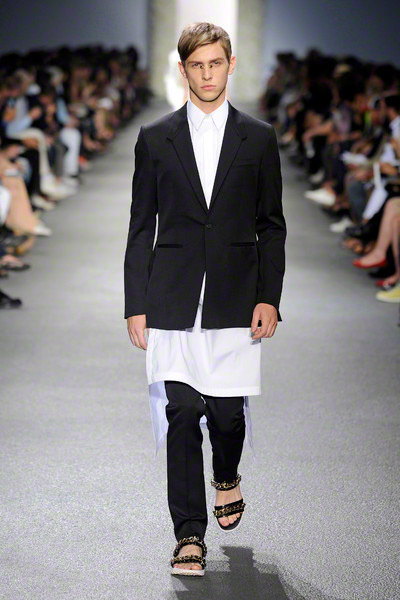 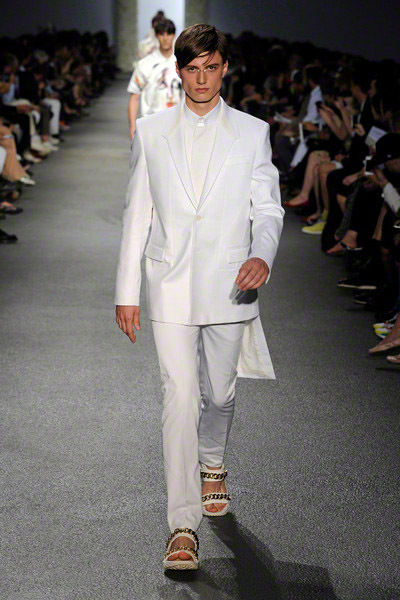 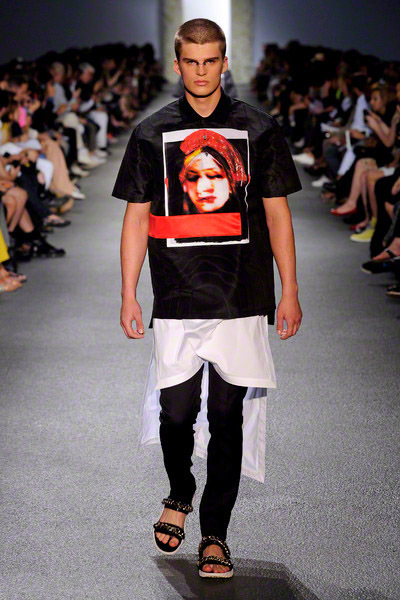 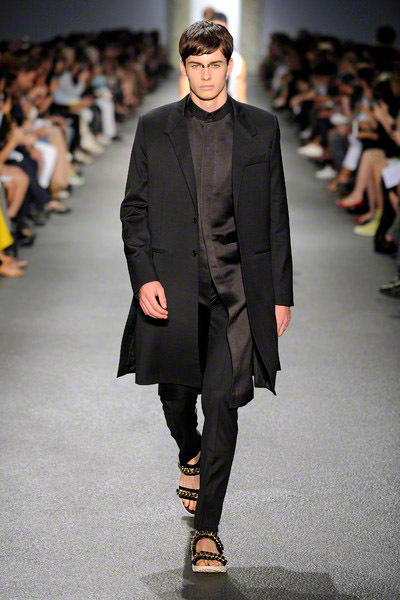 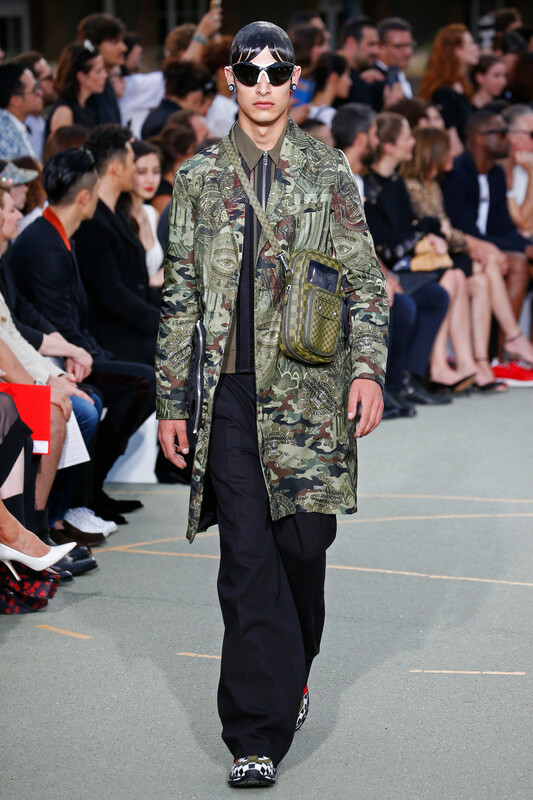 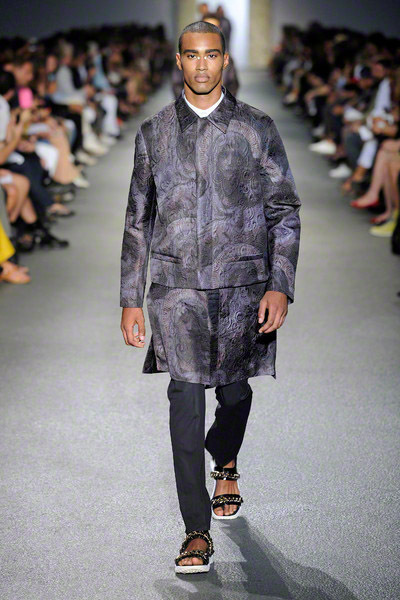 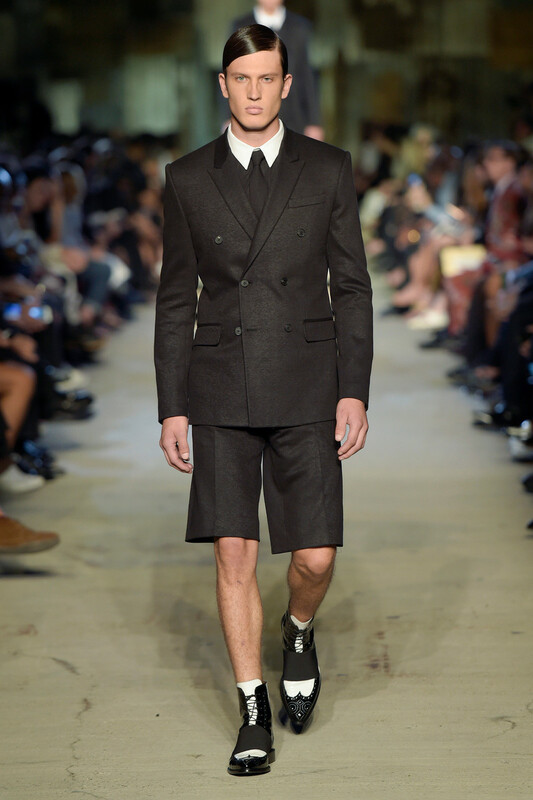 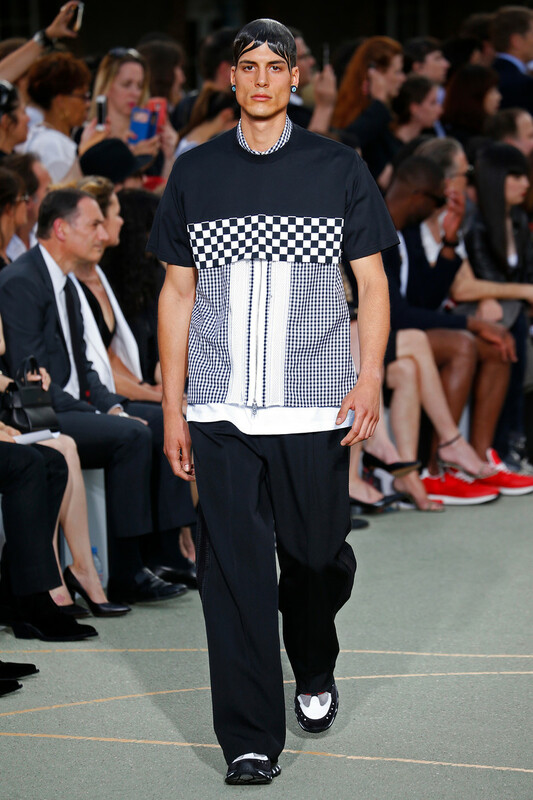 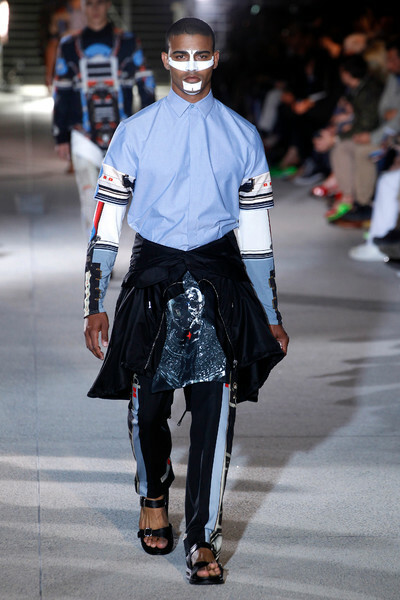 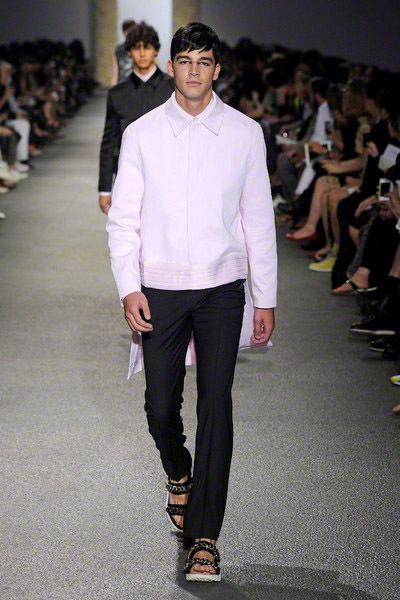 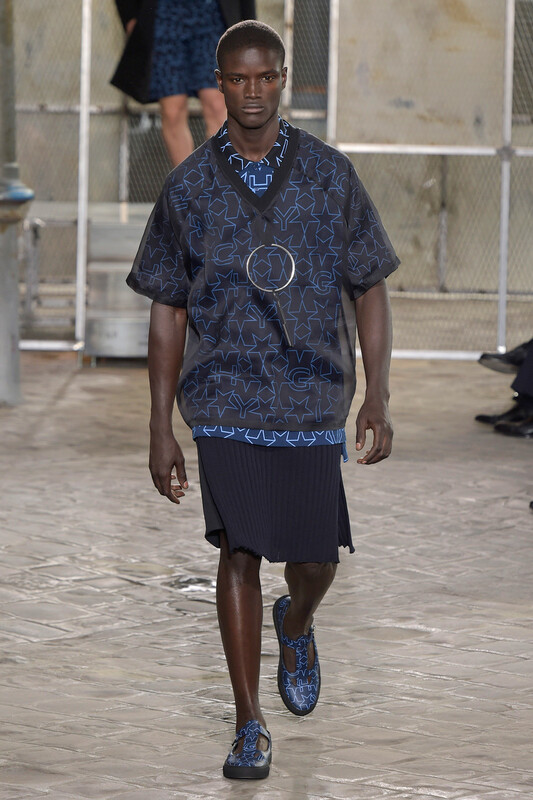 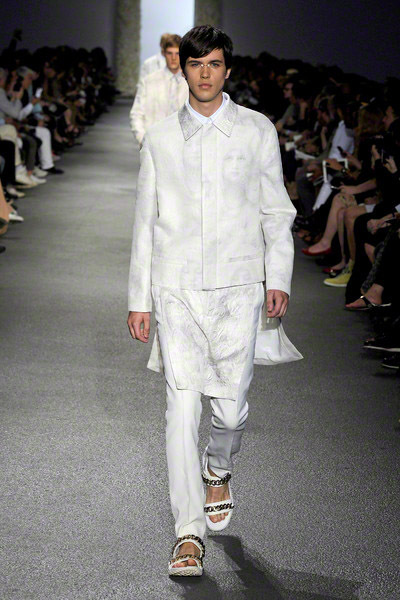 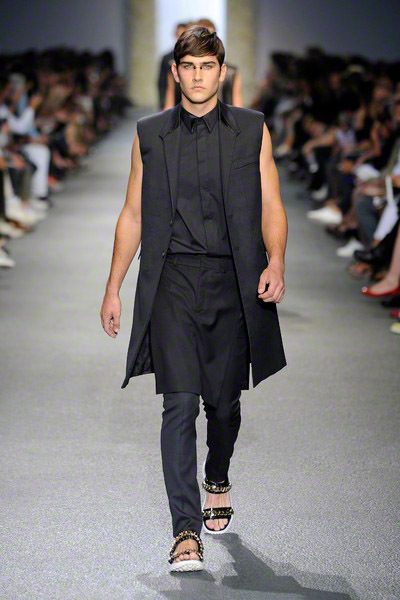 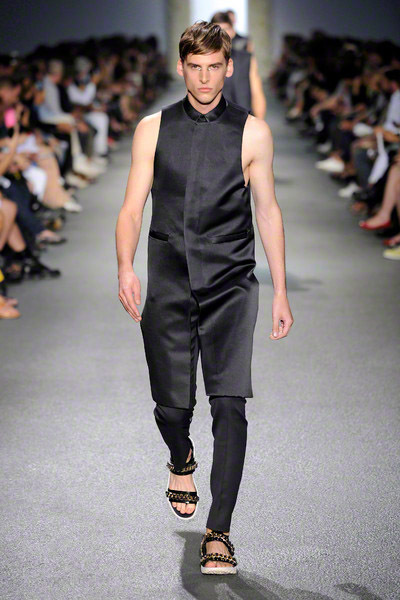 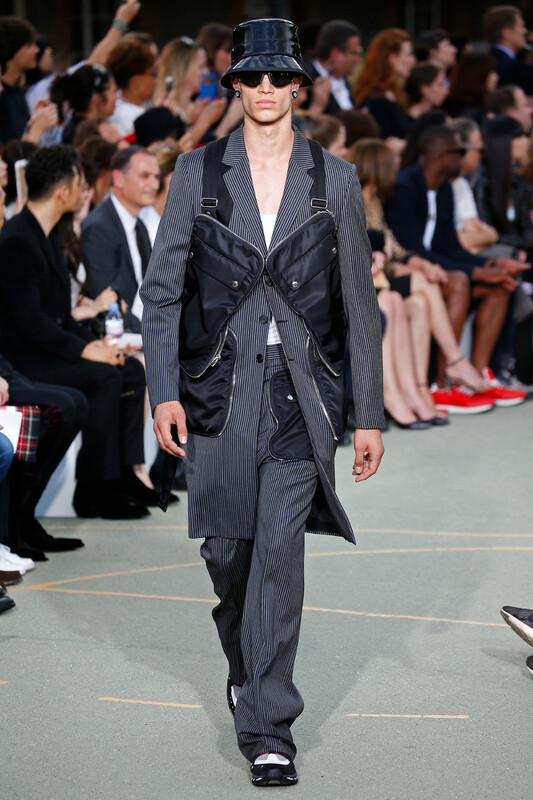 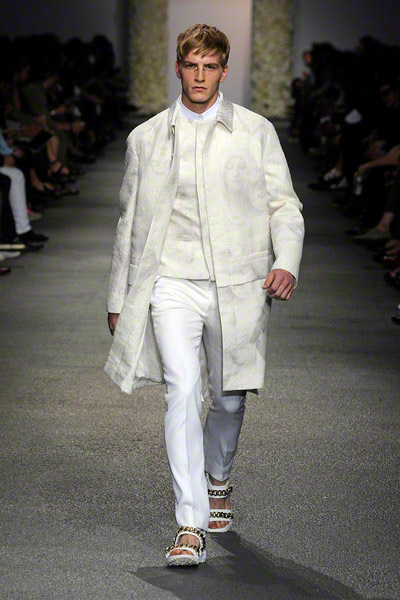 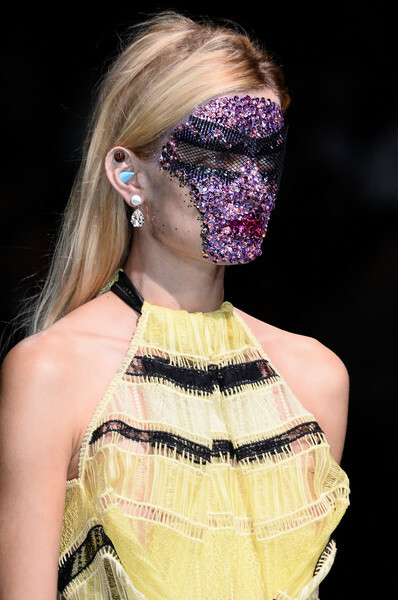 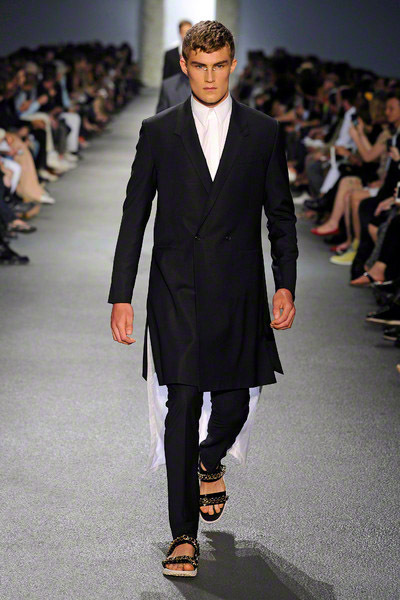 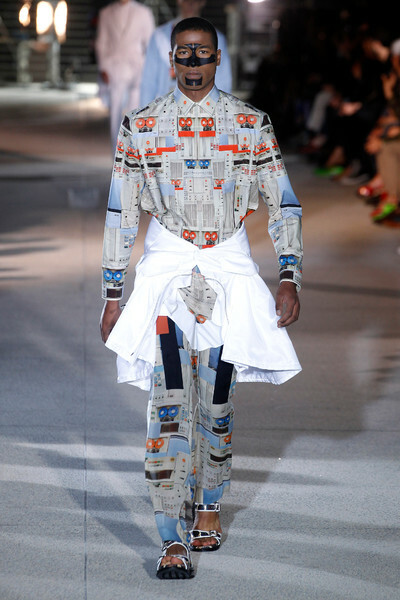 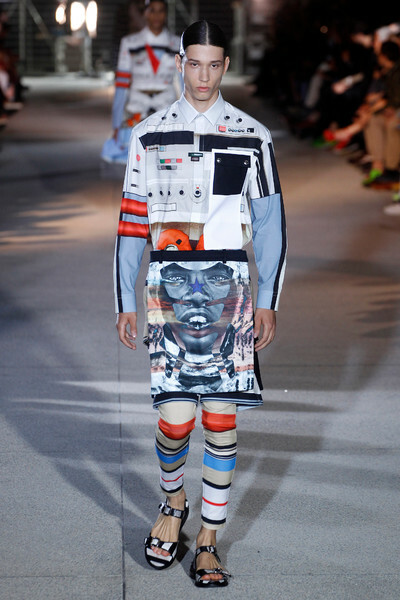 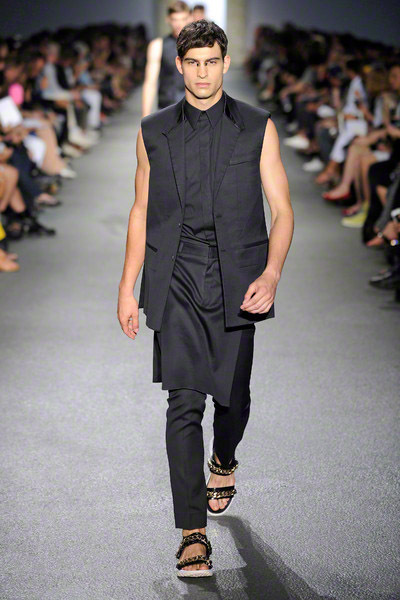 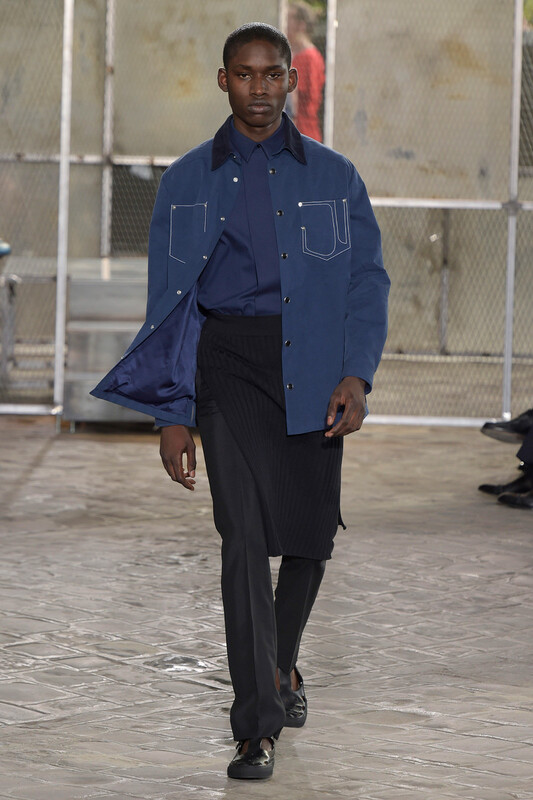 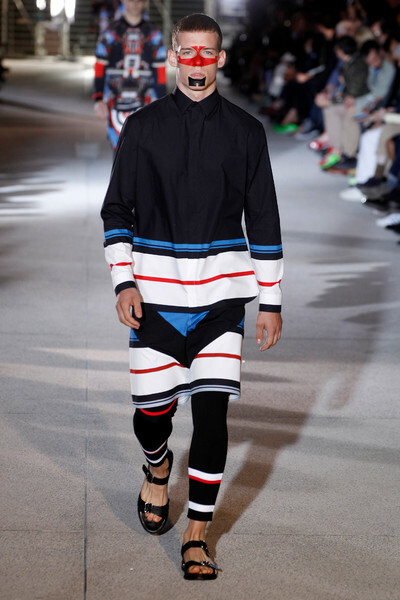 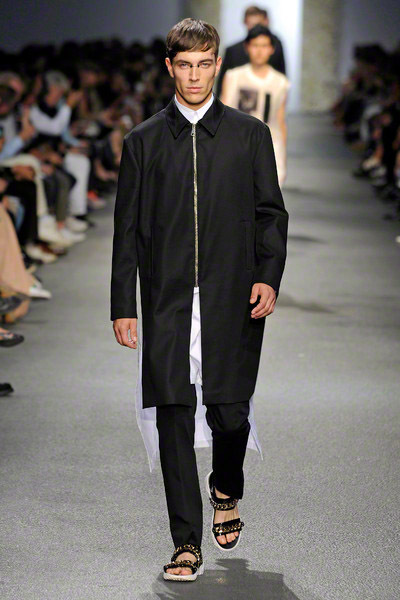 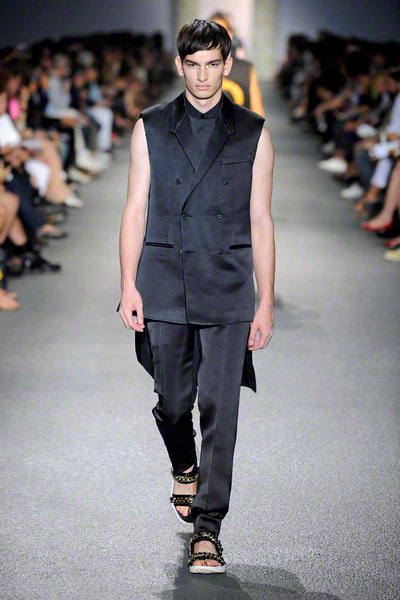 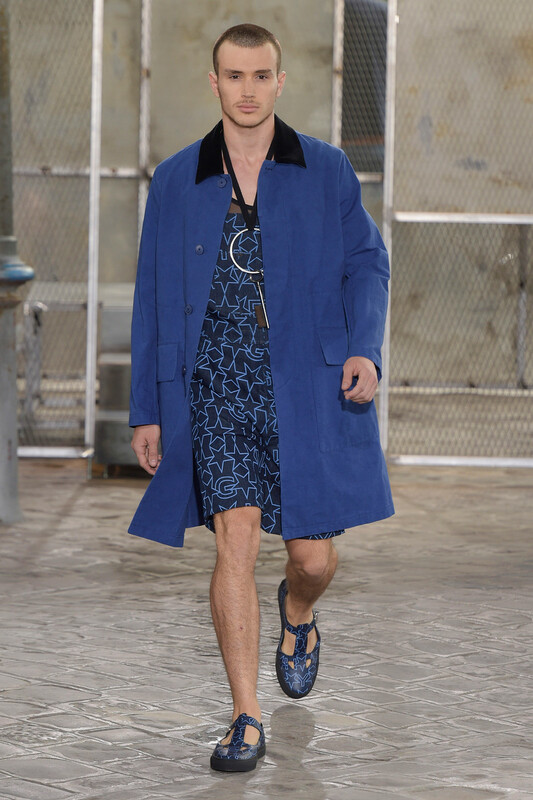 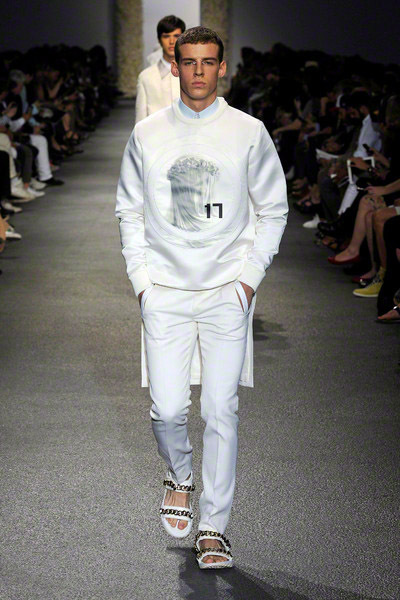 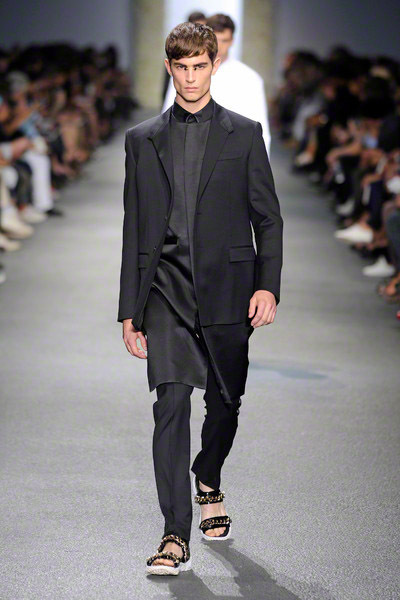 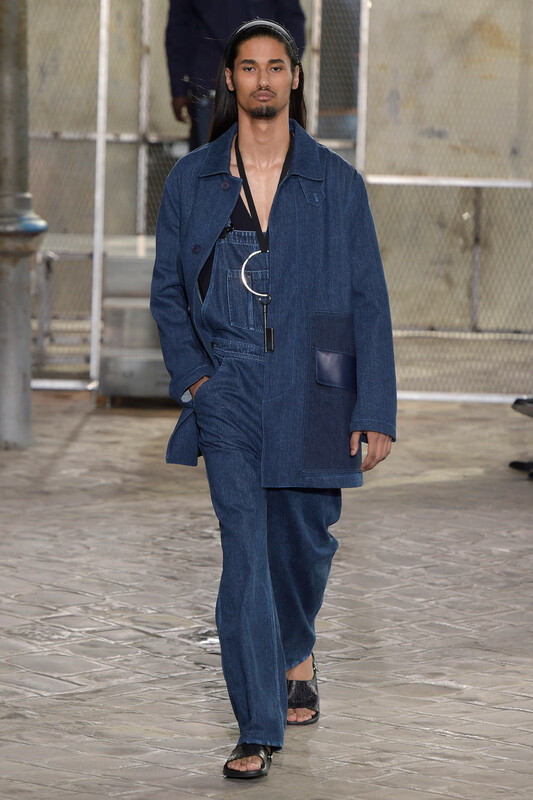 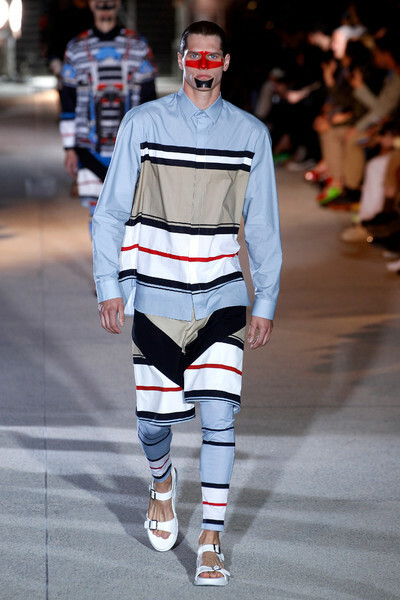 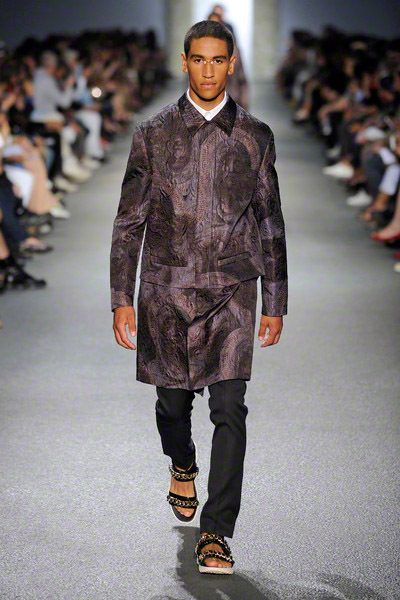 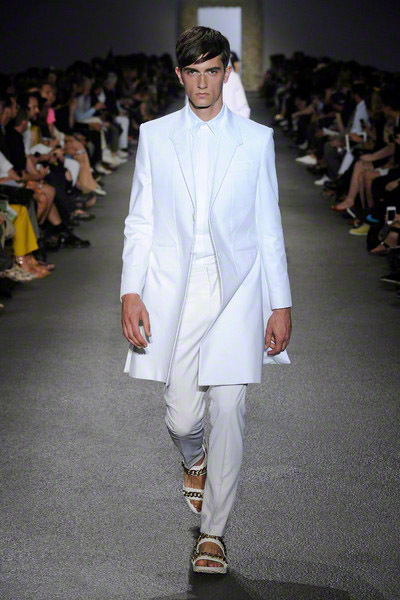 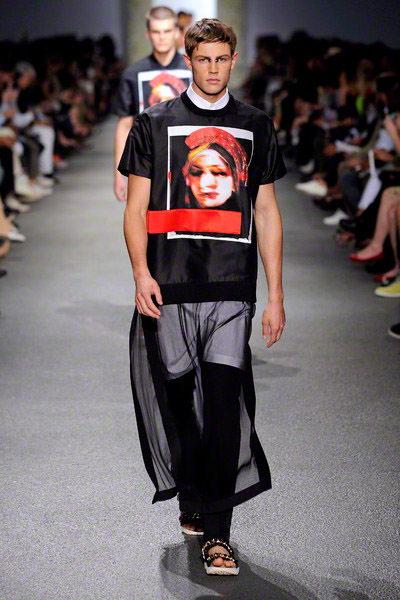 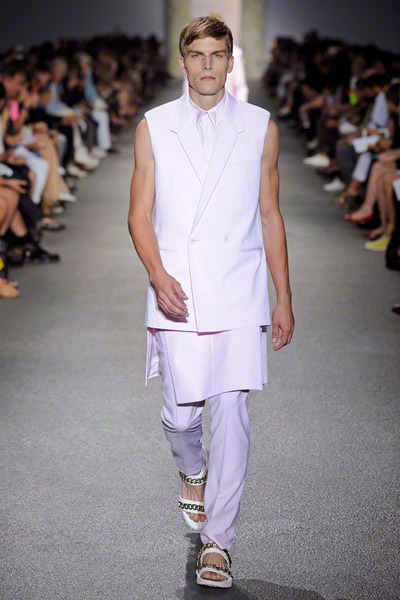 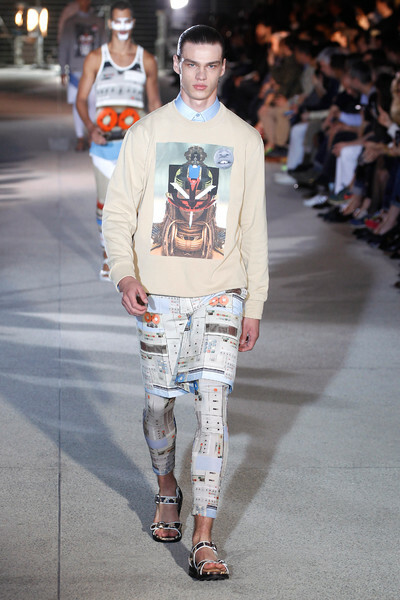 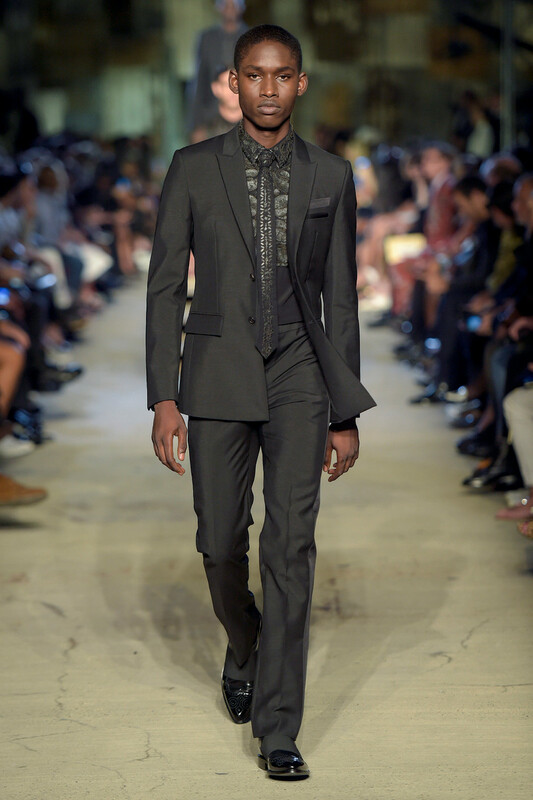 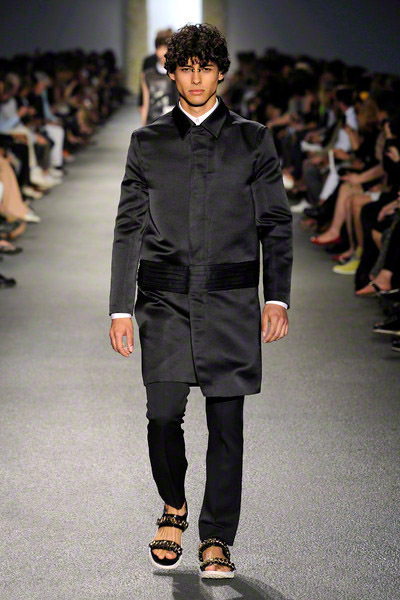 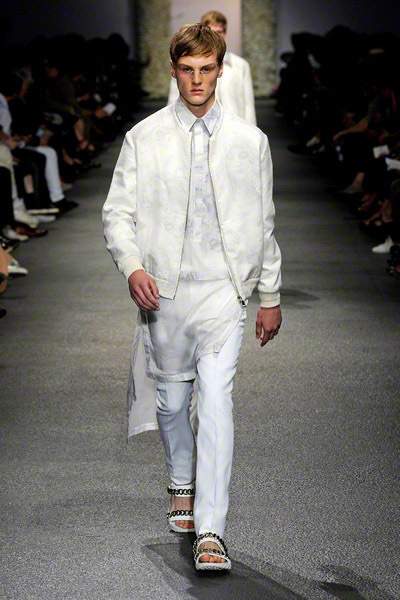 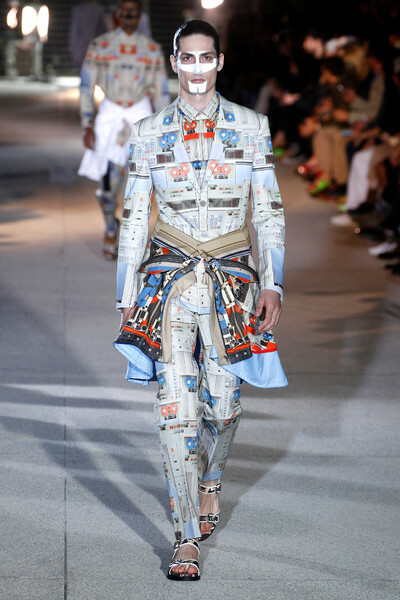 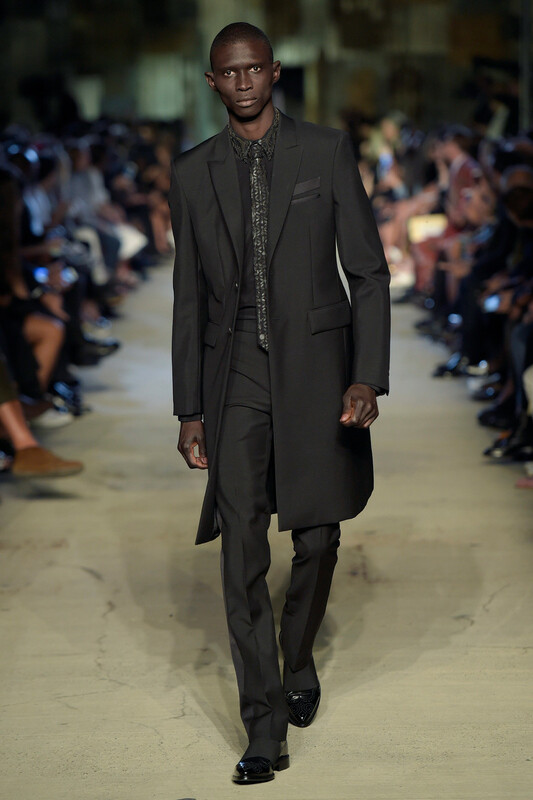 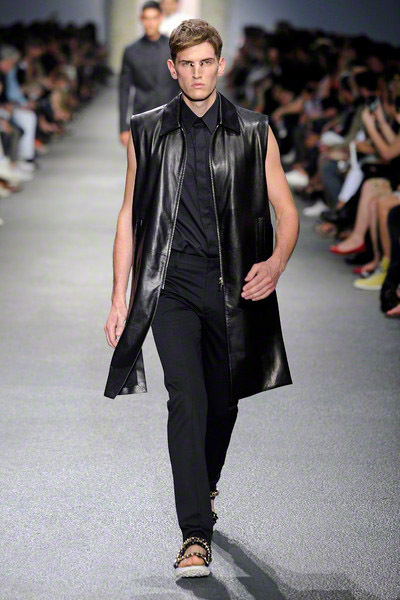 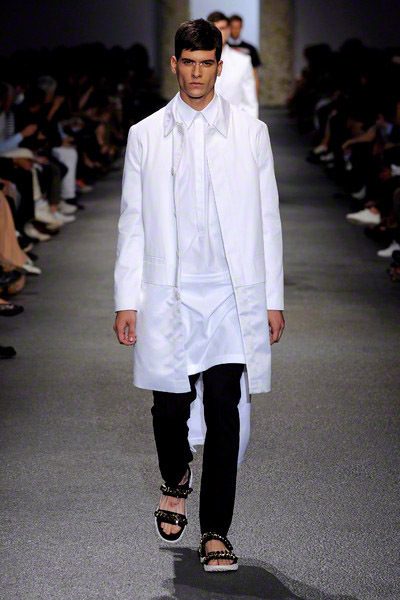 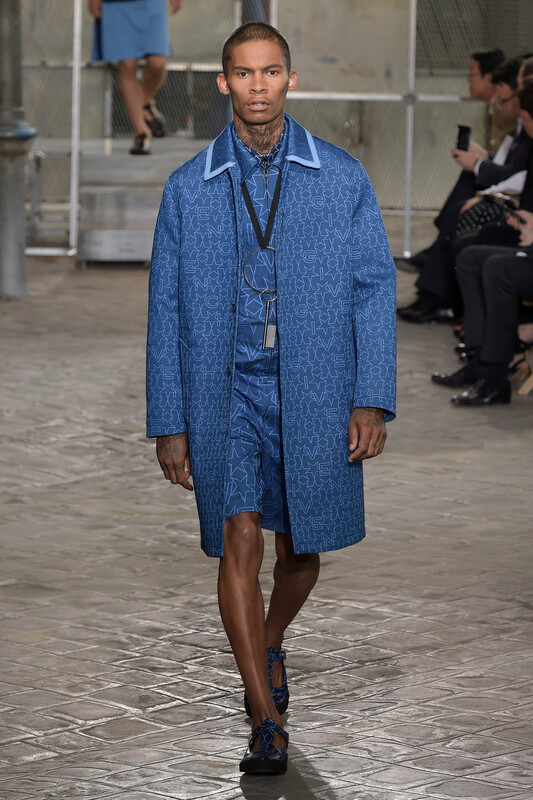 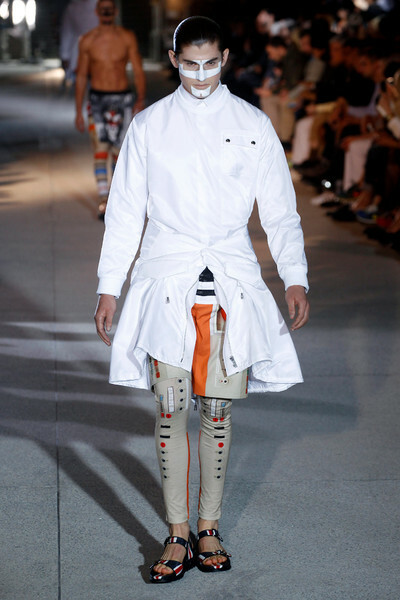 Since he was thinking alot of Africa and Japan, he let those to cultures clash for ss2014. 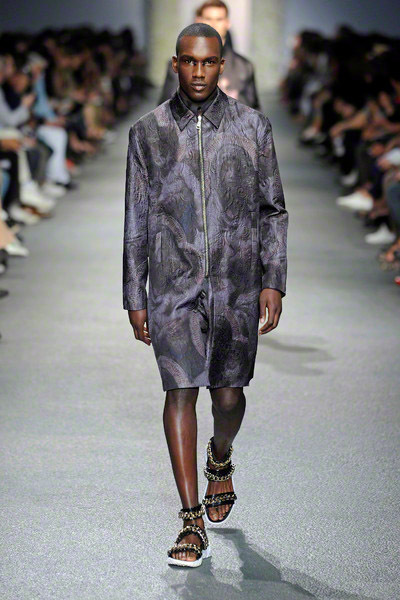 “It’s a car crash of the two cultures —the fragility of Japan and the draping of Africa,” he said to the international fashionpress. 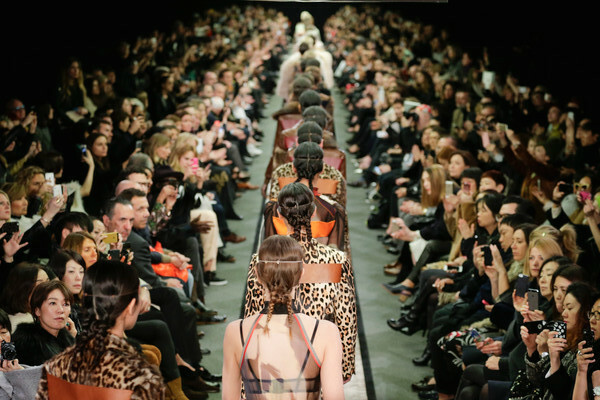 To underline his point he had a smoking pileup of vintage Benzes, BMWs, and Jaguars in the center of the runway. 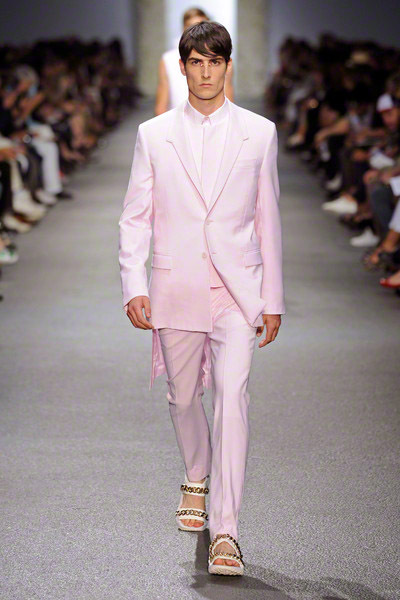 The clothes were elegant with Kimono-inflected suits with twisted lapels, flaring sleeves, and interplays of matte and shine, also with a kamagra online filmy little layer between jacket and pants. 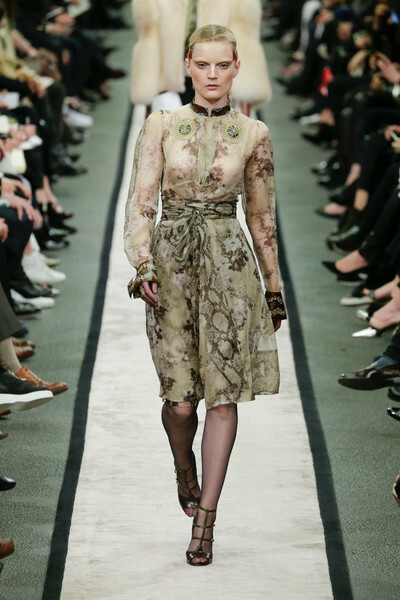 Dresses were draped a hundred different ways: from a ring below the throat to a a rugged leather strap slung over the shoulders like suspenders. 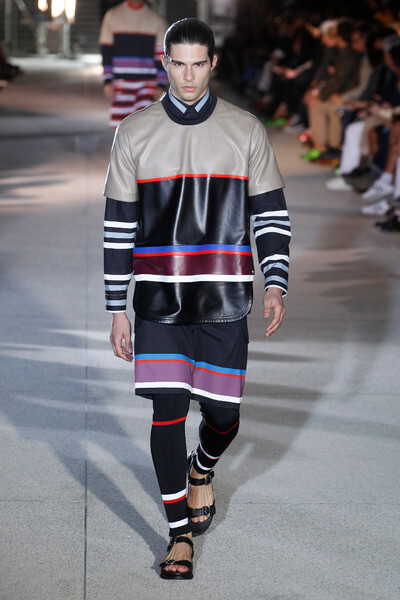 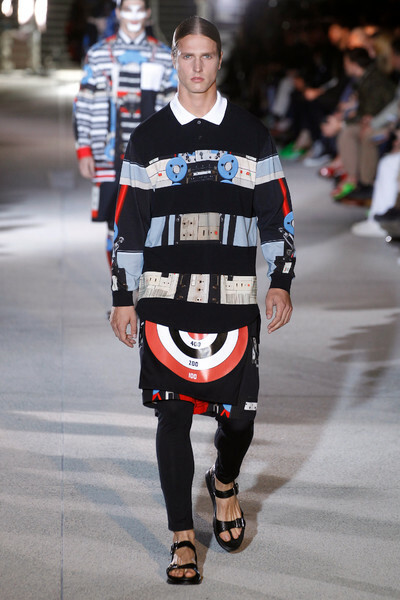 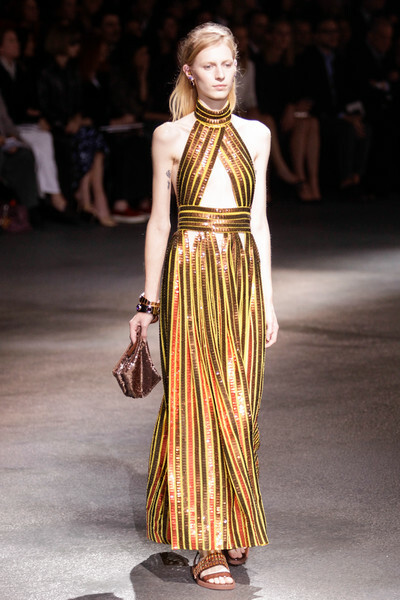 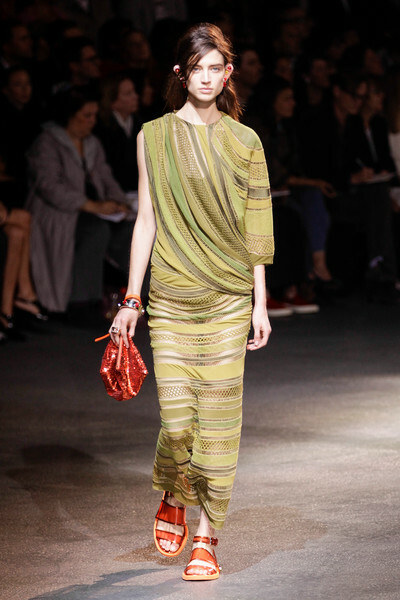 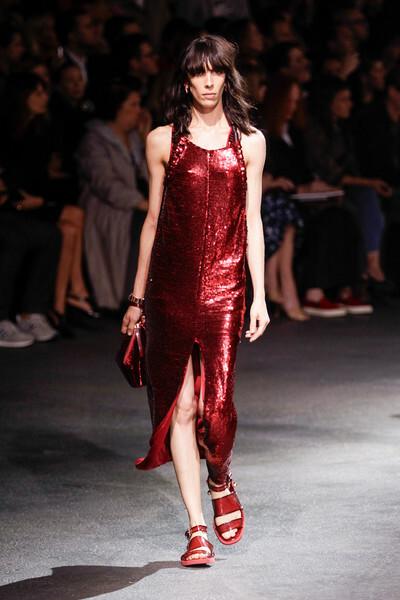 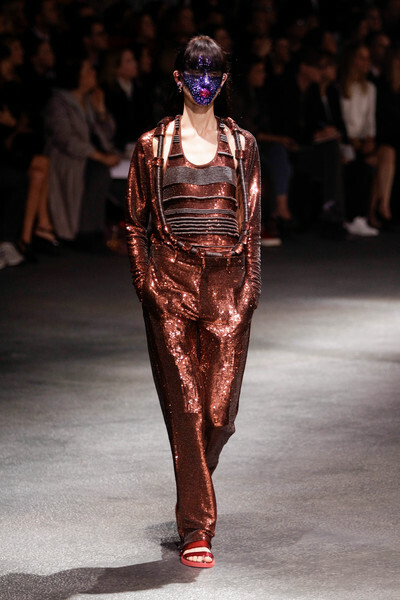 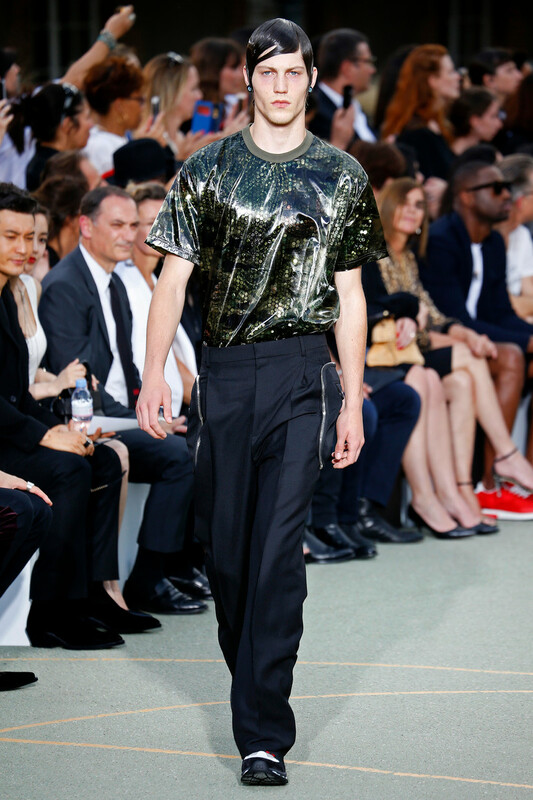 Tisci showed them in stretch jersey, embroidered or pleated and strewn with sequins. 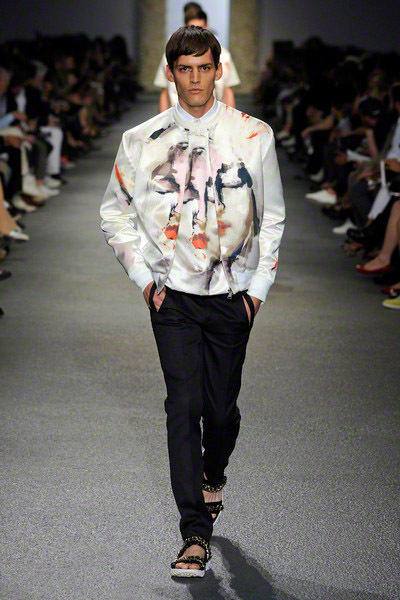 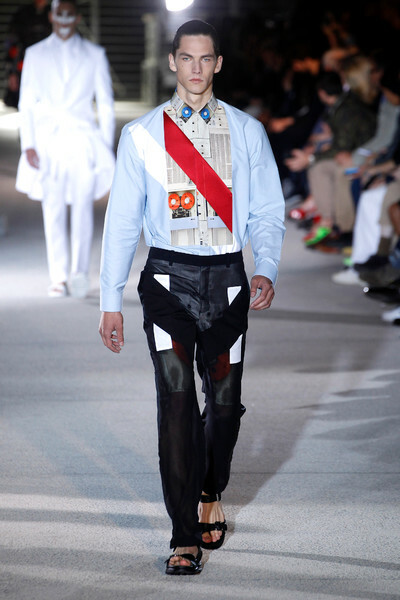 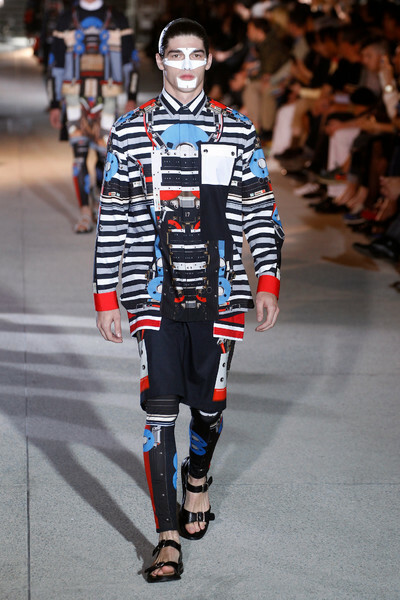 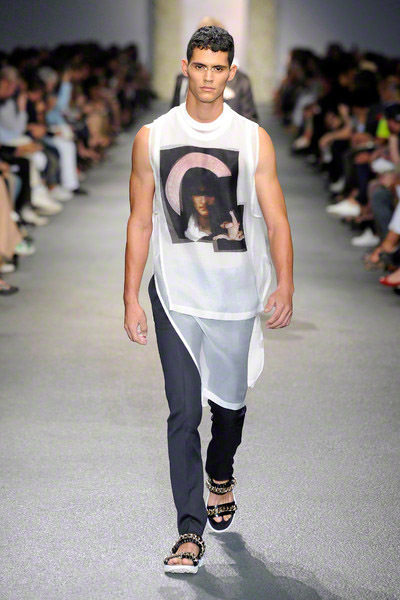 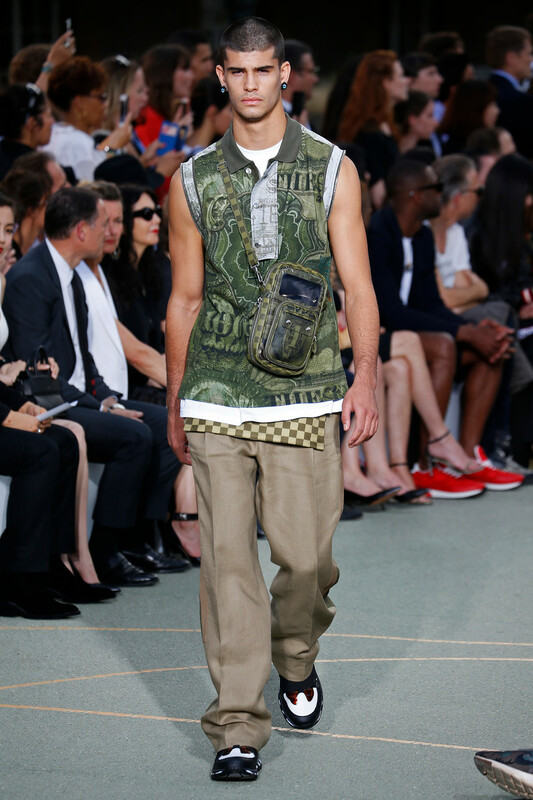 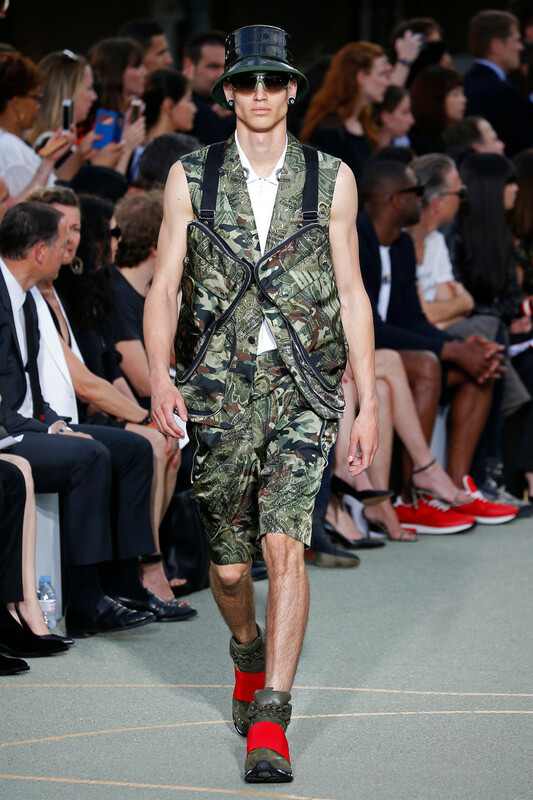 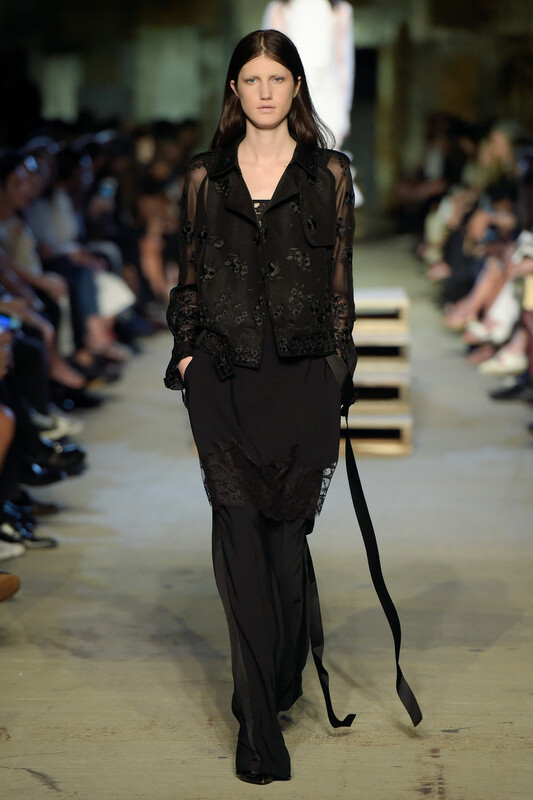 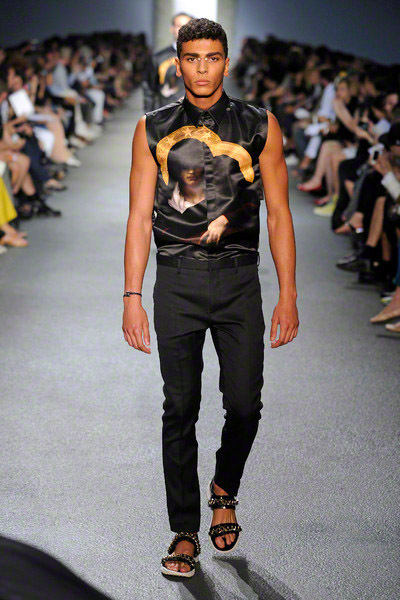 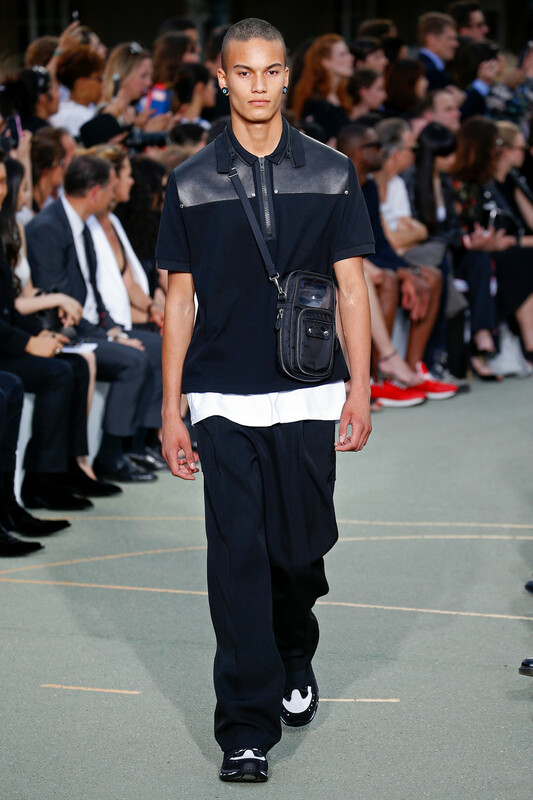 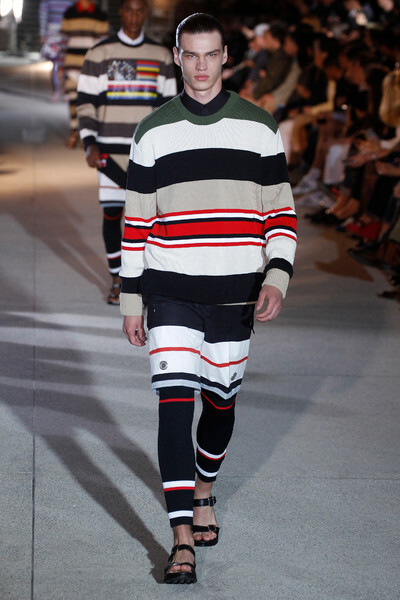 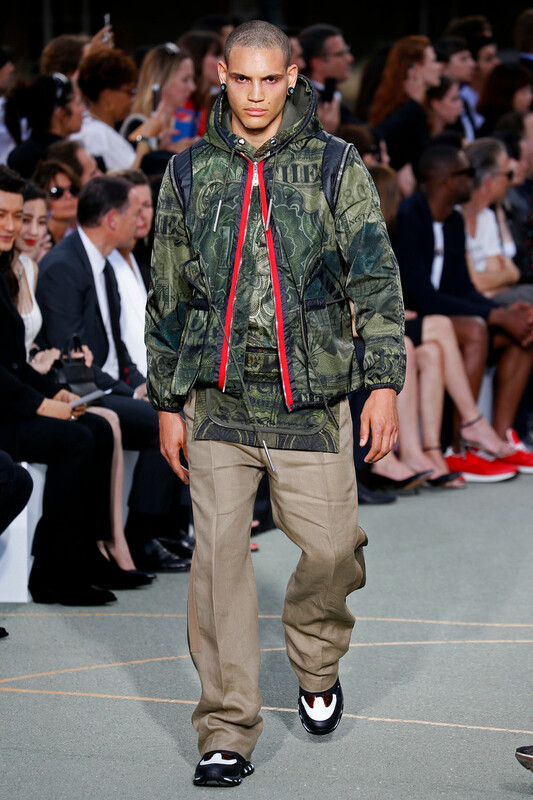 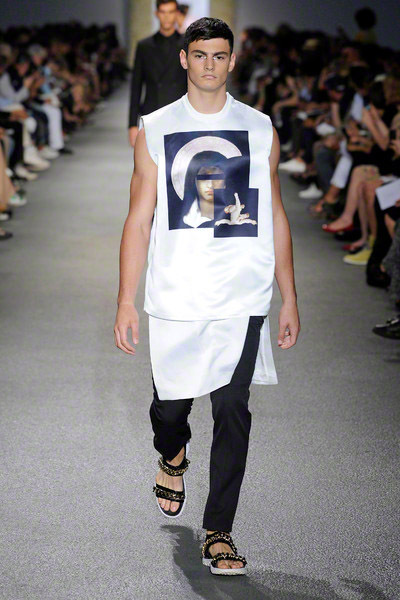 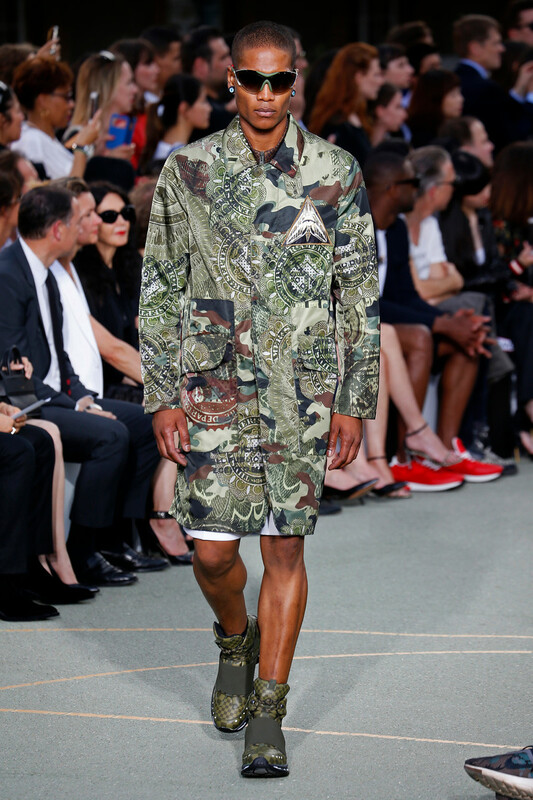 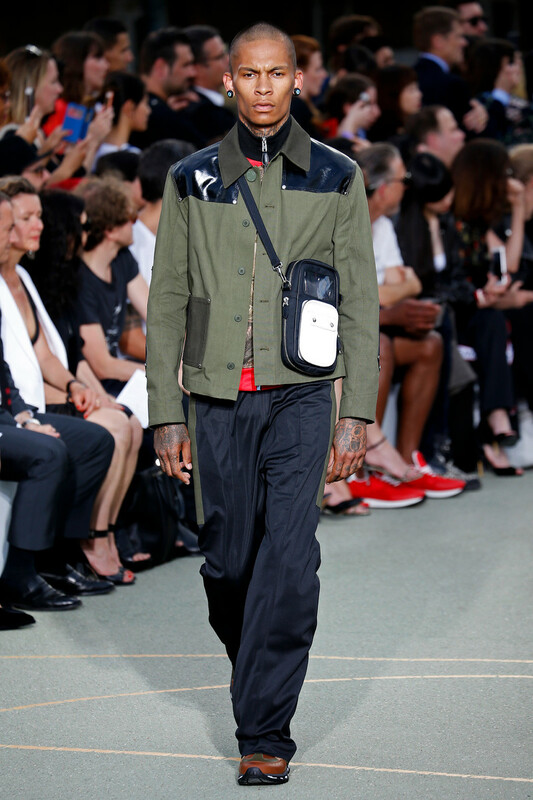 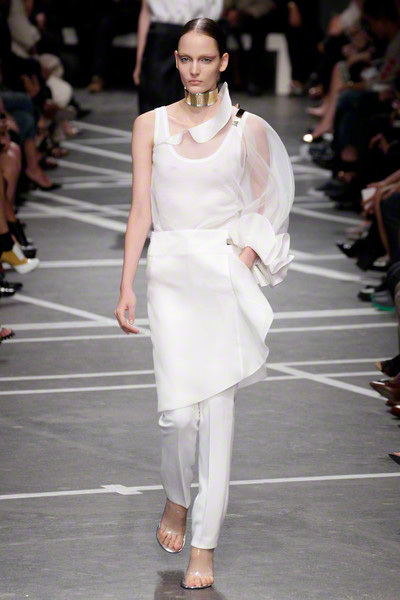 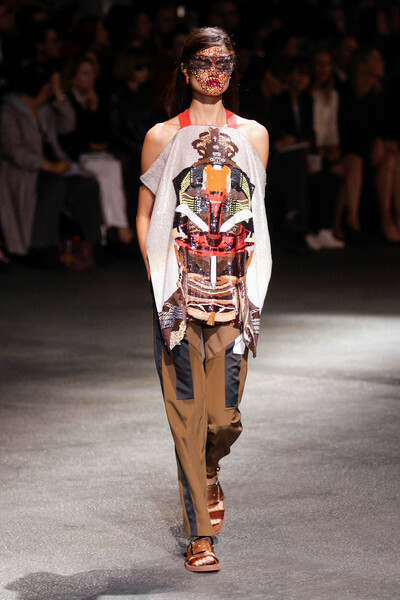 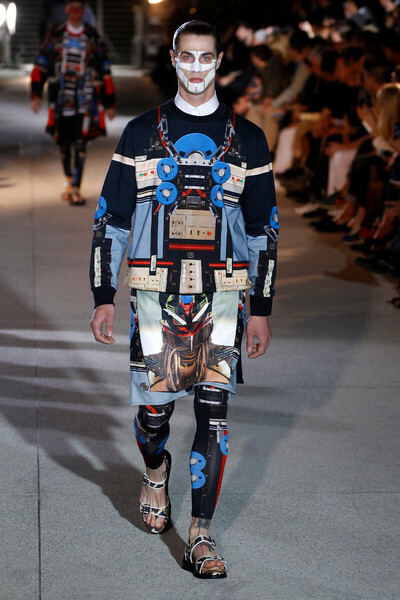 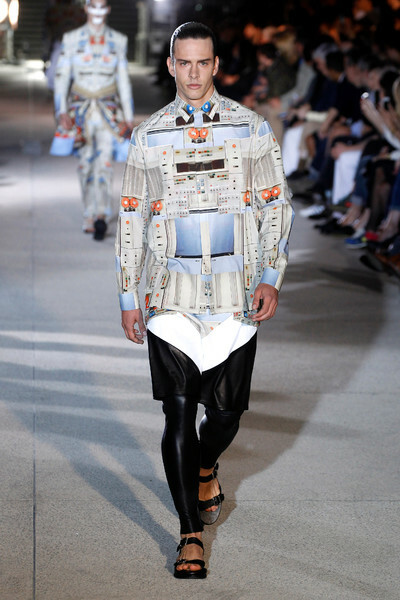 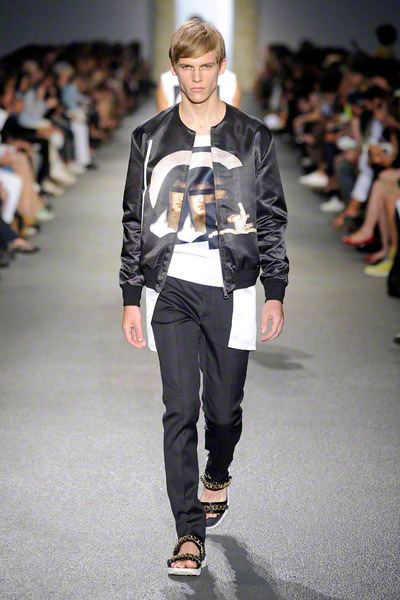 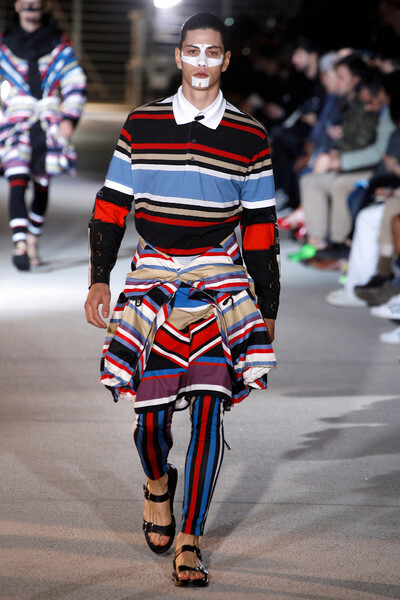 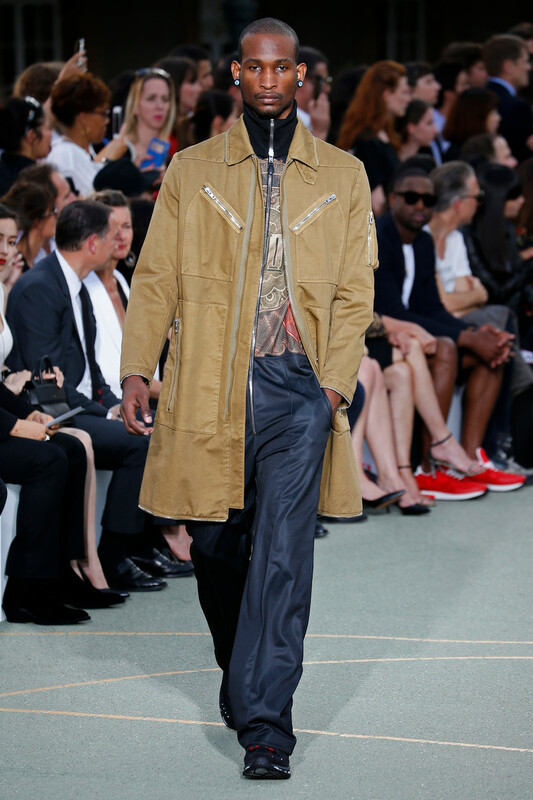 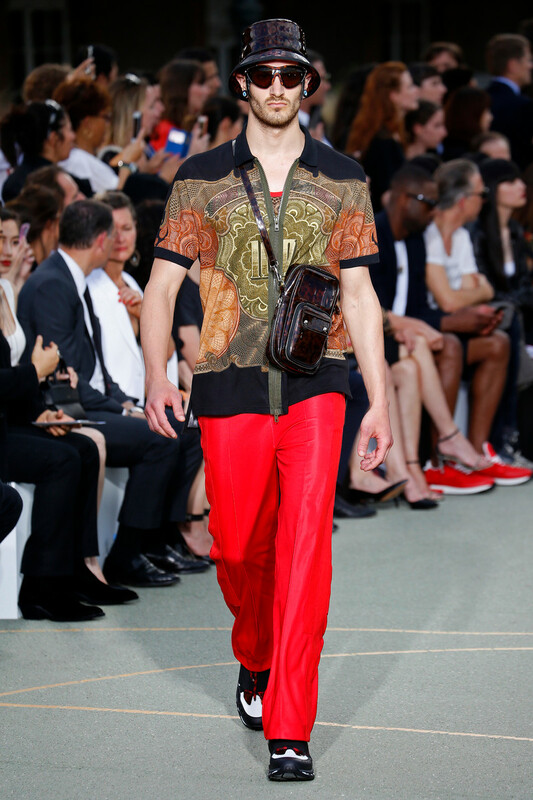 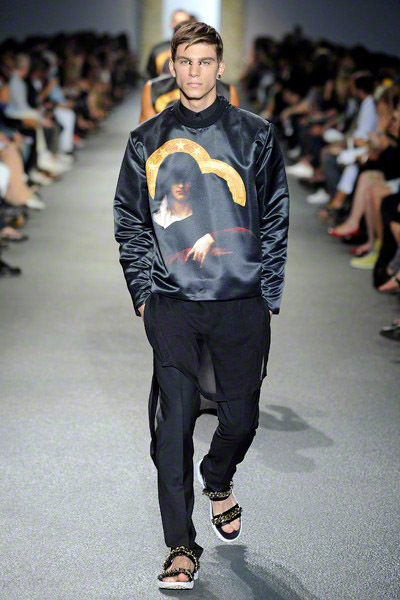 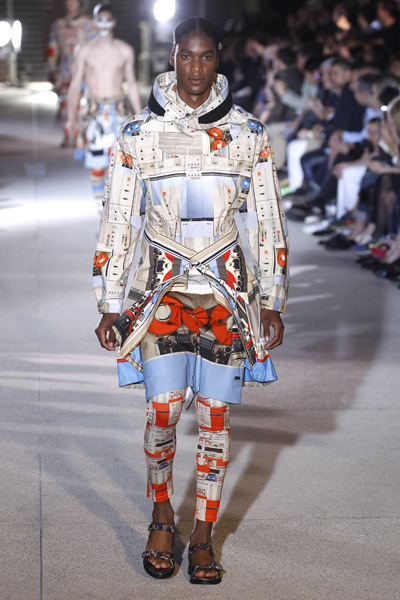 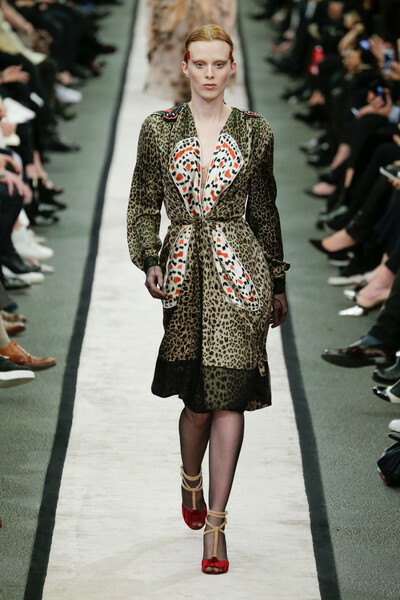 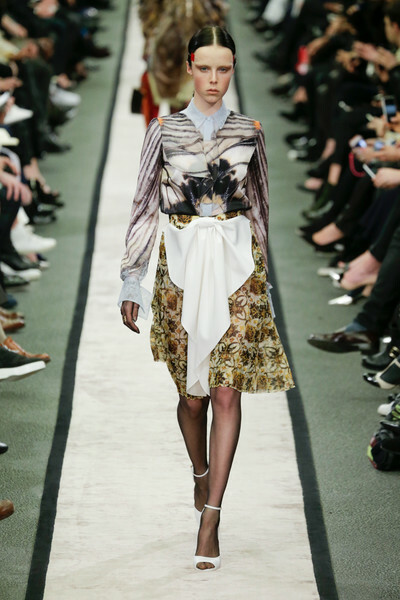 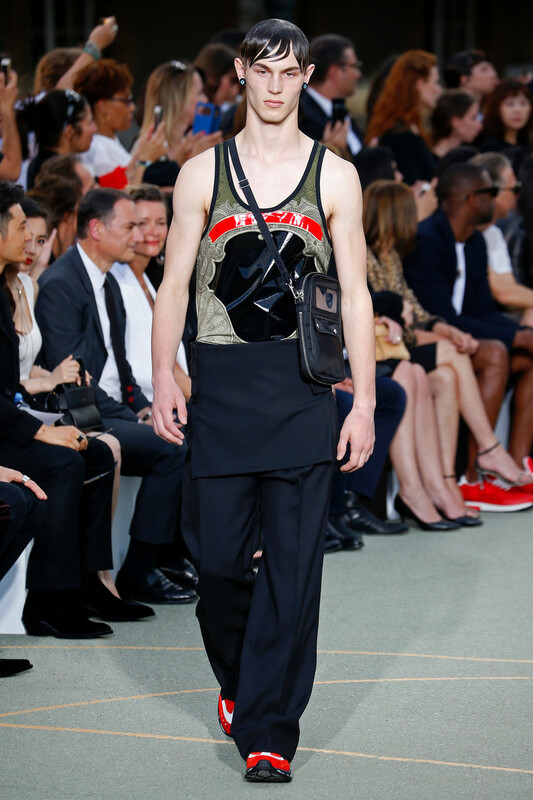 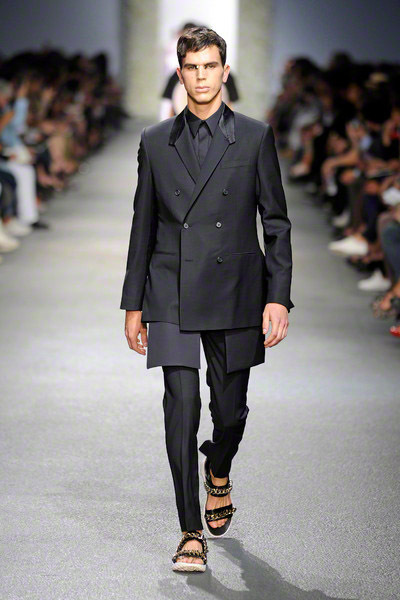 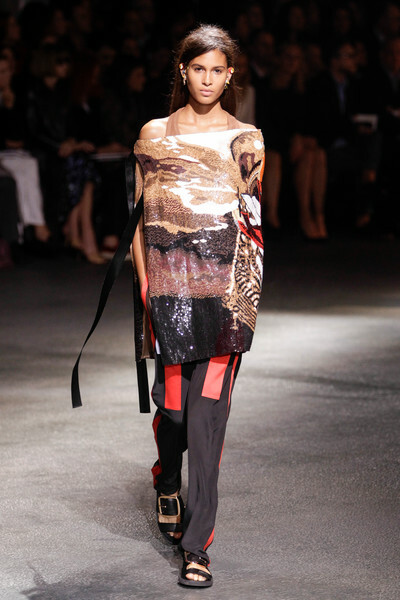 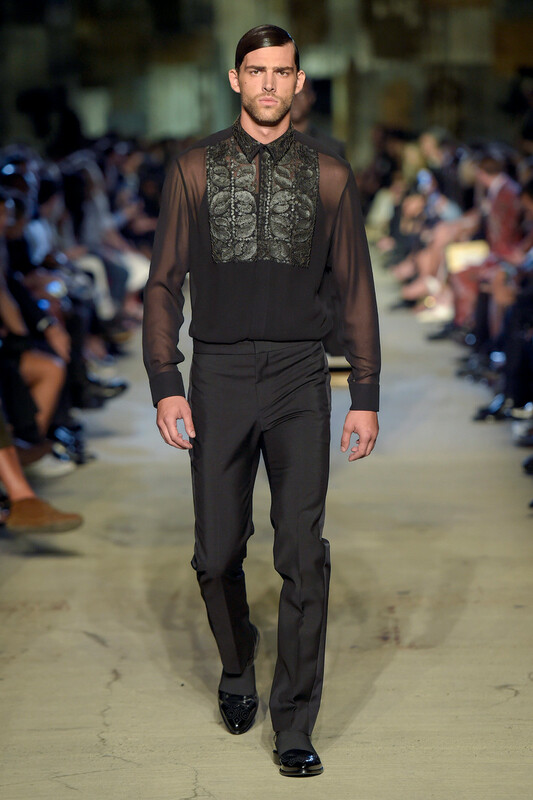 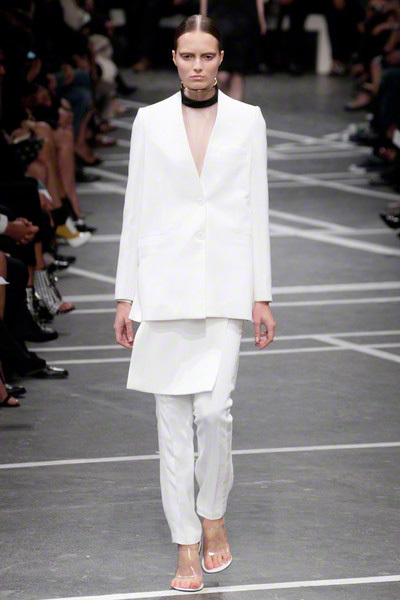 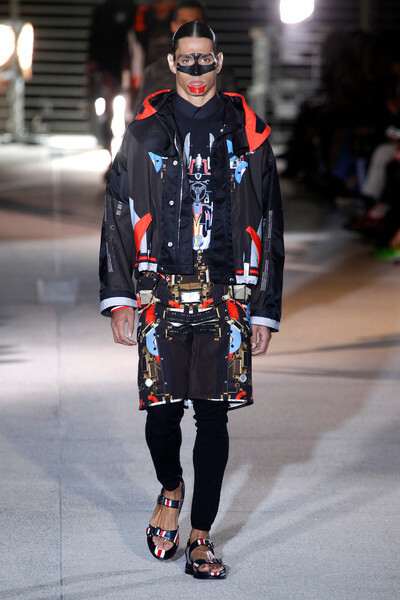 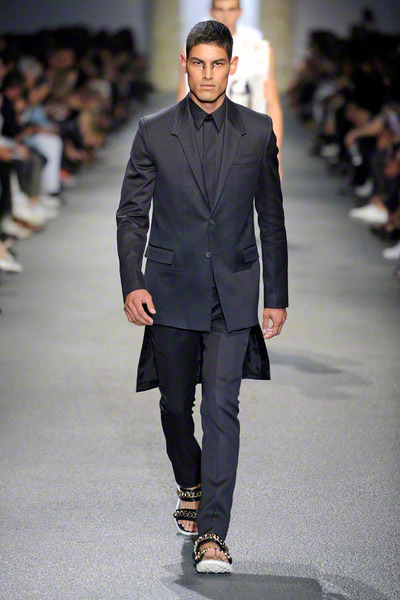 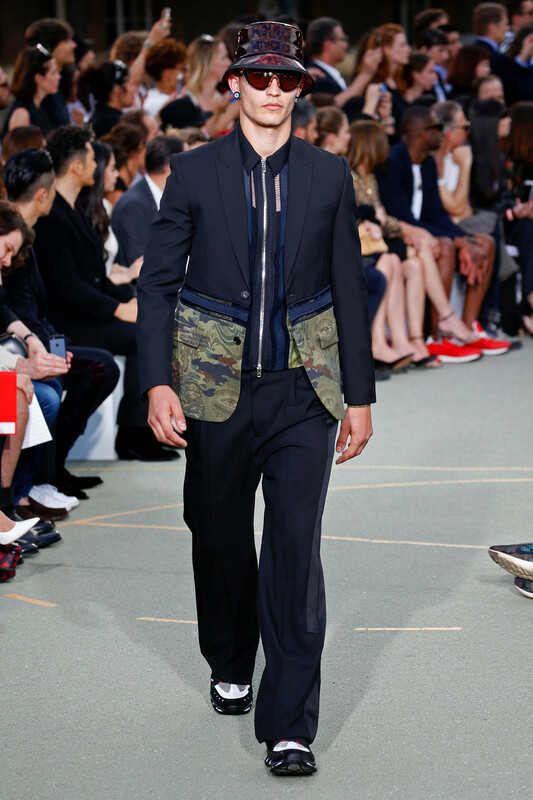 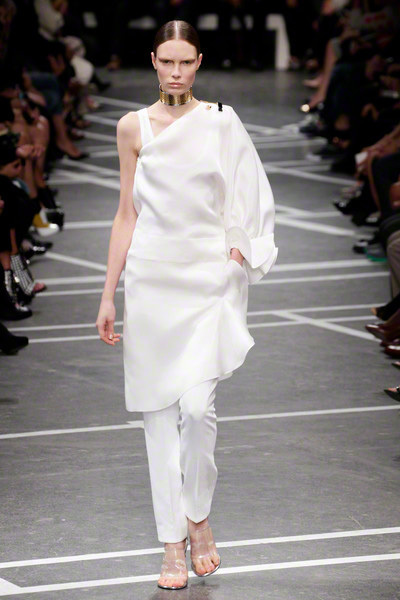 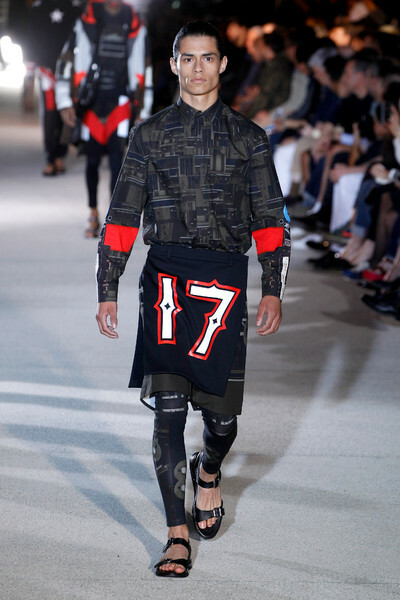 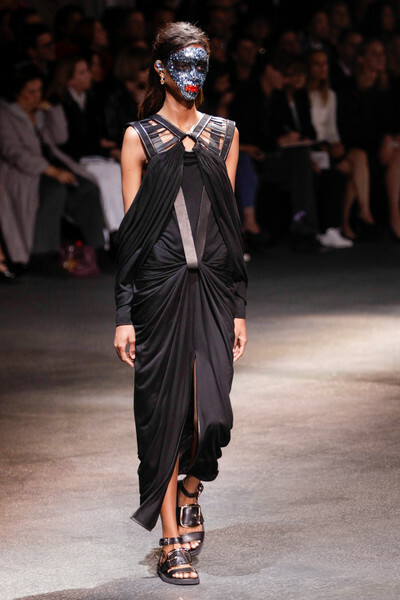 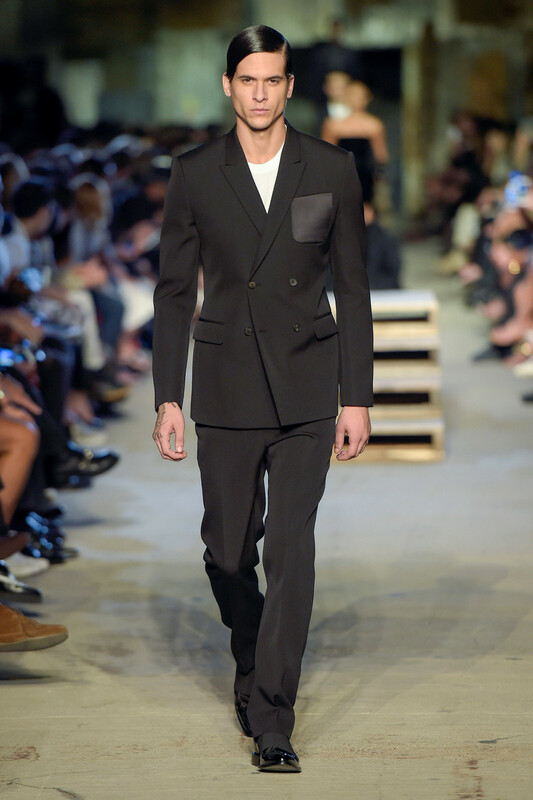 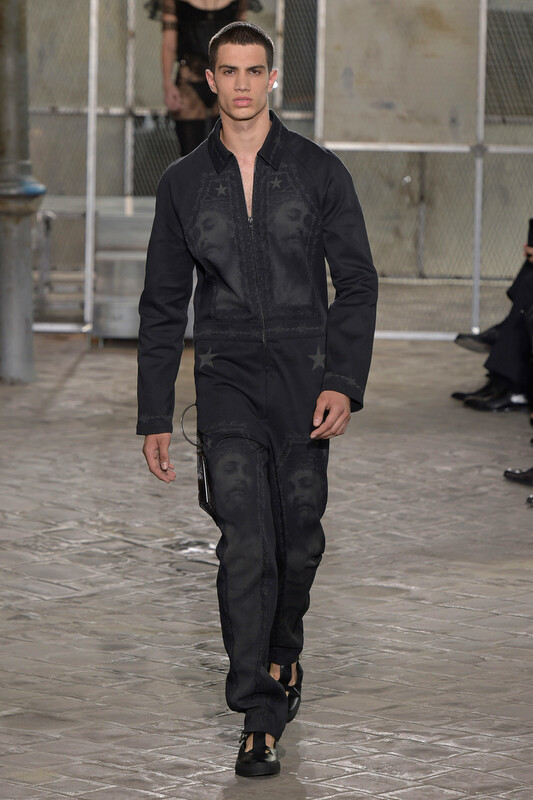 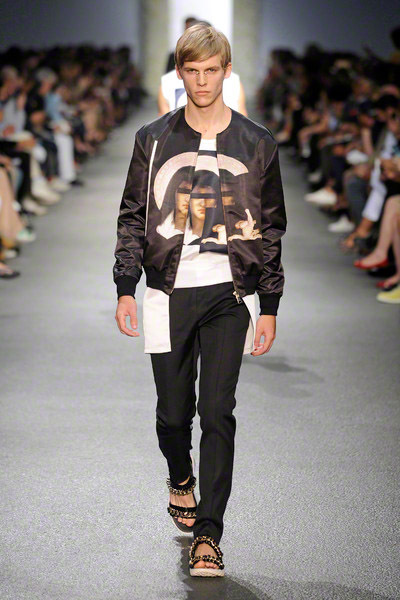 For the Givenchy Spring/Summer 2014 collection, Riccardo Tisci took the audience upon a journey from America to Africa. 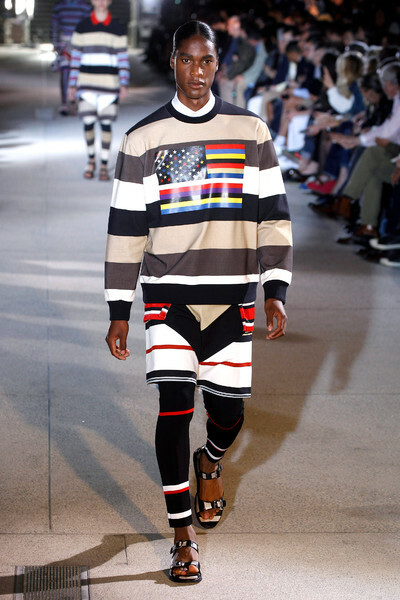 From L.A. skaters, nerds obsessed with vintage 1970s computers, electronics’ loudspeakers to African ethnography, the show was about mixing colors, shapes, designs and prints. 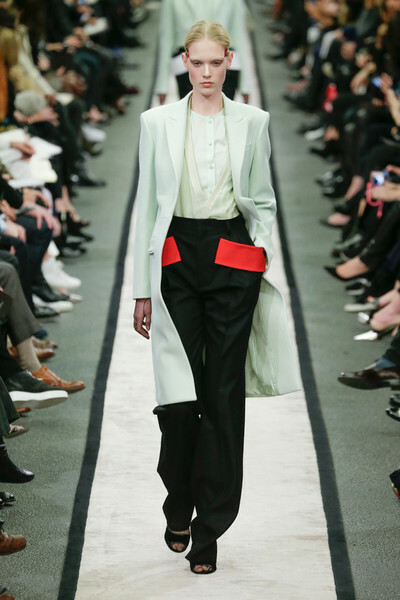 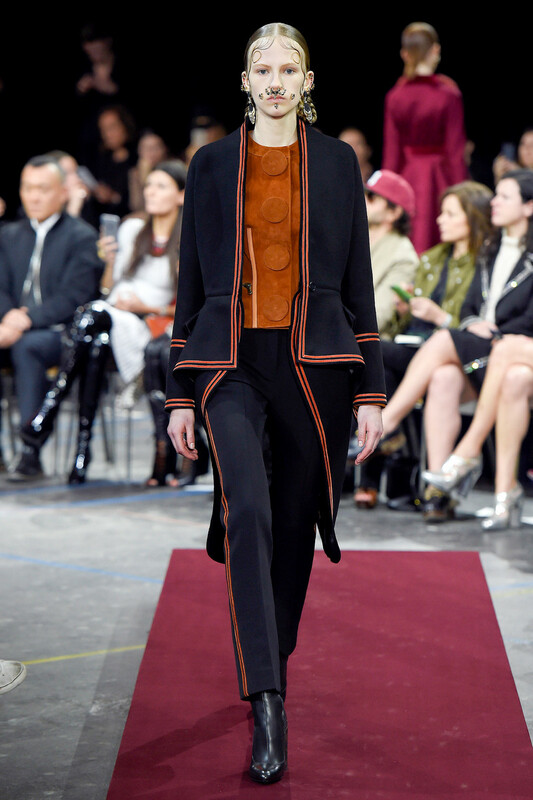 Colorful silhouettes exude a sporty elegance and a freedom of layering with contrasting elements. 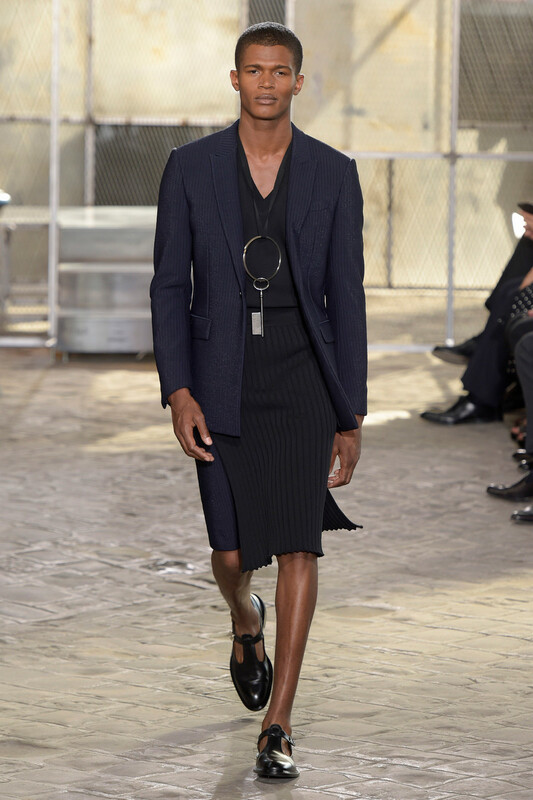 Capsules are regular size and easy to swallow, and I like that the jar has screw cap. 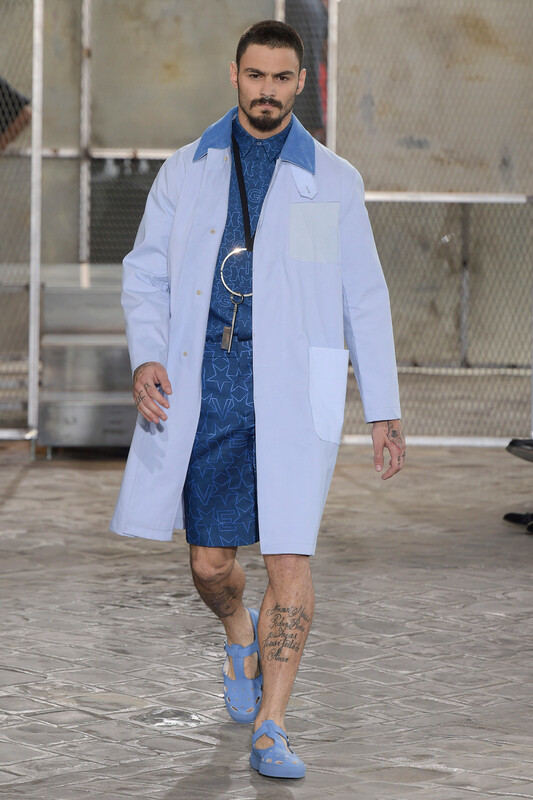 Cheap fast levitra? 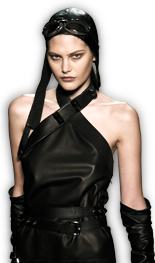 This website provides highest quality generic medicines, which are shipped directly from India. 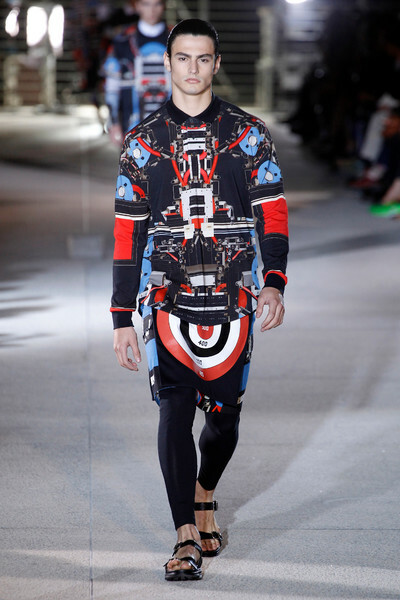 Bright and light computerized motifs gave a dynamic and graphic take to prints. 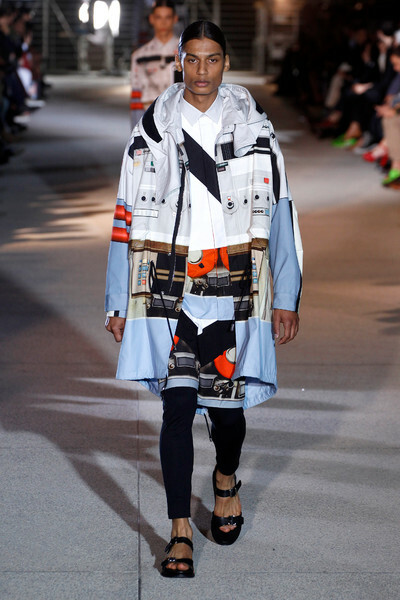 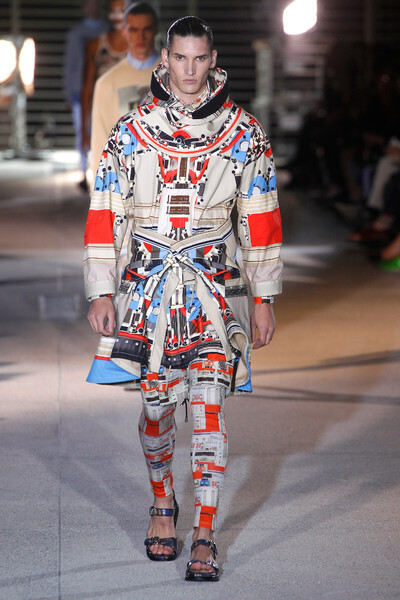 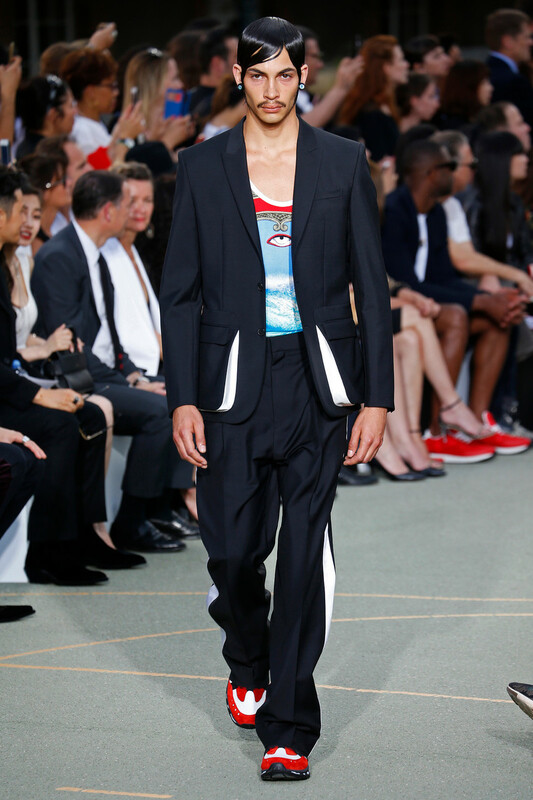 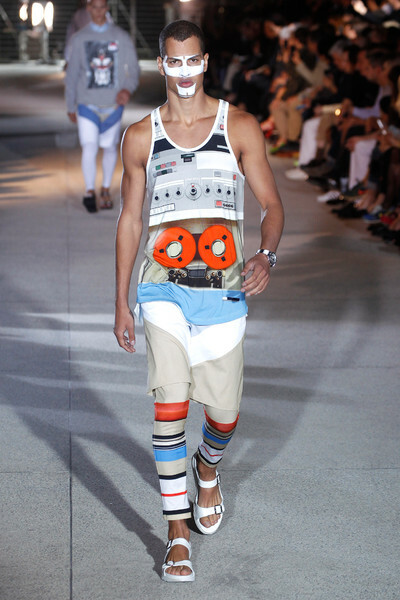 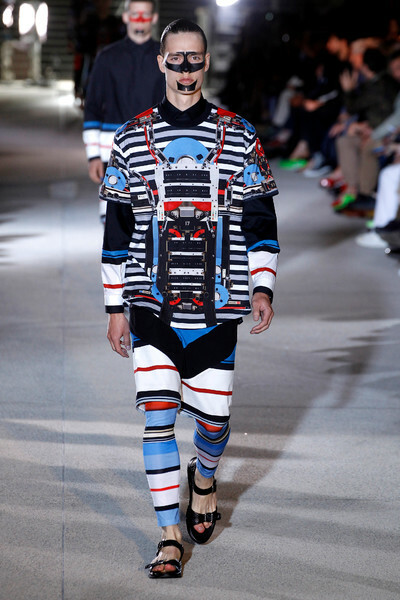 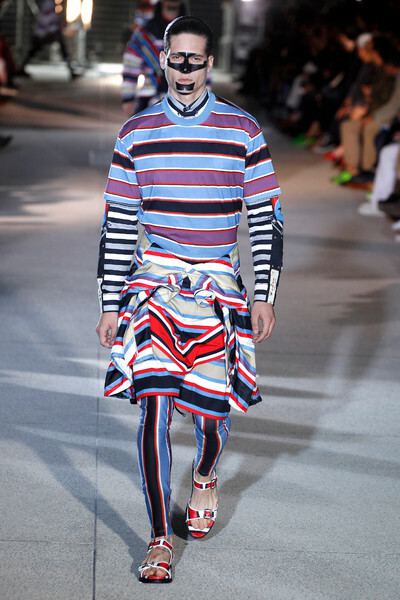 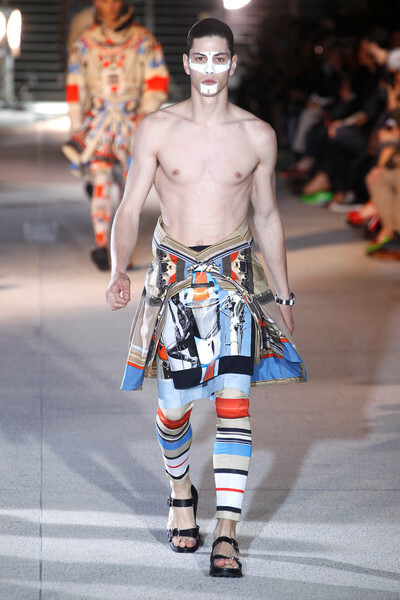 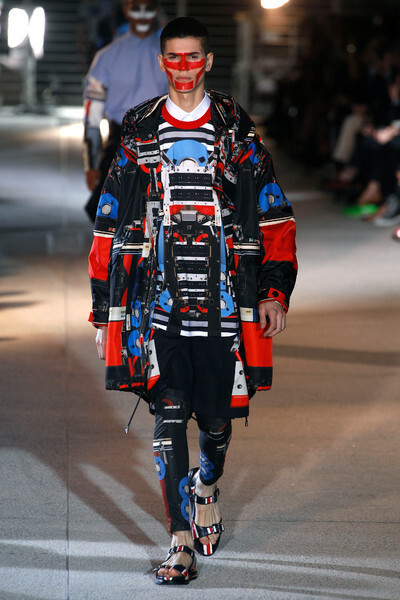 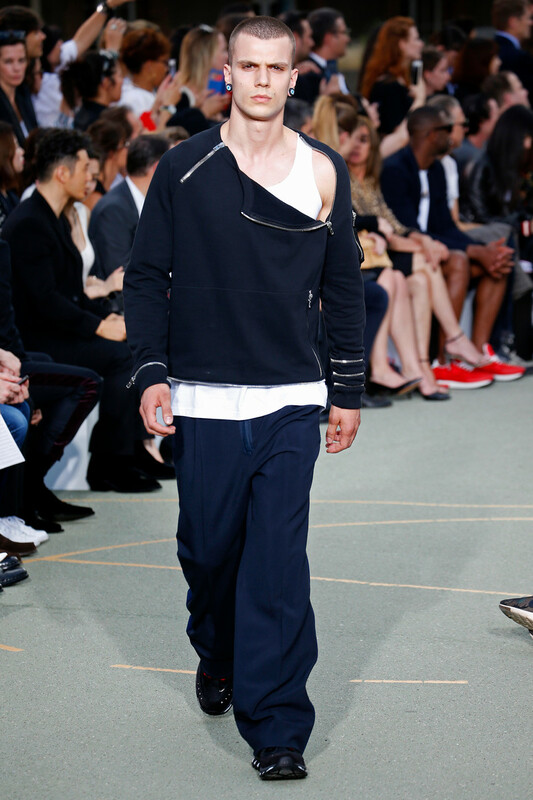 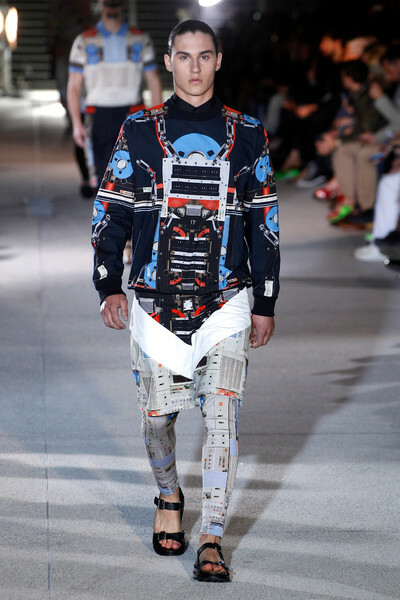 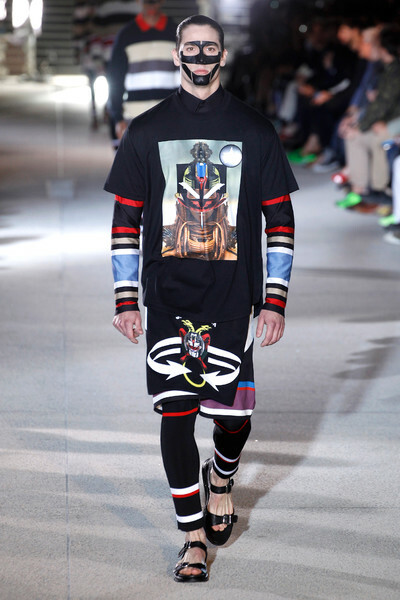 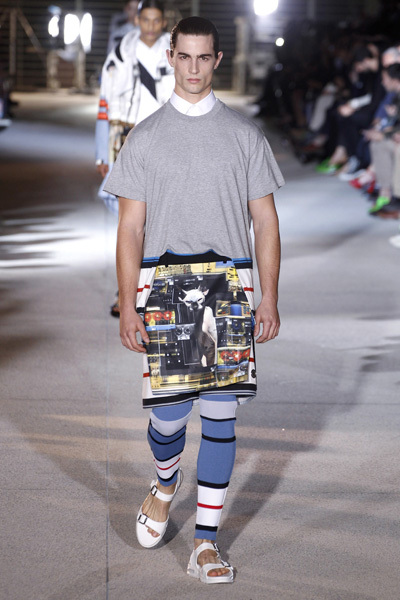 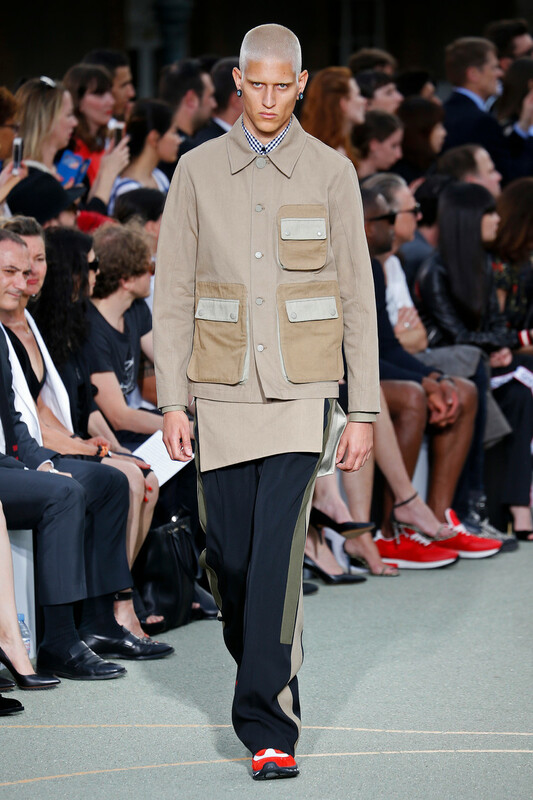 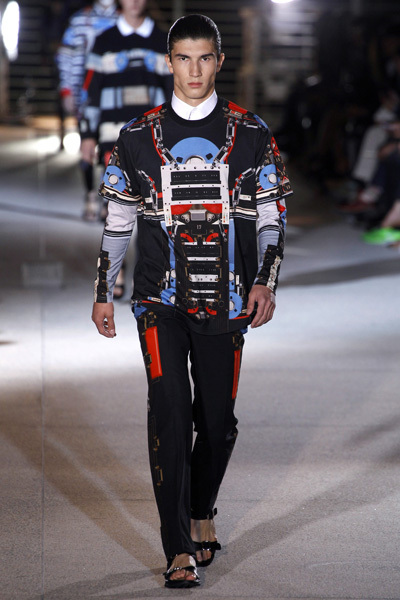 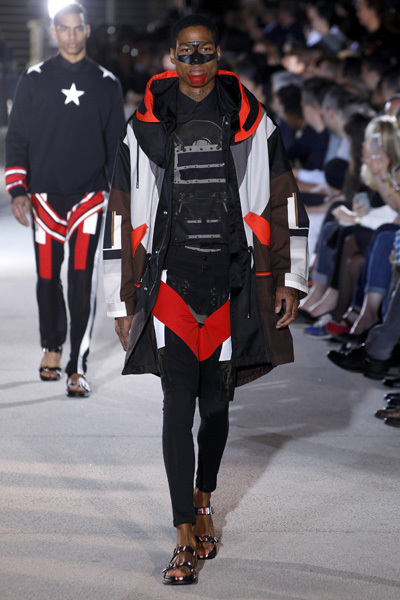 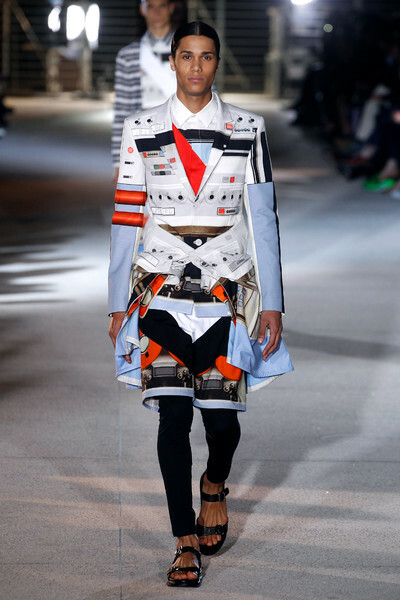 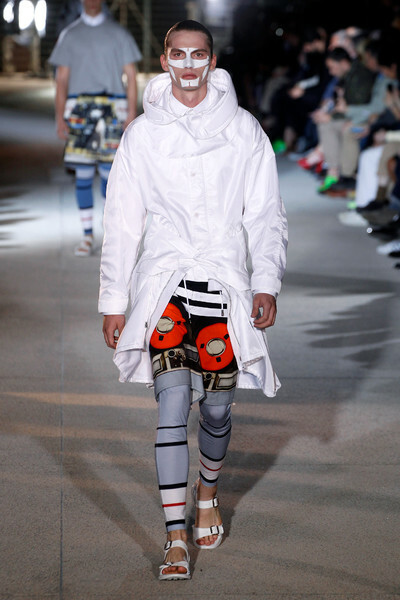 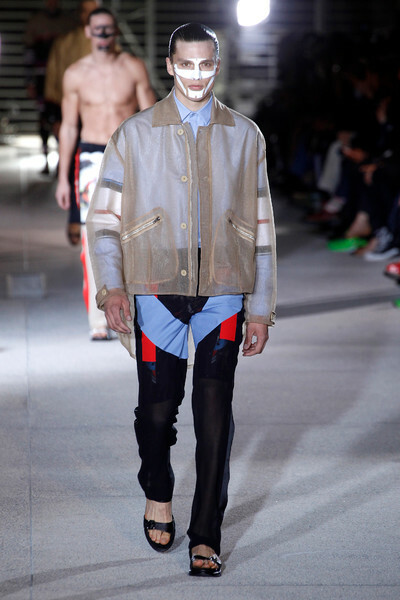 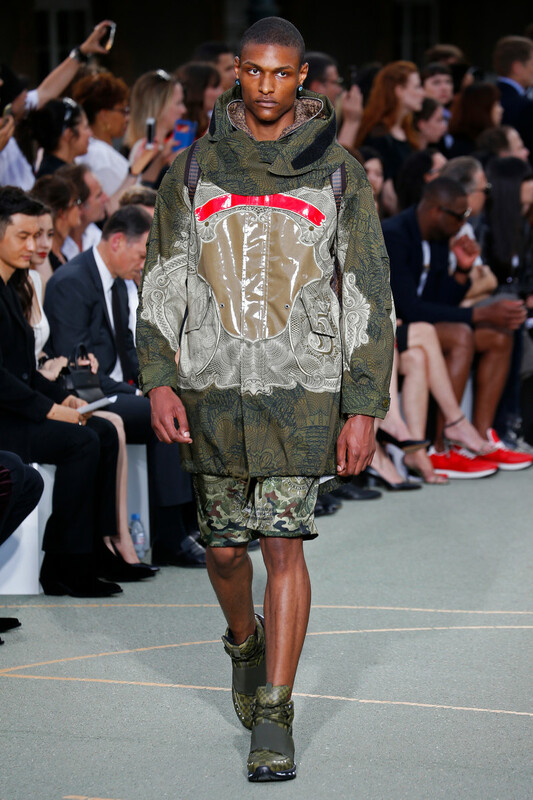 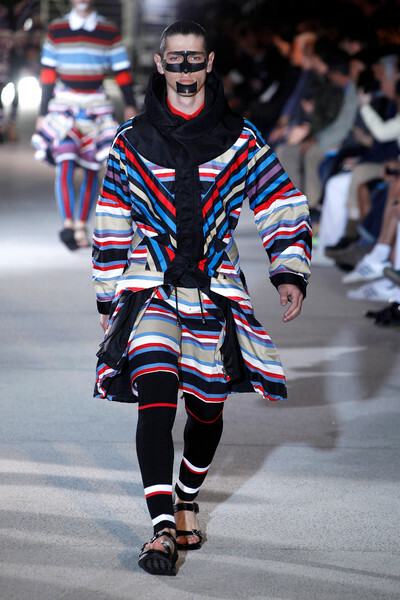 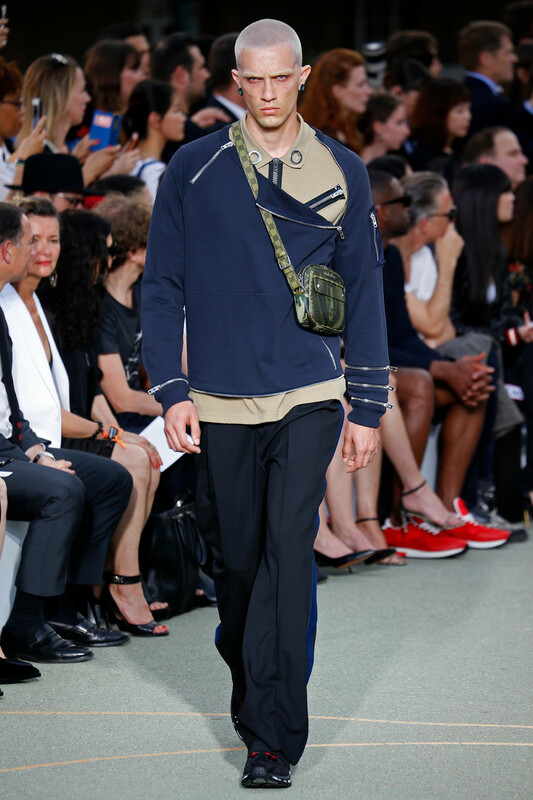 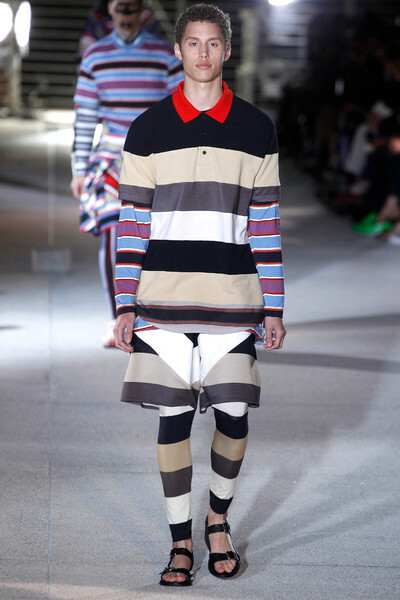 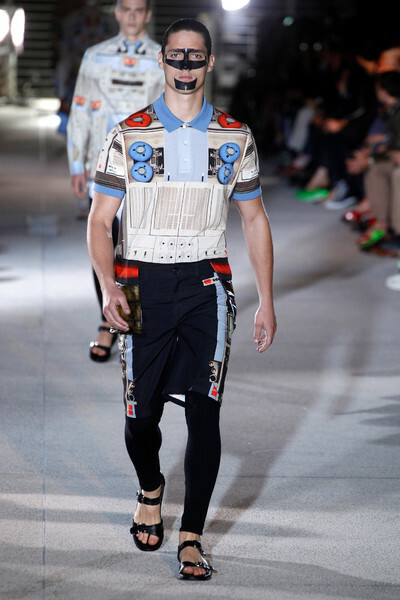 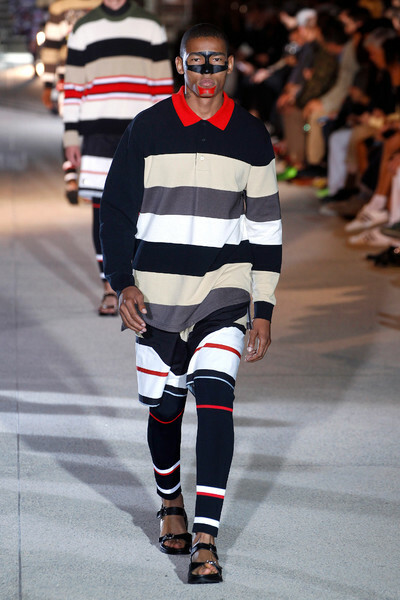 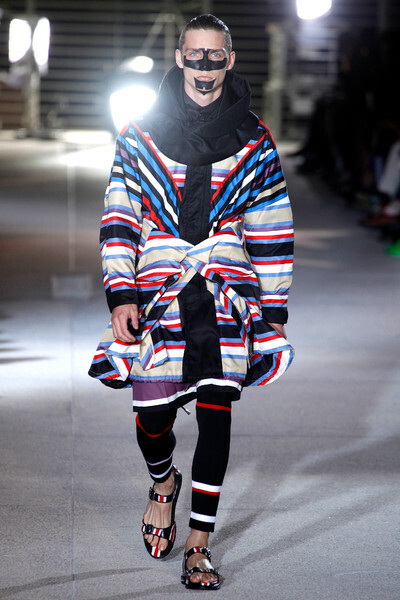 They were merged with an influence of Masaï and Zulu bold iconography, layered together with the energy of sportswear. 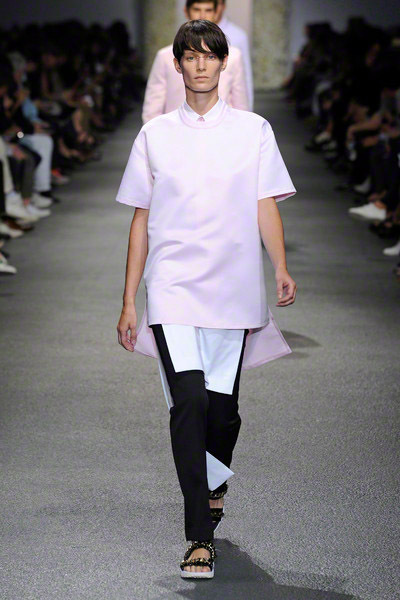 Oversized shirts, polos, parkas, pleated bermudas and leggings alternate with fitted tailoring. 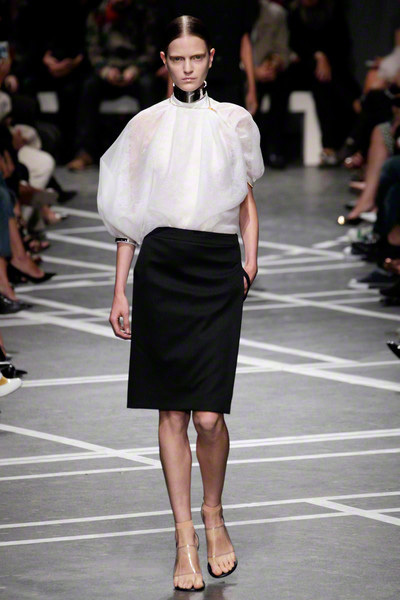 Classic cotton fabrics such as poplin, jersey, gabardine and piqué contrast with thick nylon, silk organza or georgette, printed leather, satin and nylon knitted mesh. 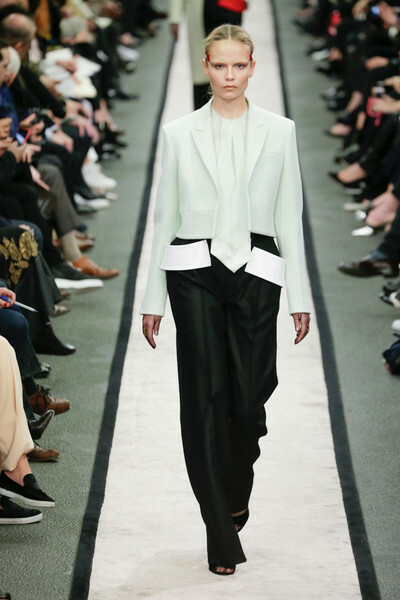 Neo-tuxedo pants in plain or printed cotton poplin are layered with silk georgette demonstrating masterful construction. 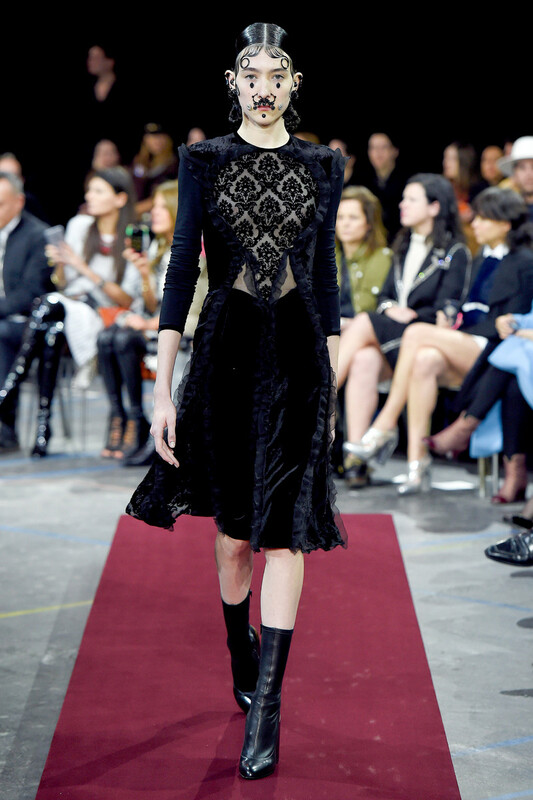 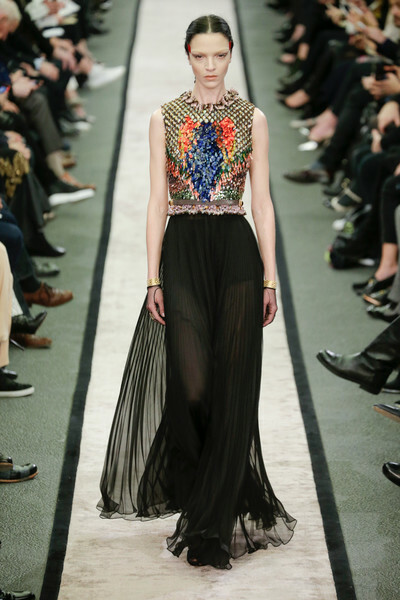 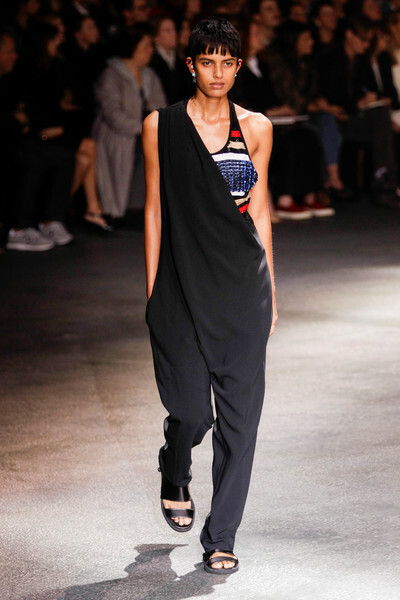 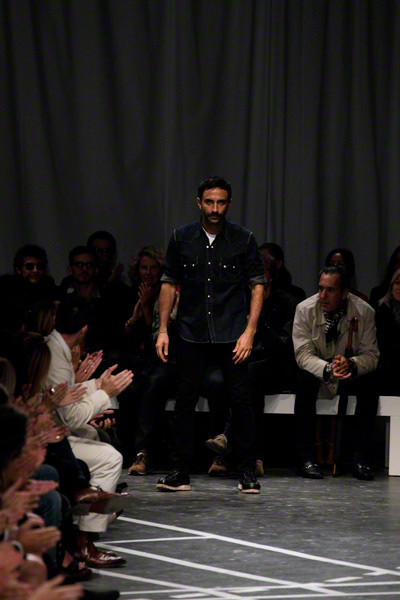 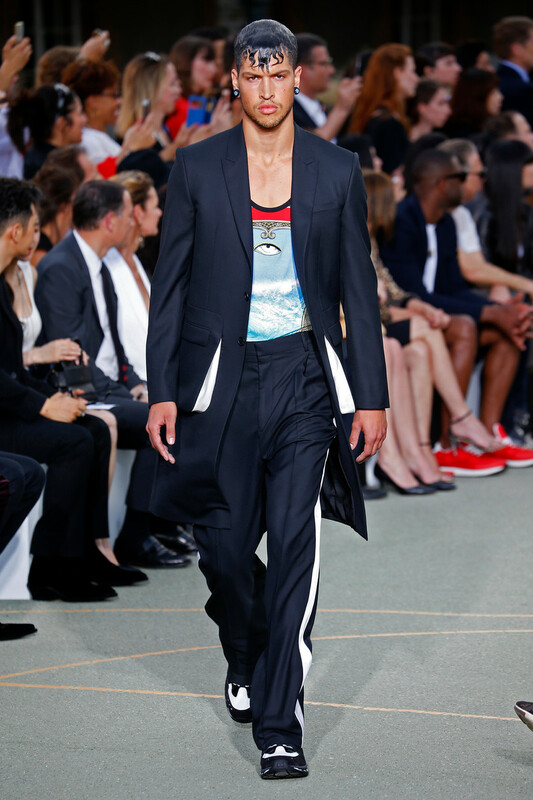 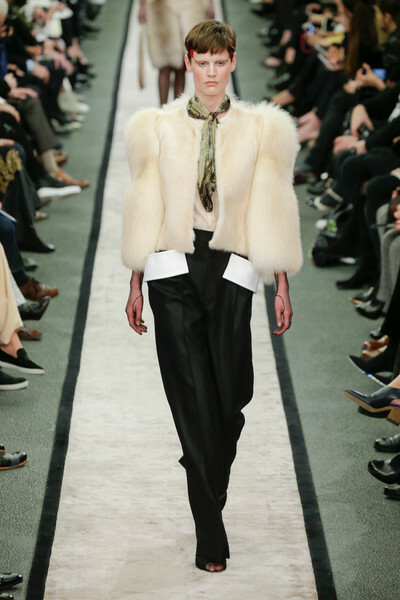 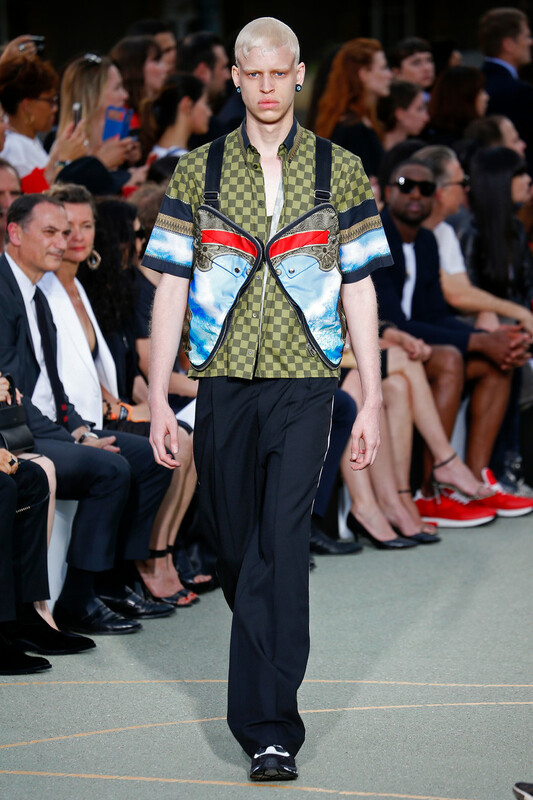 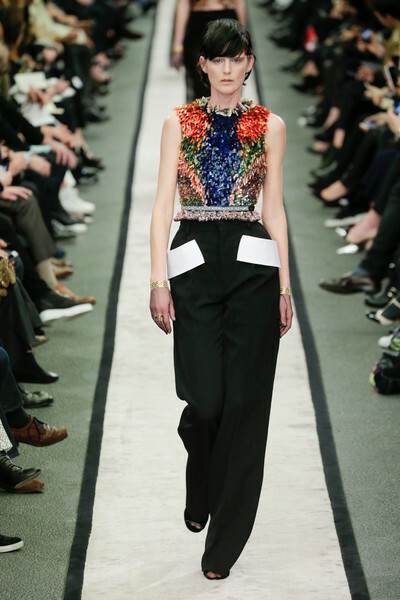 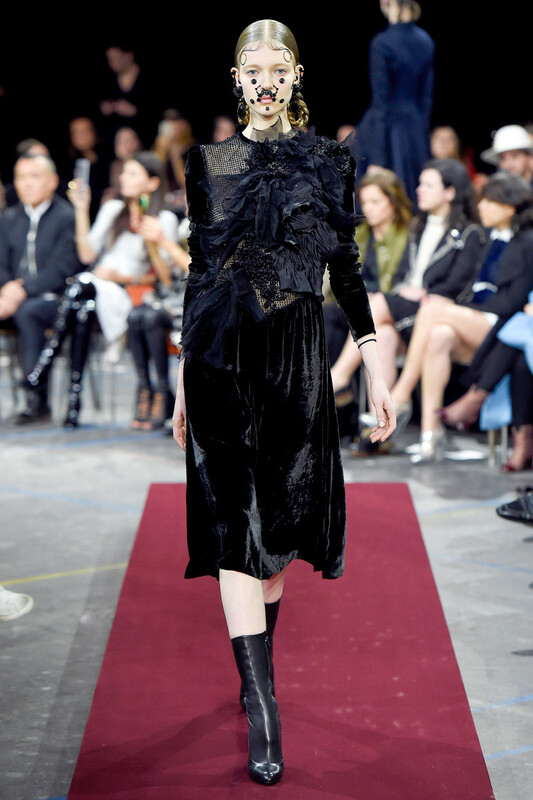 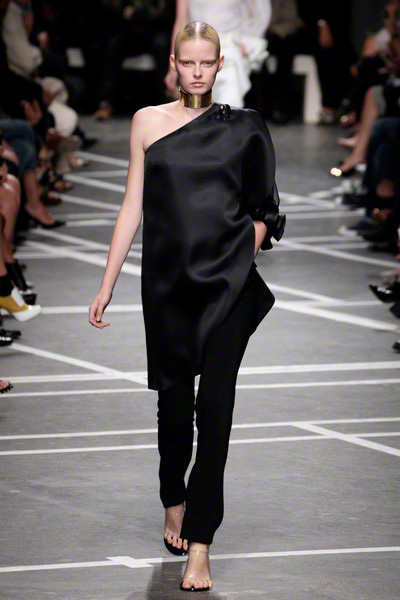 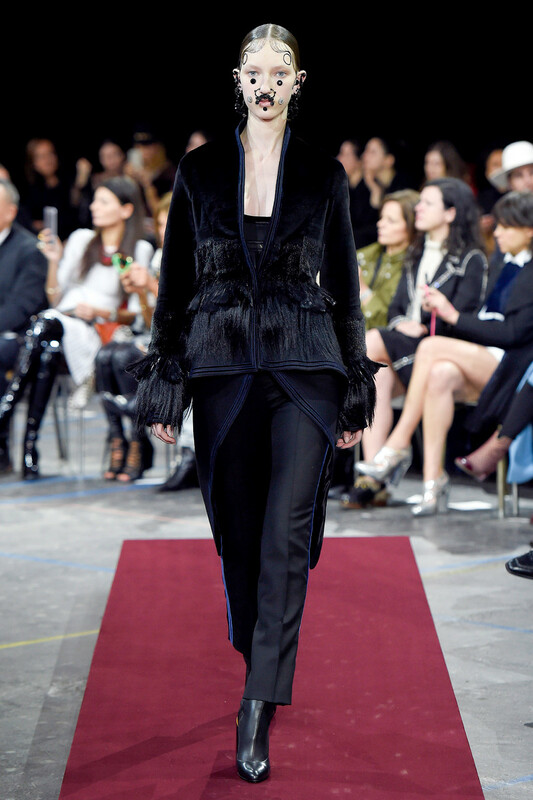 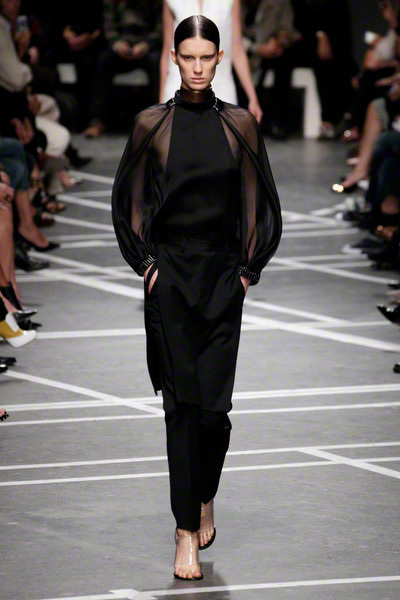 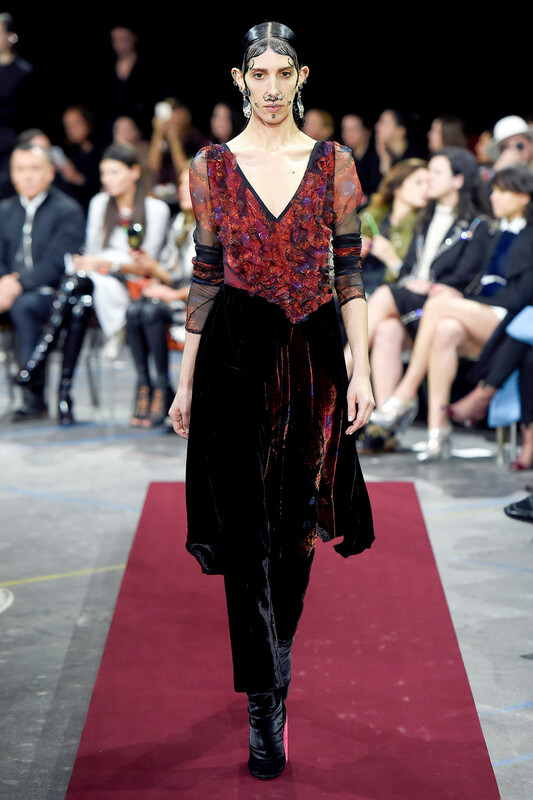 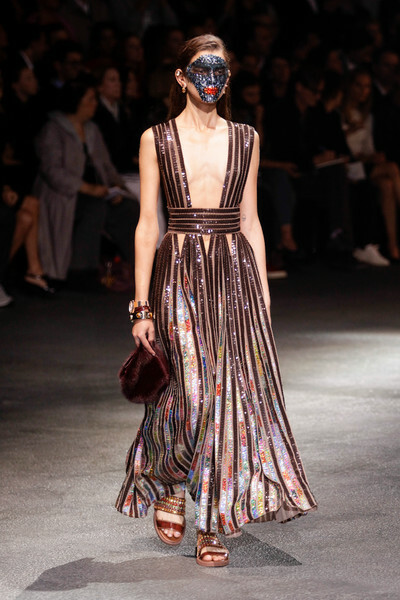 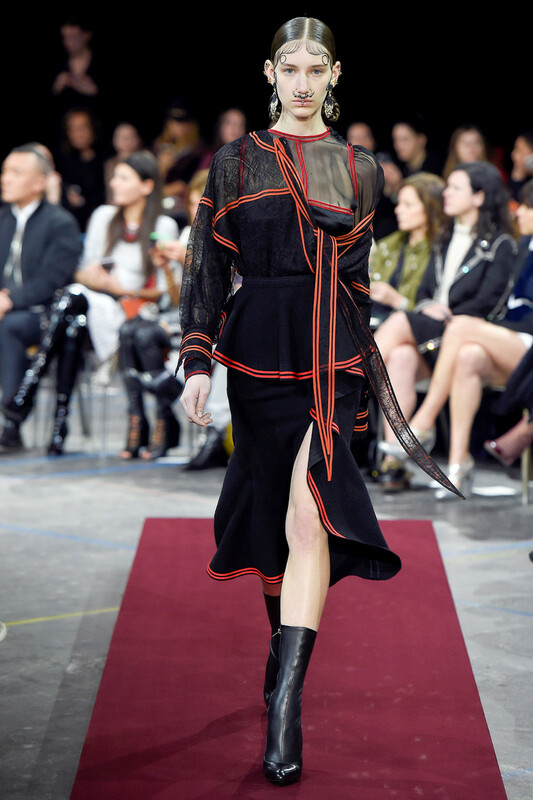 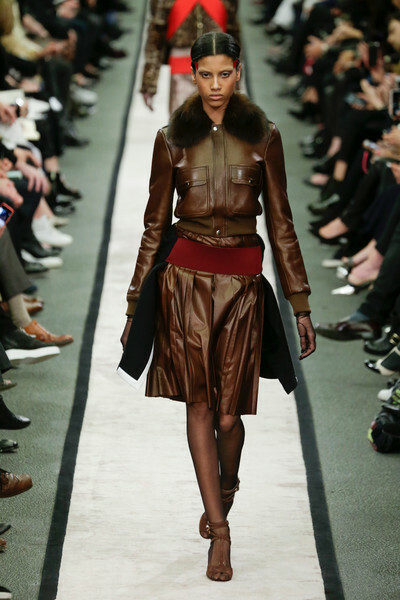 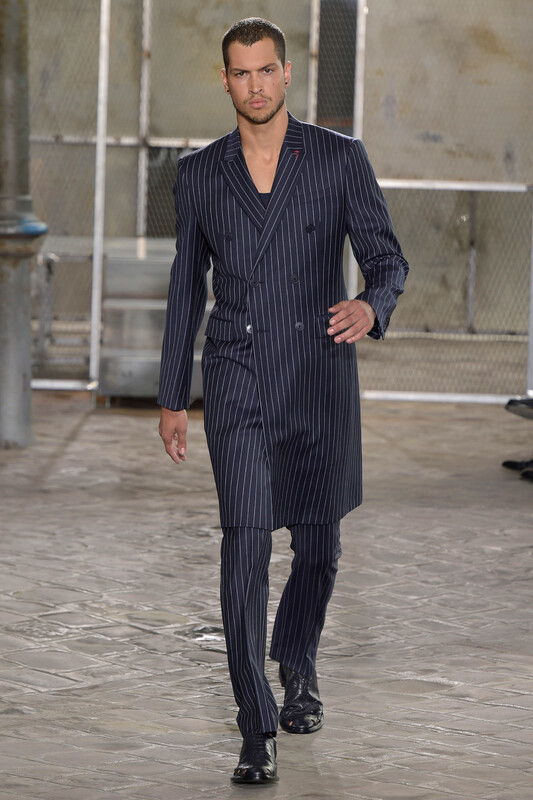 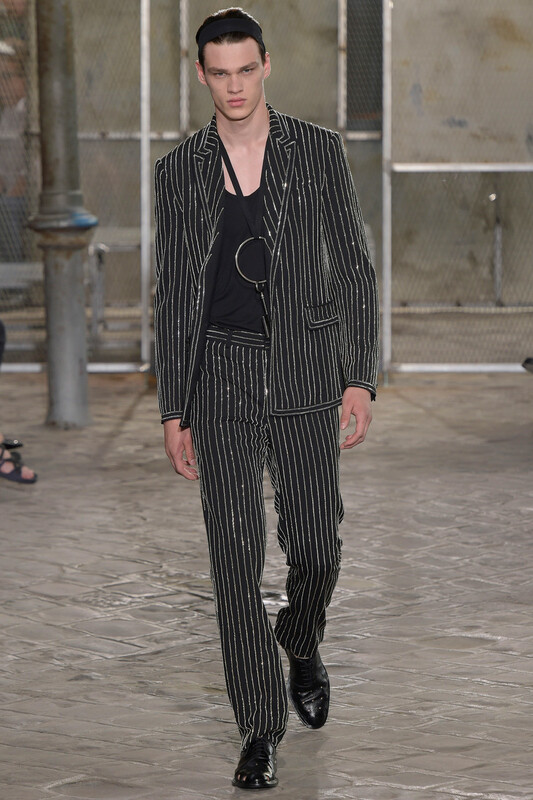 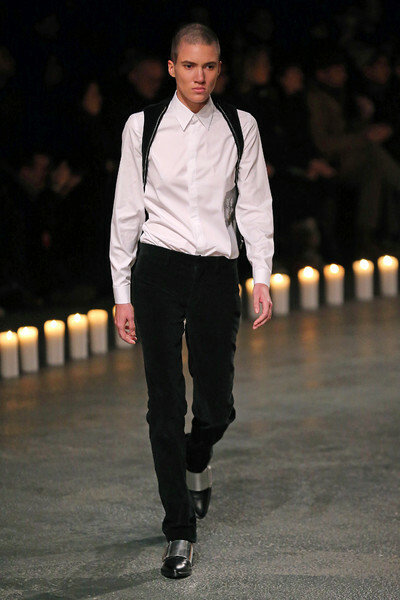 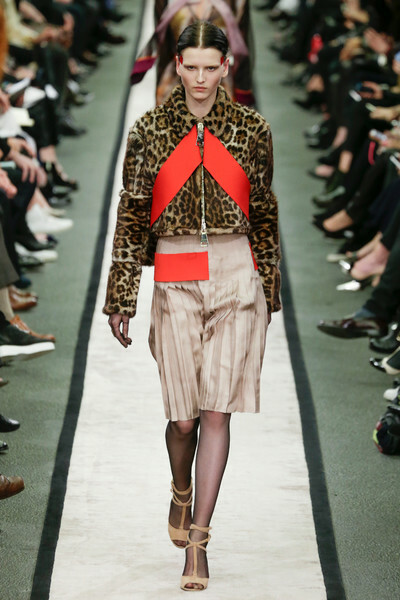 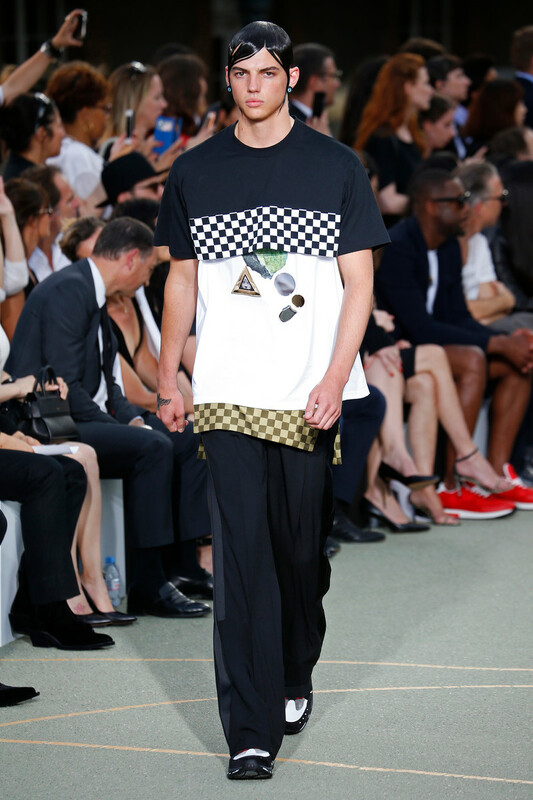 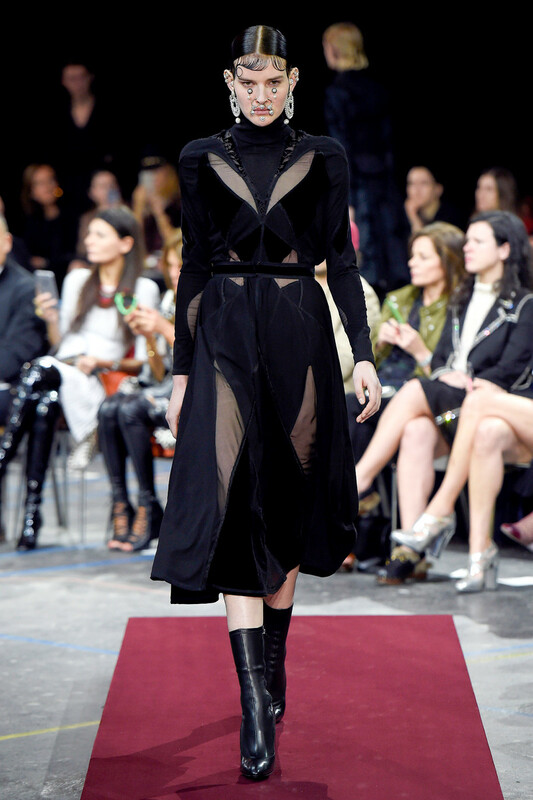 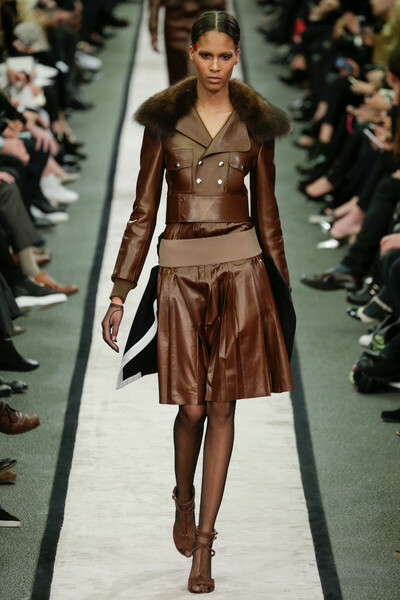 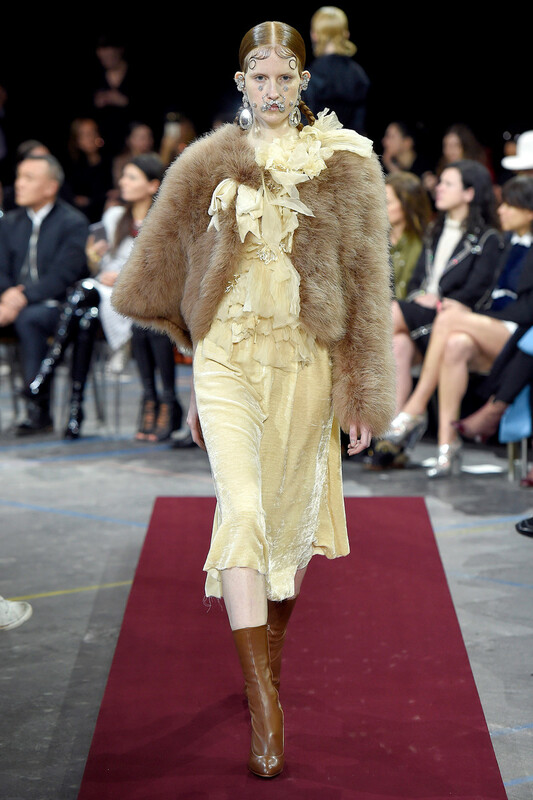 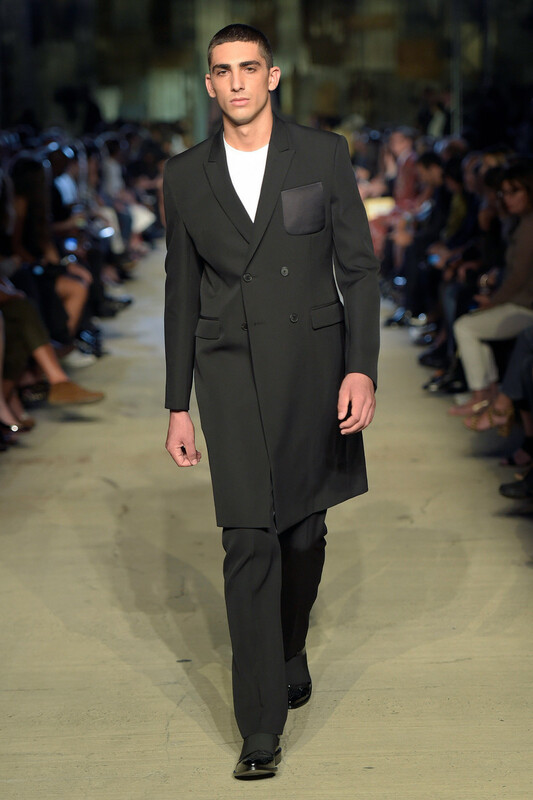 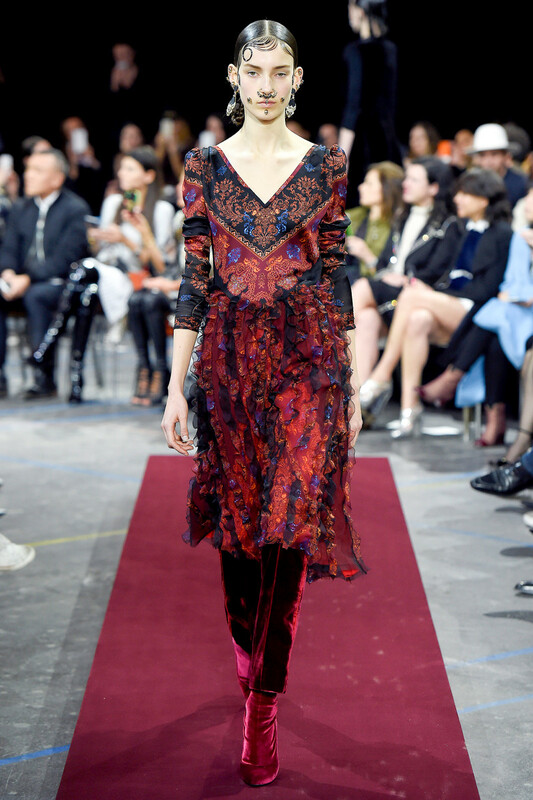 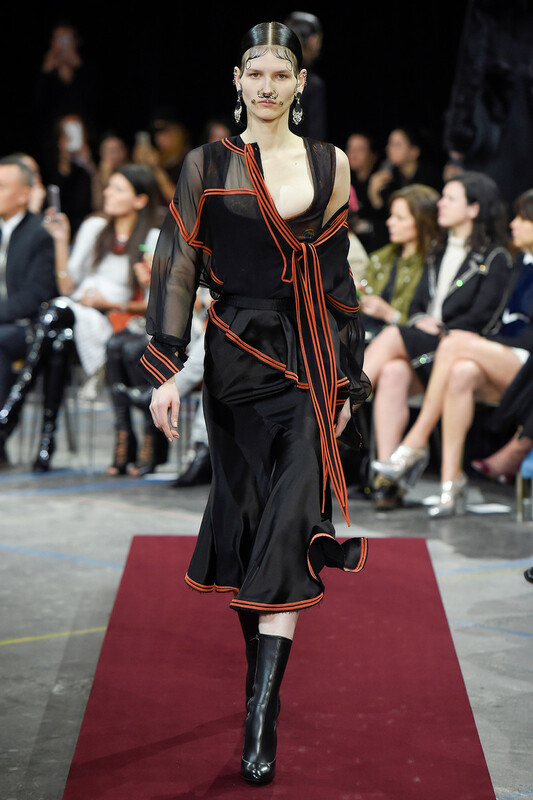 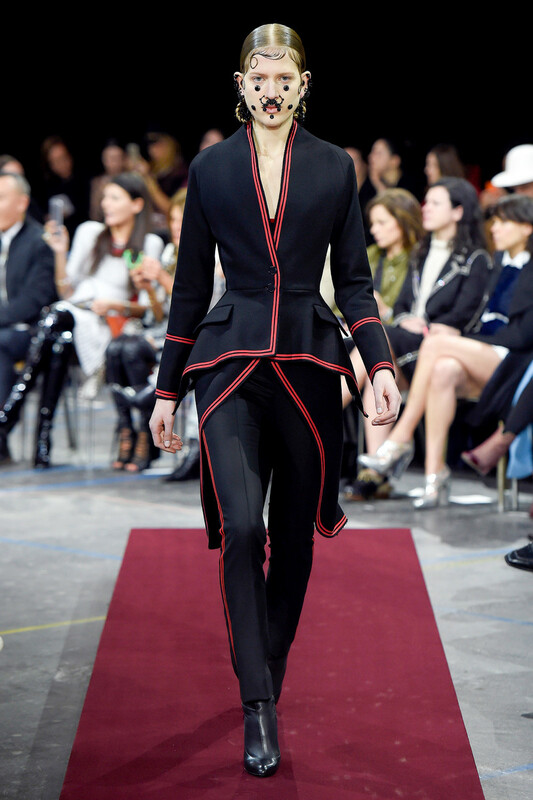 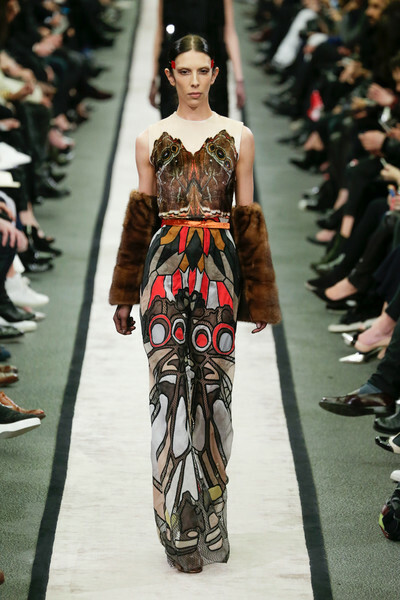 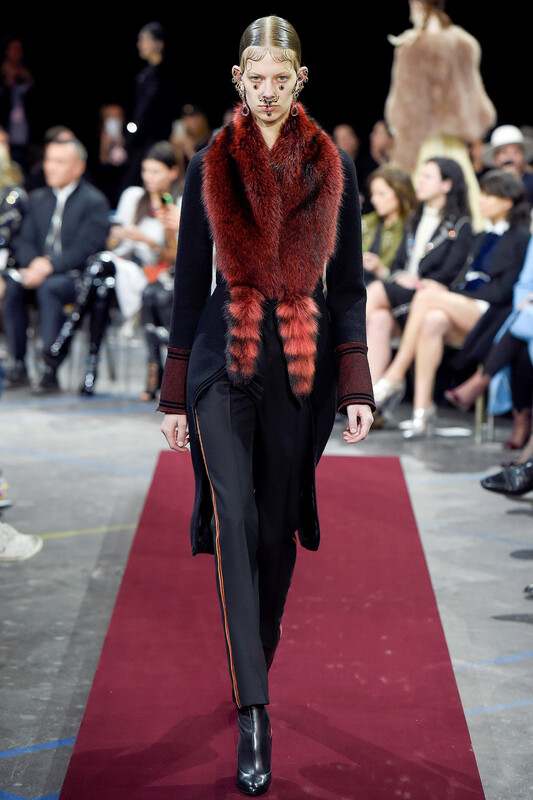 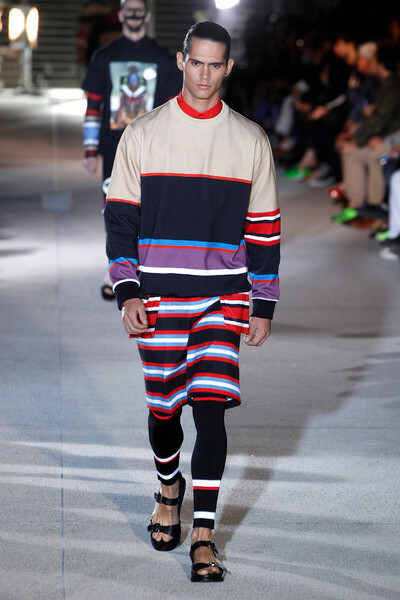 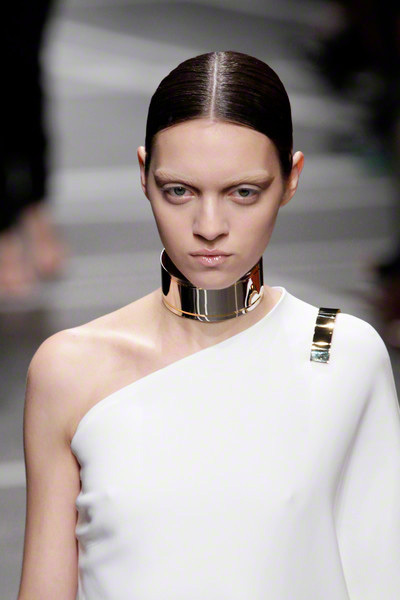 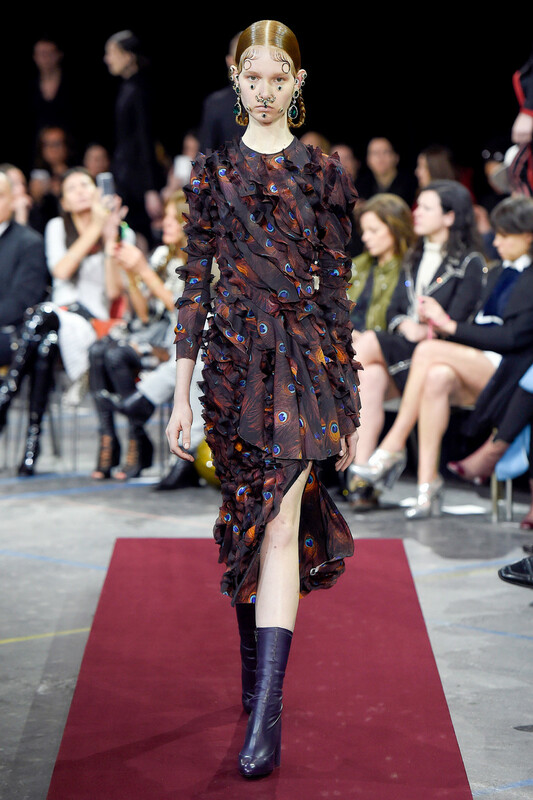 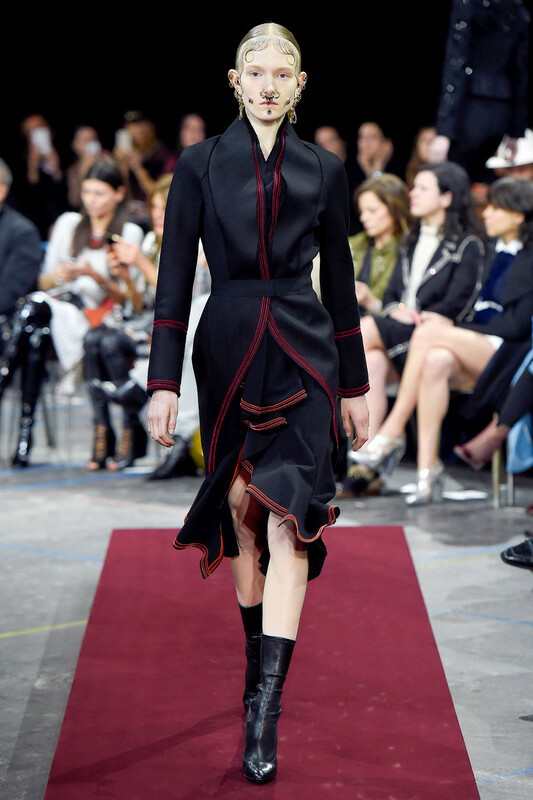 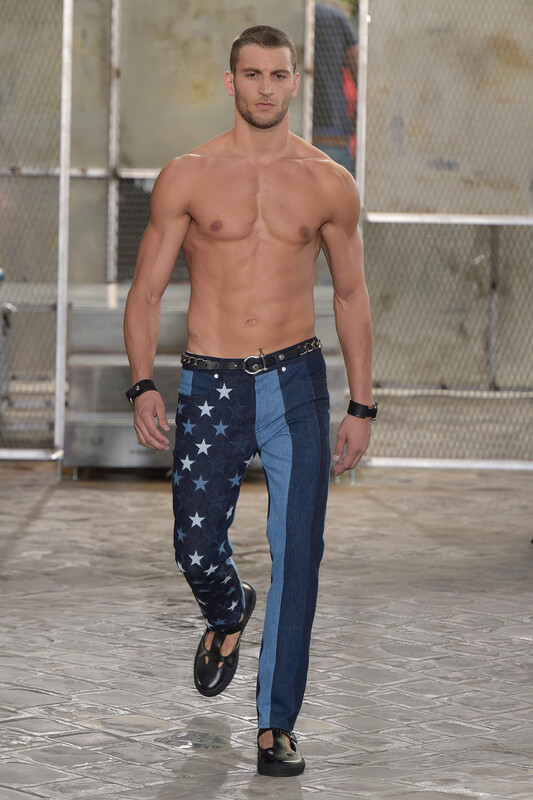 Riccardo Tisci presented a wonderful collection yesterday where he mixed serenity and edge into something special. 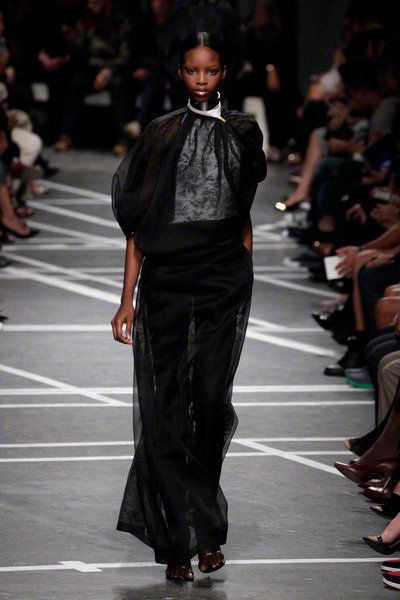 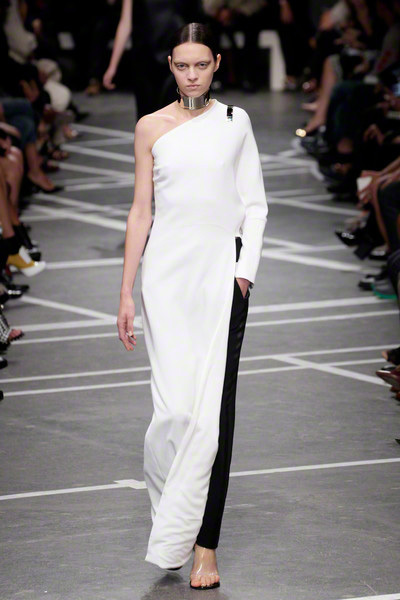 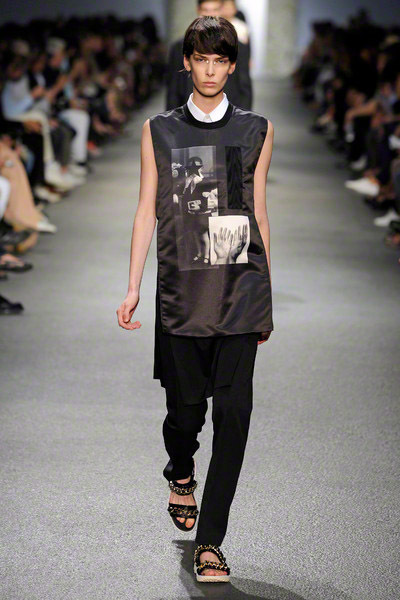 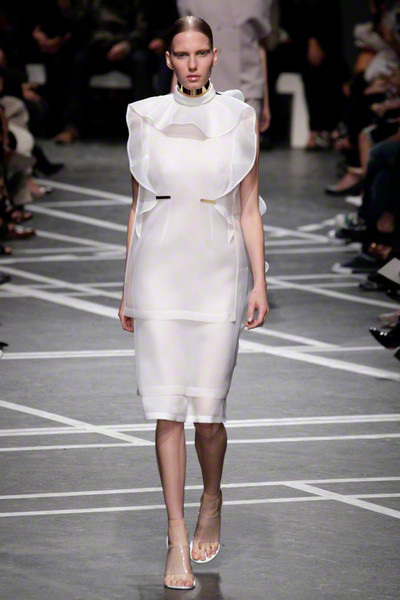 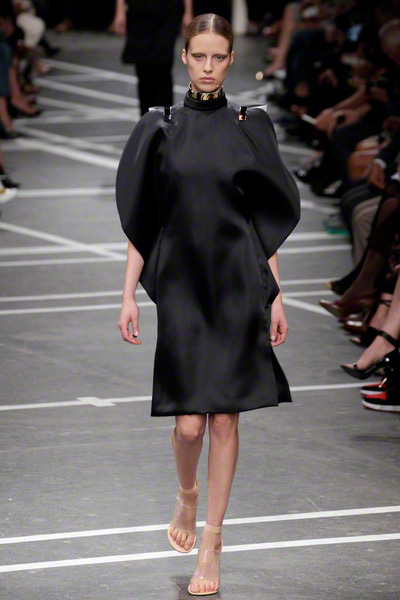 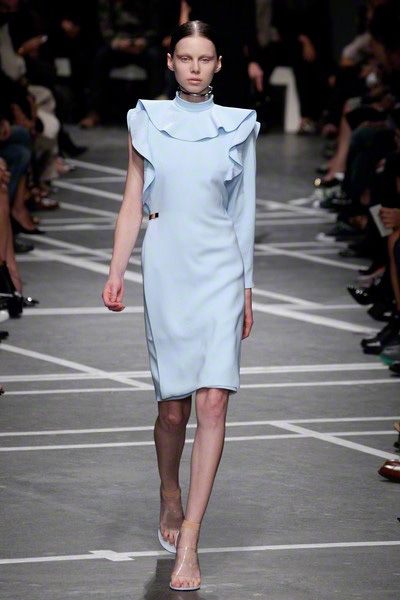 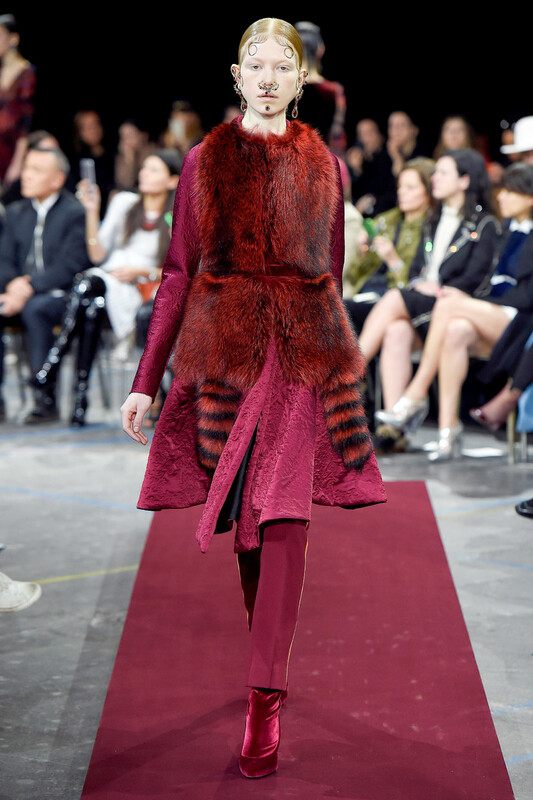 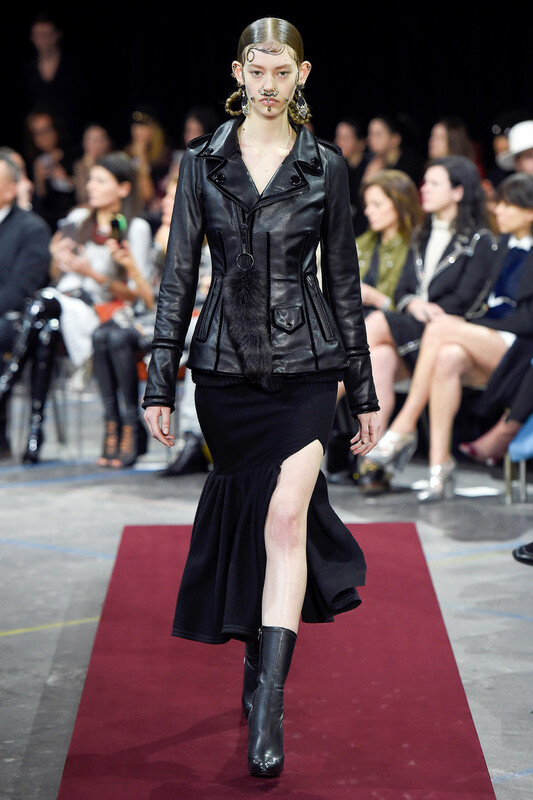 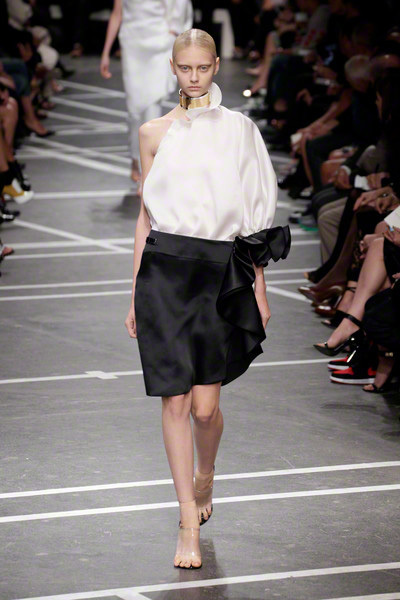 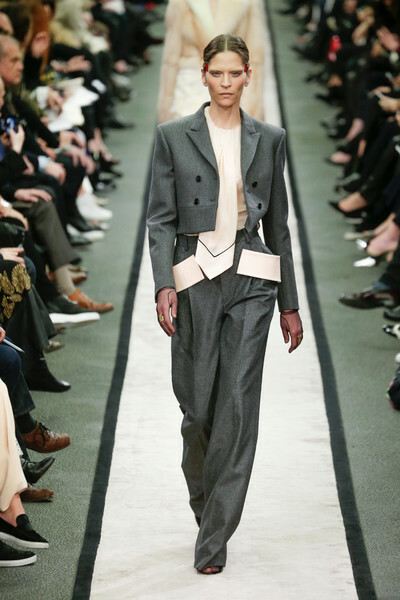 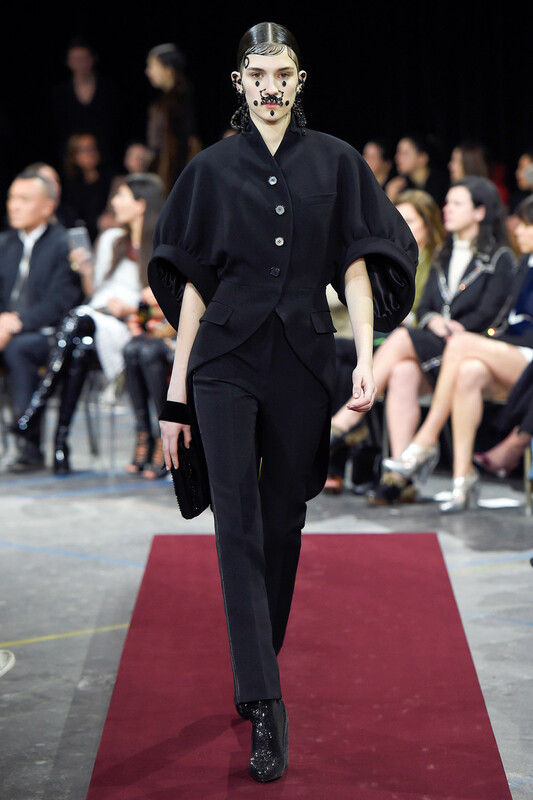 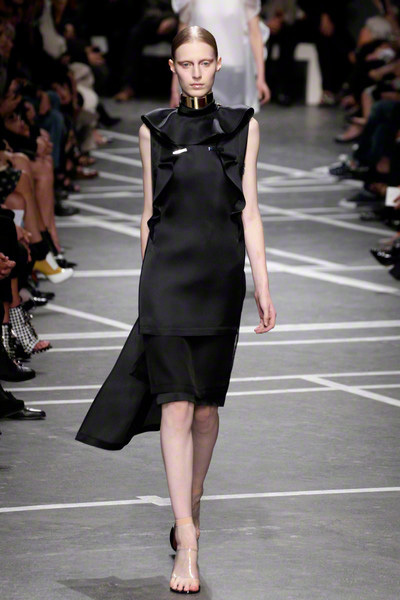 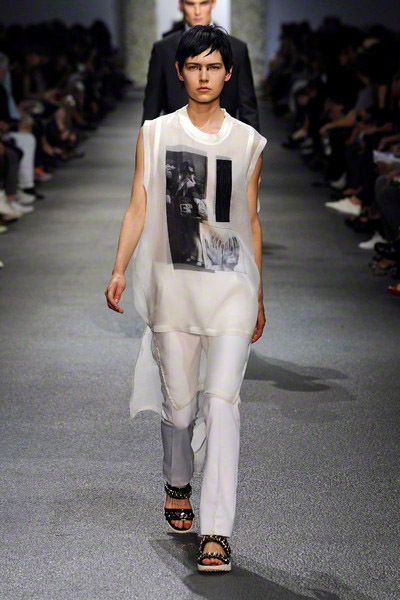 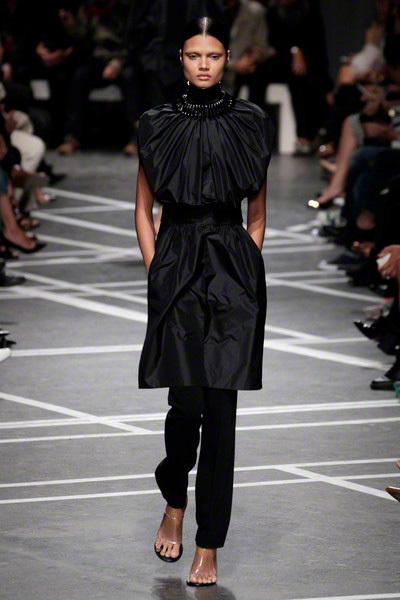 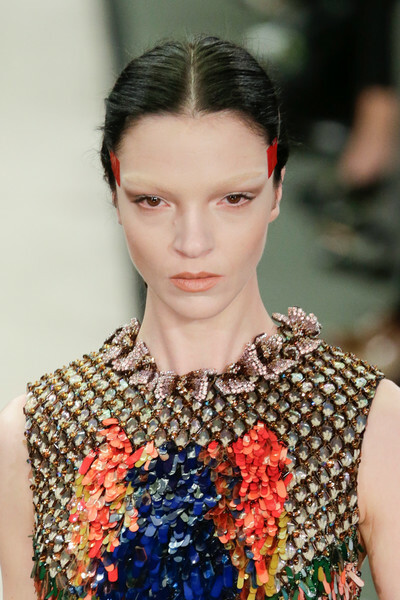 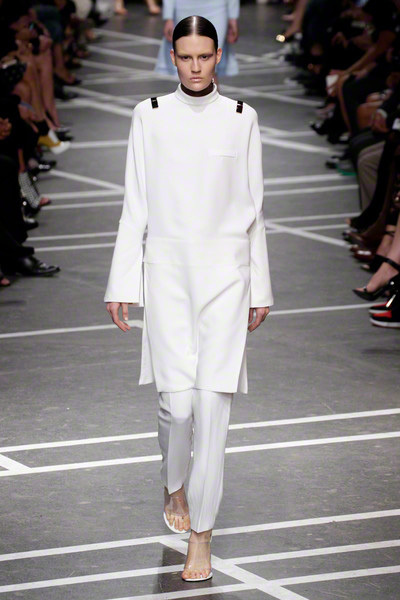 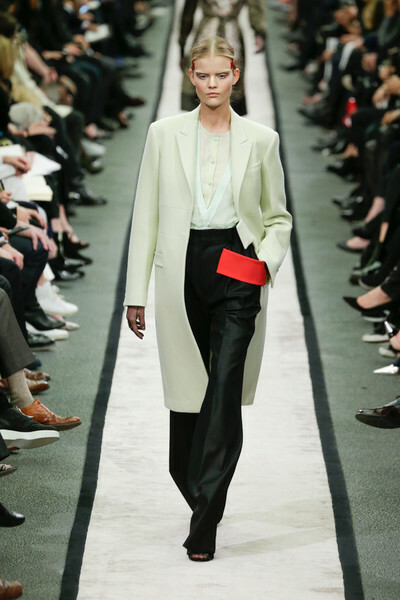 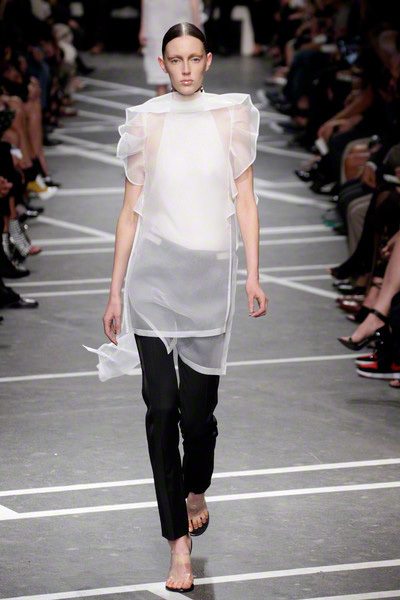 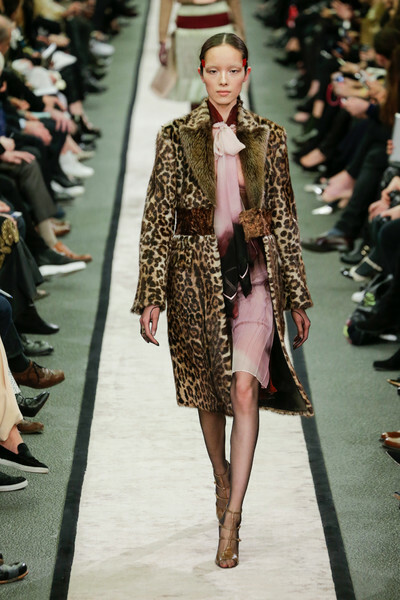 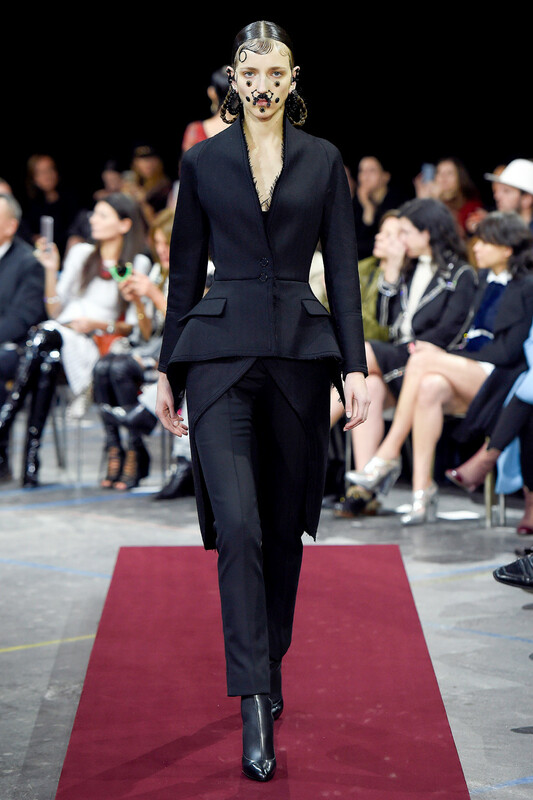 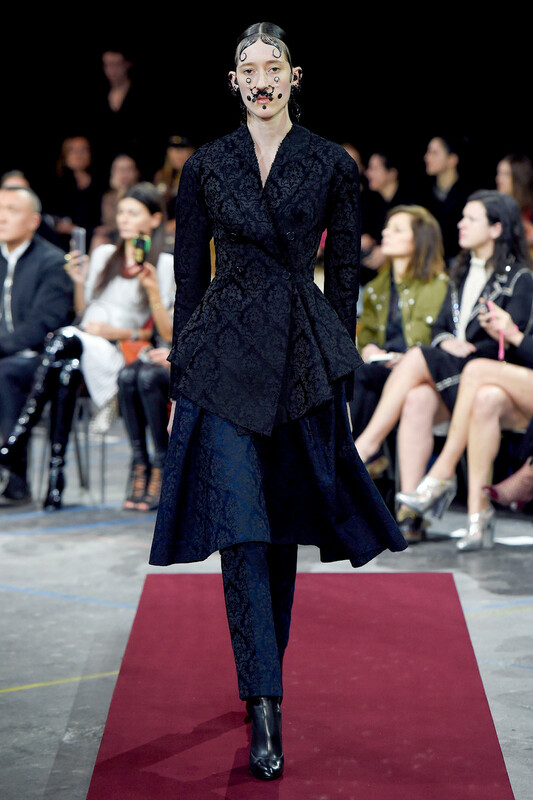 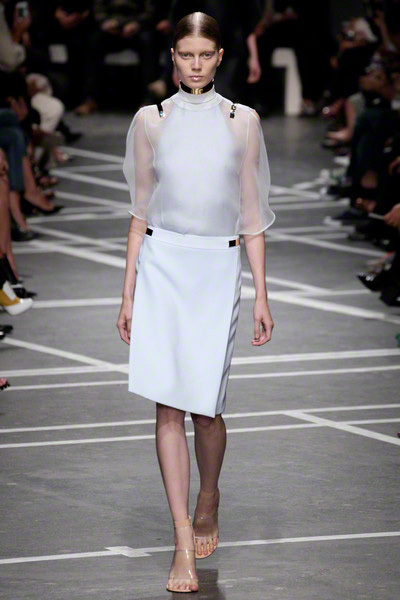 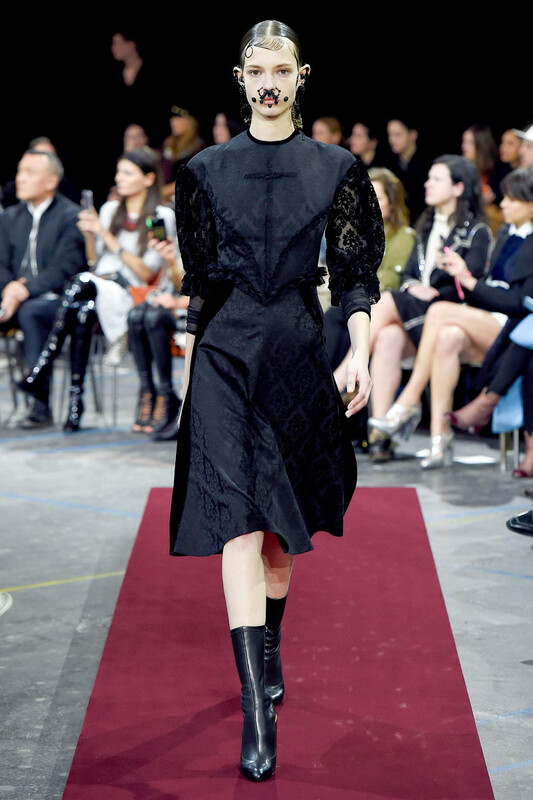 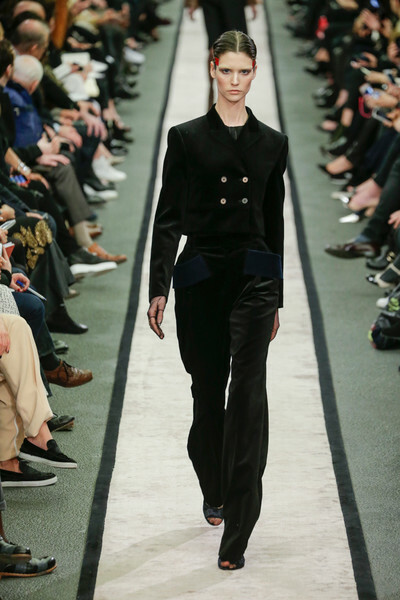 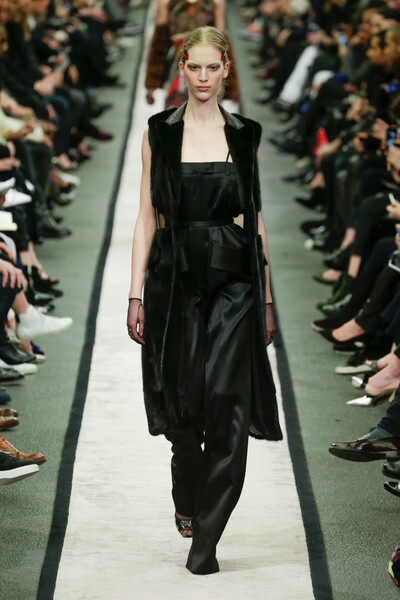 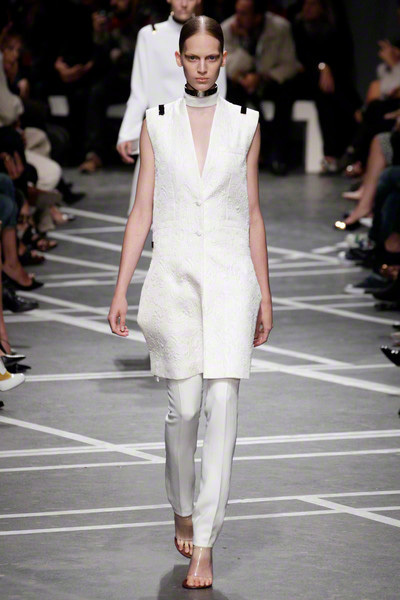 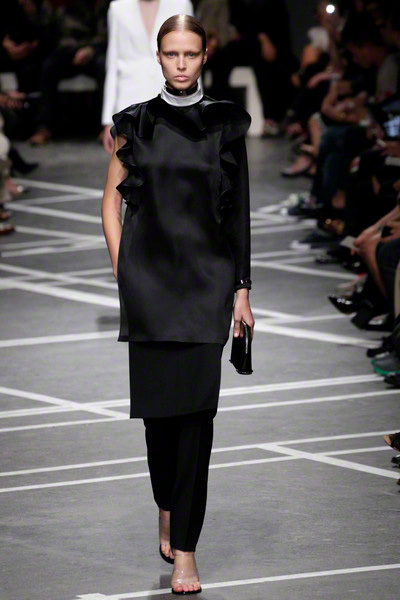 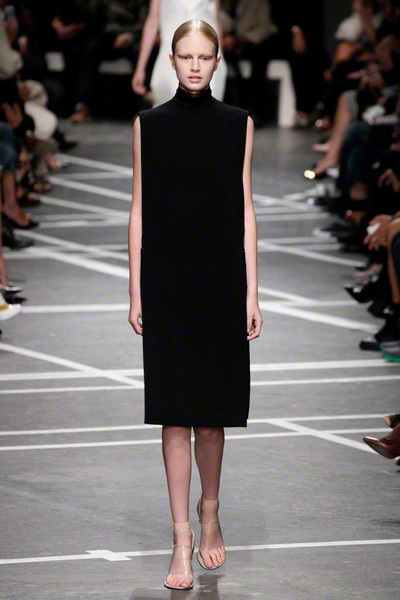 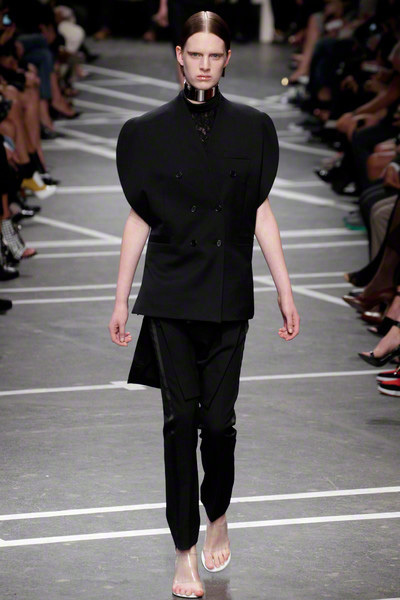 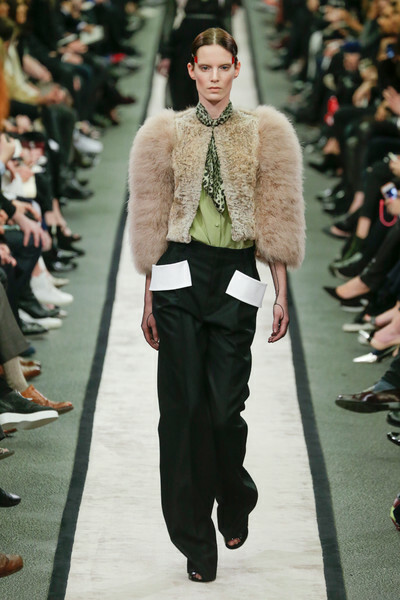 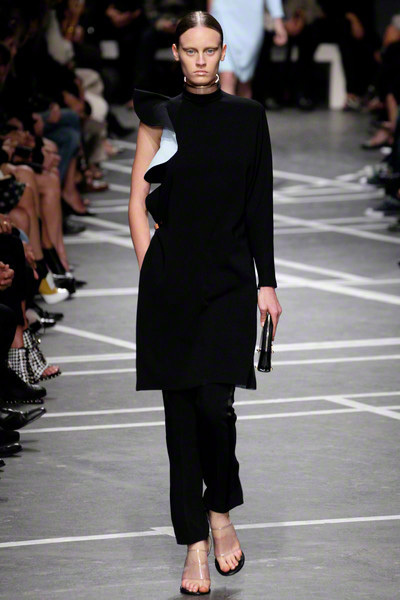 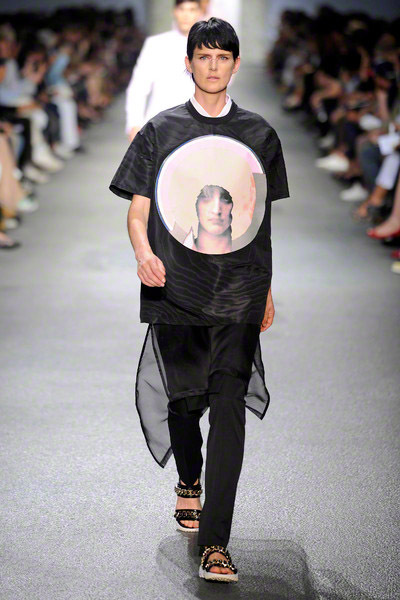 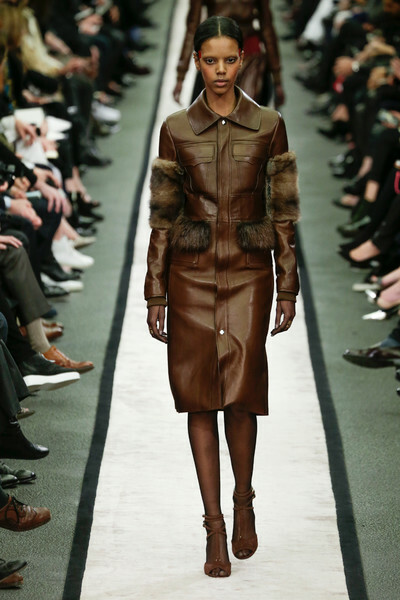 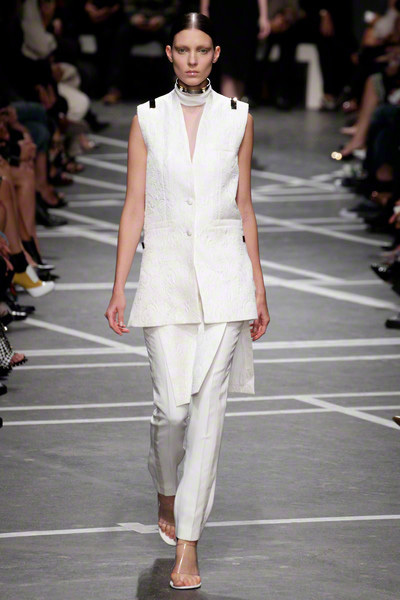 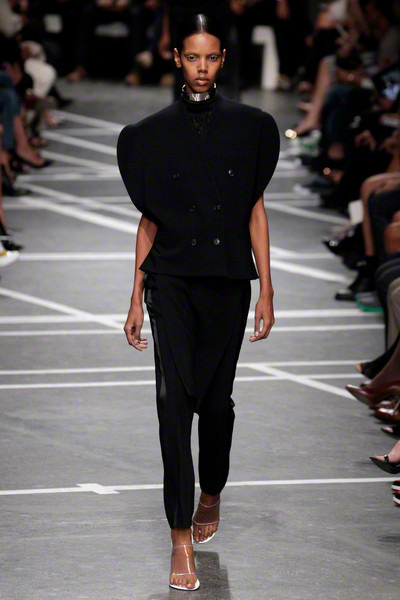 His references were the Sixties and the archives of the Givenchy-house for the shapes. 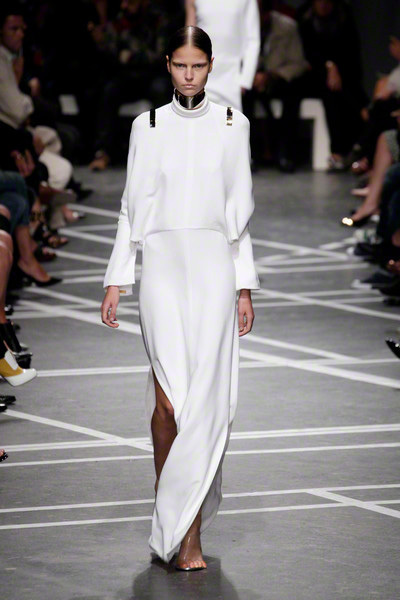 He also took inspiration from nuns for the purity and lightness. 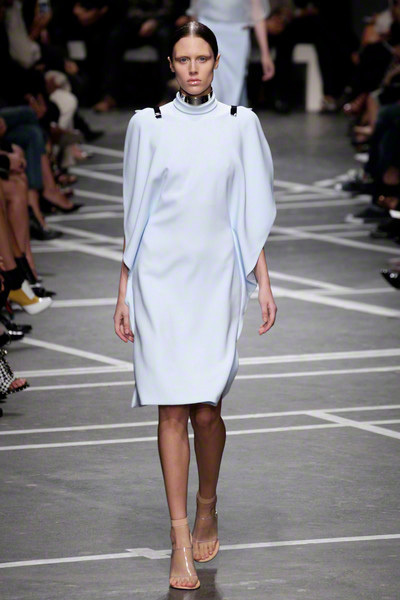 And it all came together: ecclesiastical through the colors (baby blue, white and black), the feeling of restraint (signalled by rivets holding waists and shoulders in place and worn around necks as chokers), and through the shapes – which played on covering up. 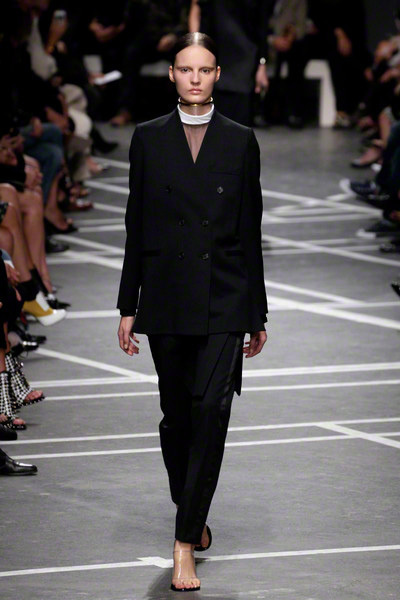 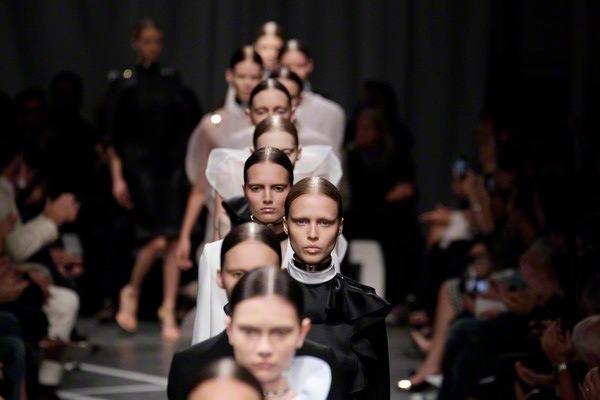 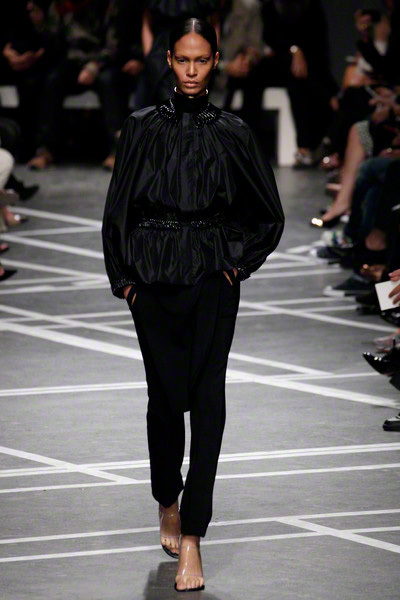 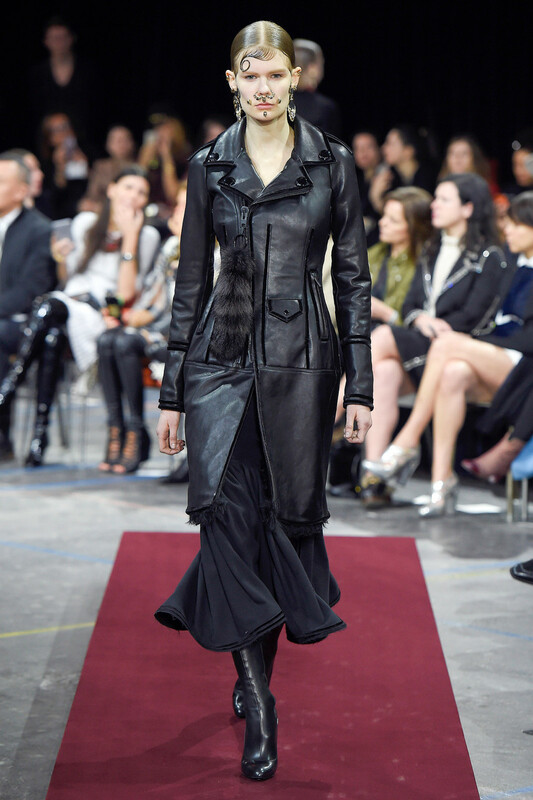 Tisci’s catholic backround turned up in the priest collars on his sixties shifts, in the voluminous bishop sleeves on a striking black jacke, in the split skirts worn with crisp, dry blazers and pants, like church vestments. 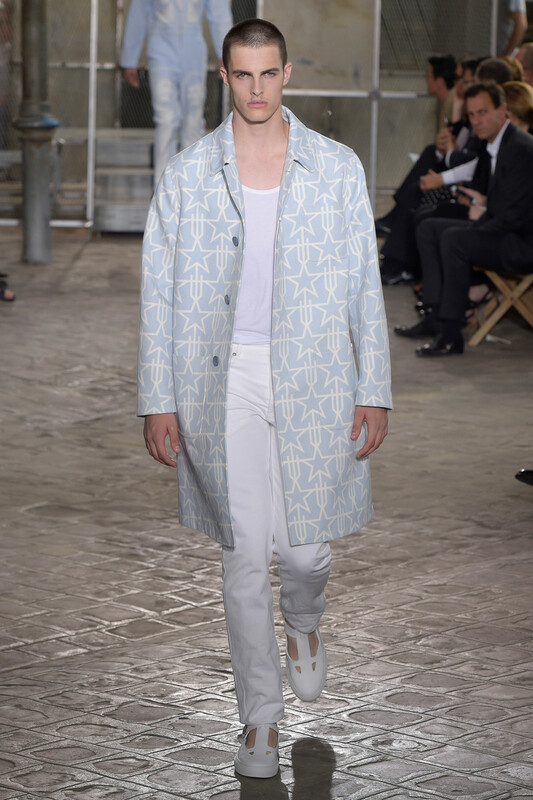 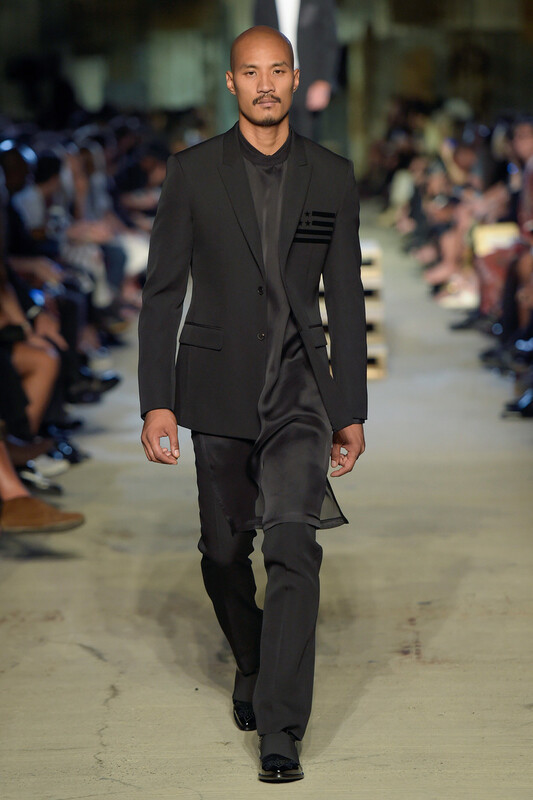 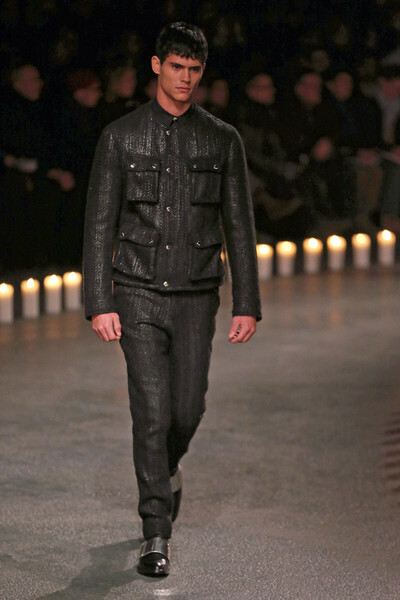 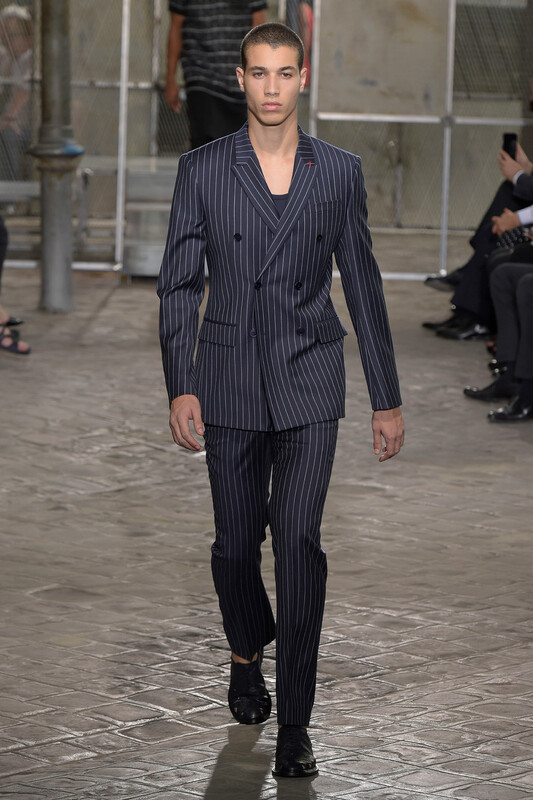 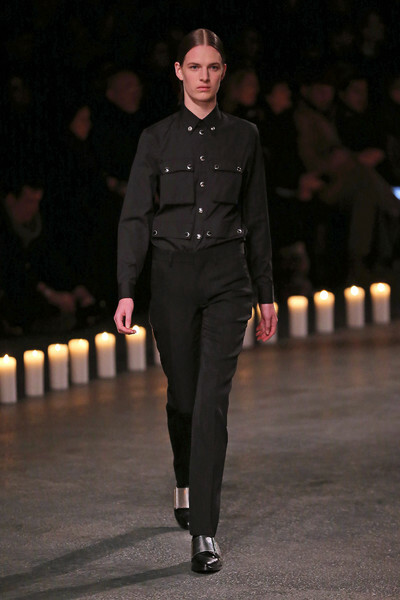 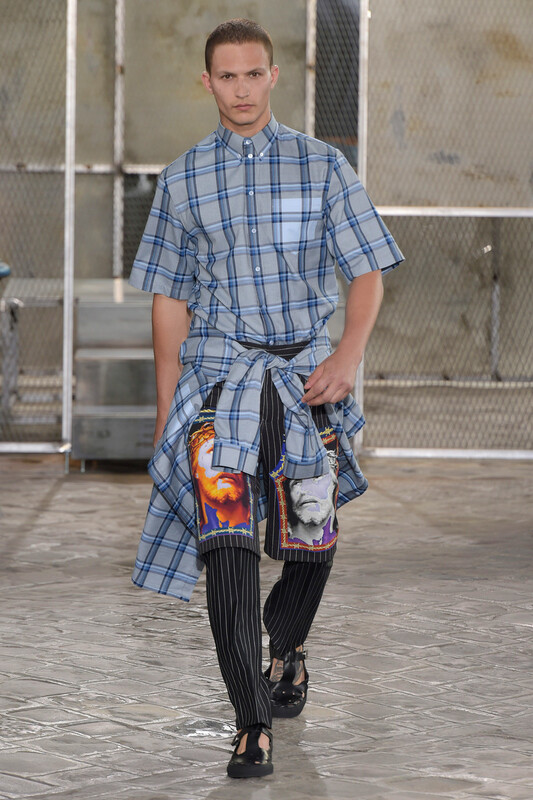 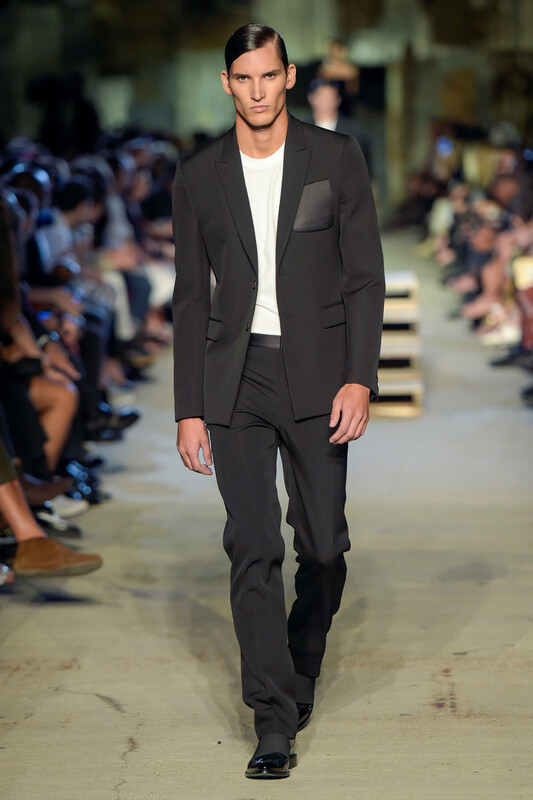 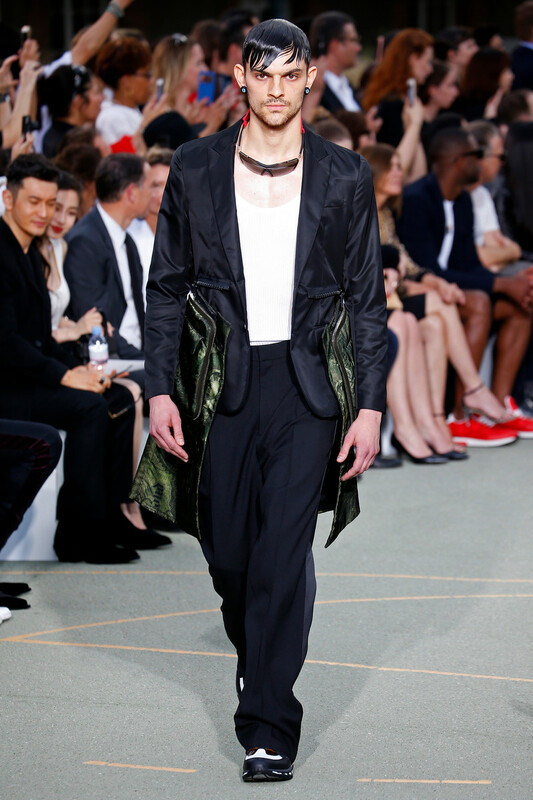 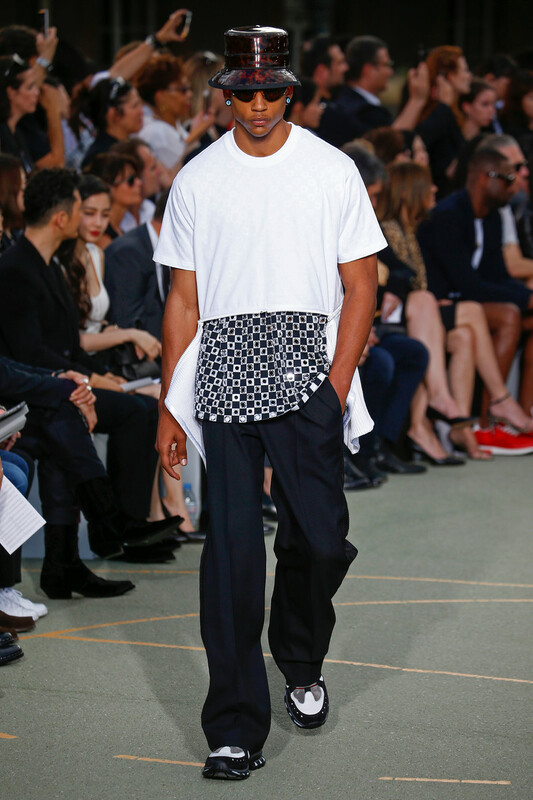 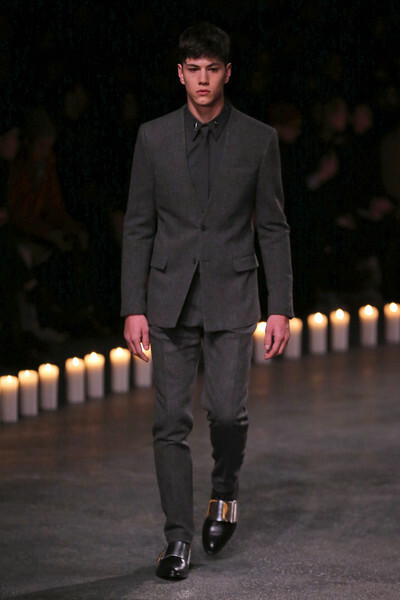 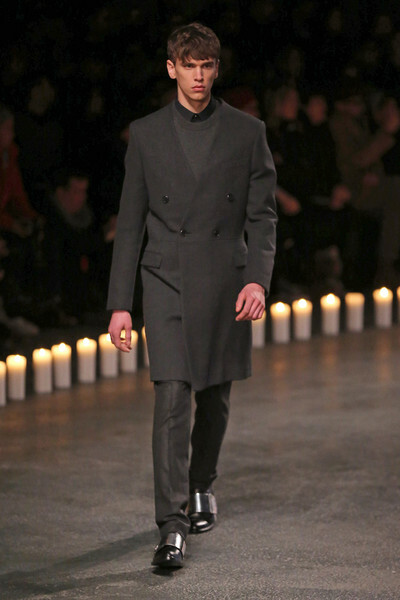 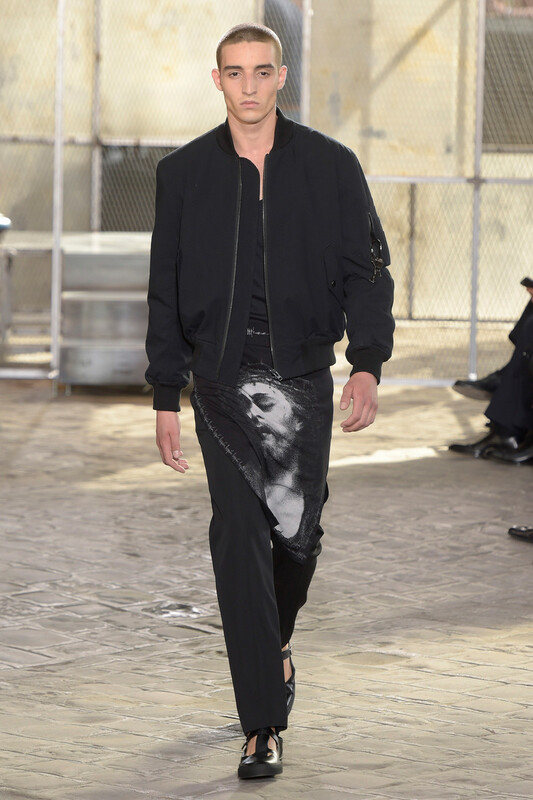 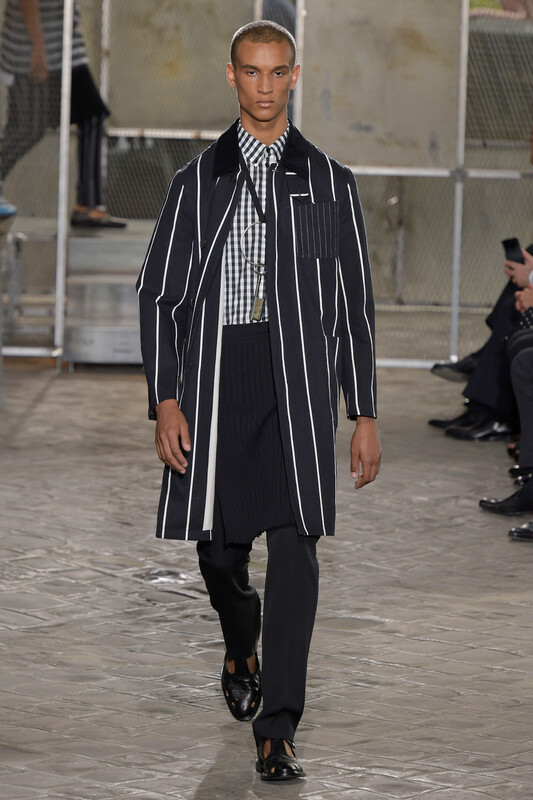 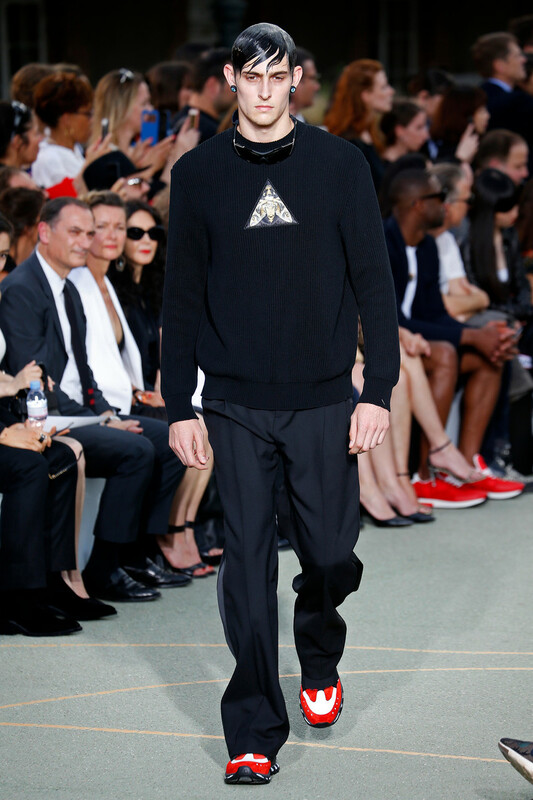 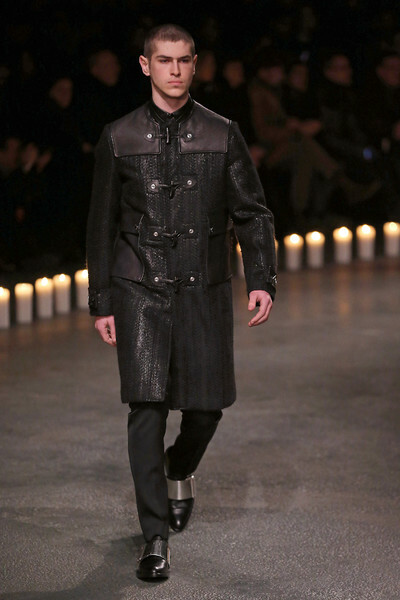 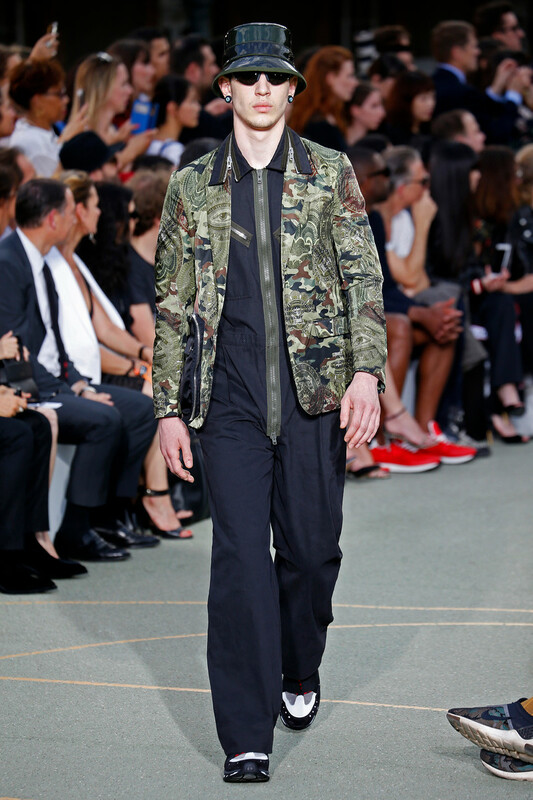 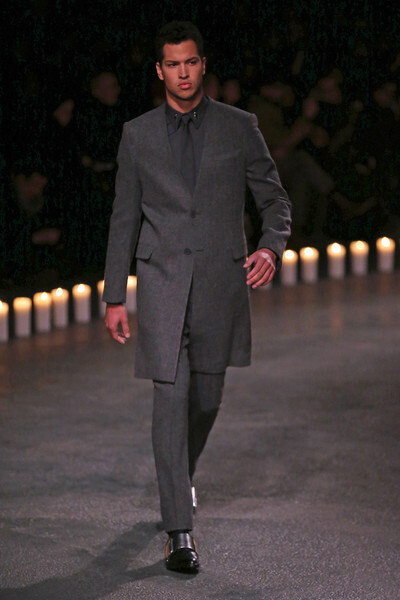 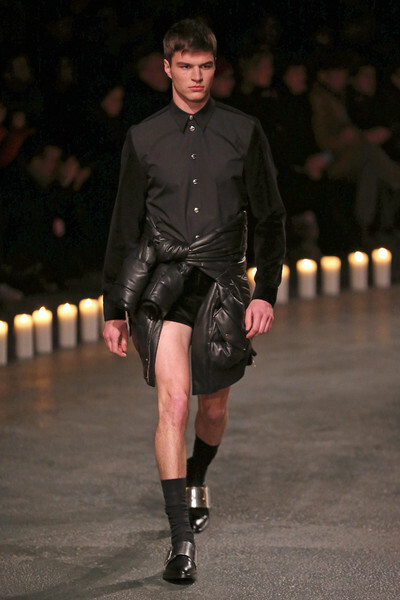 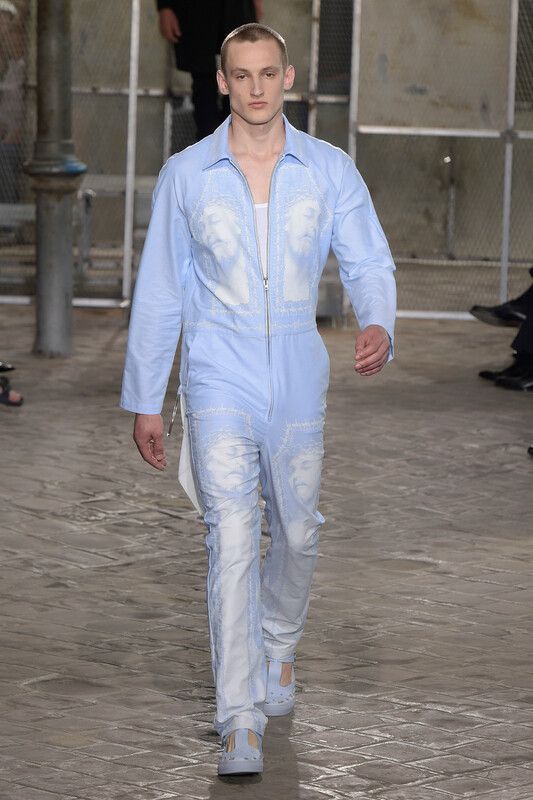 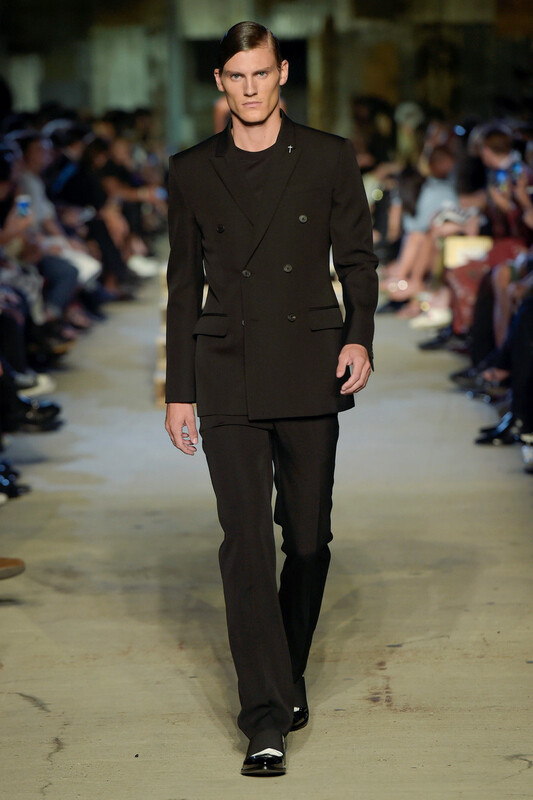 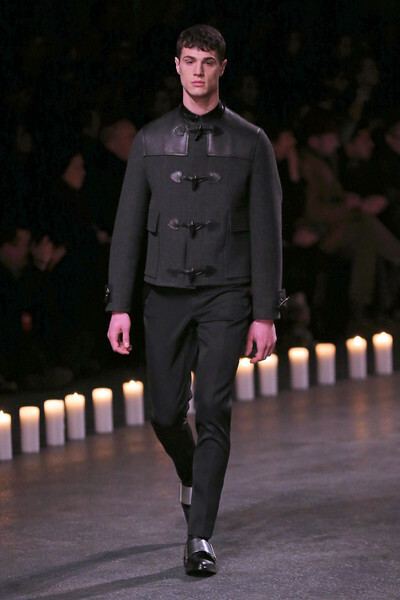 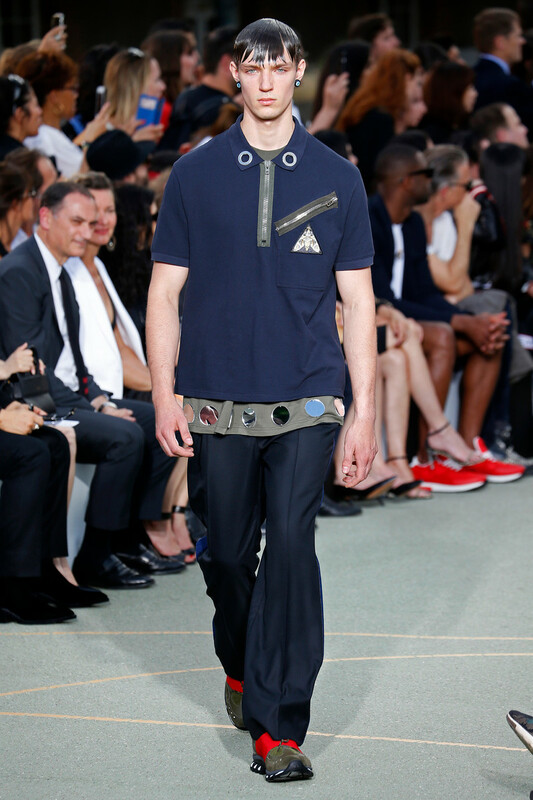 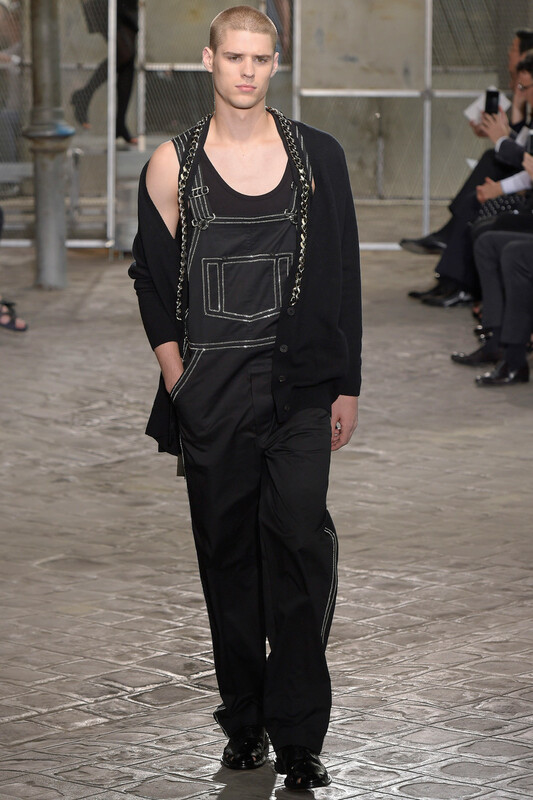 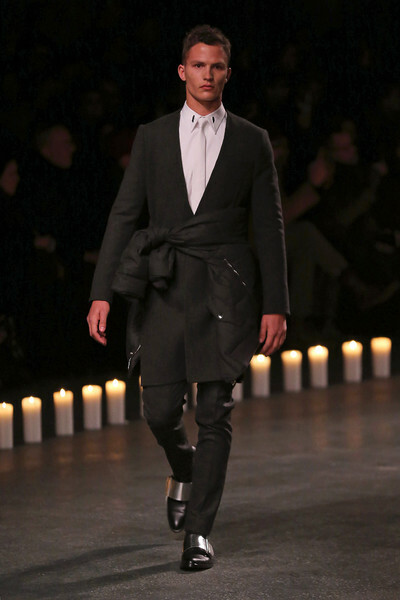 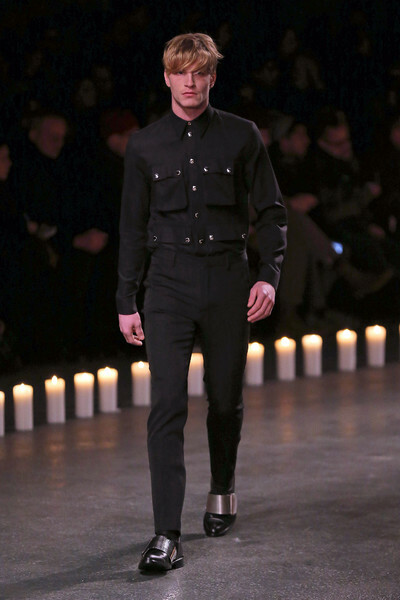 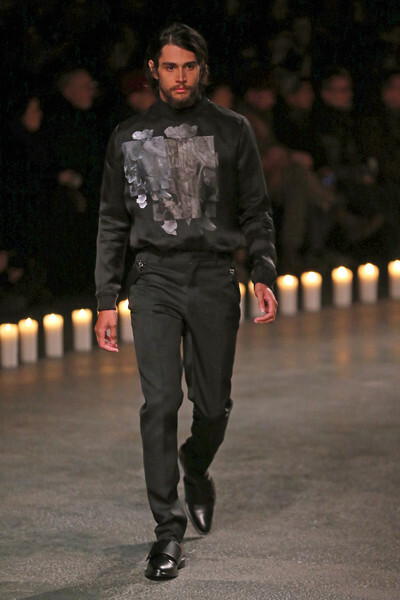 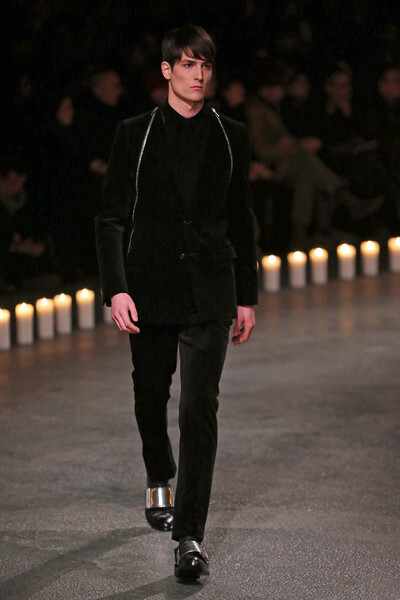 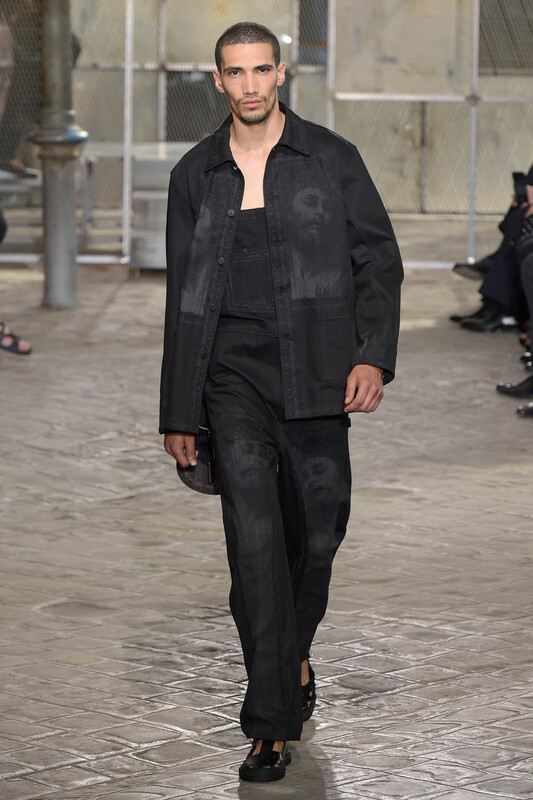 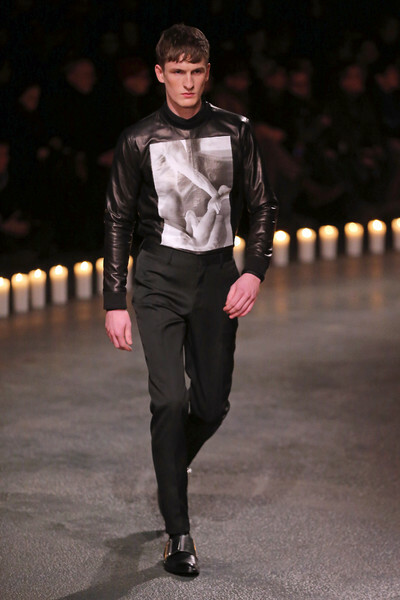 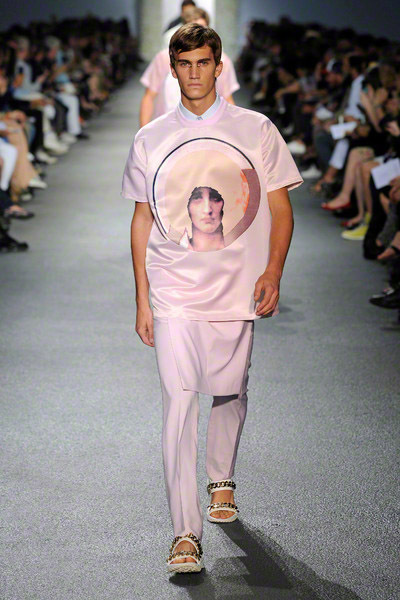 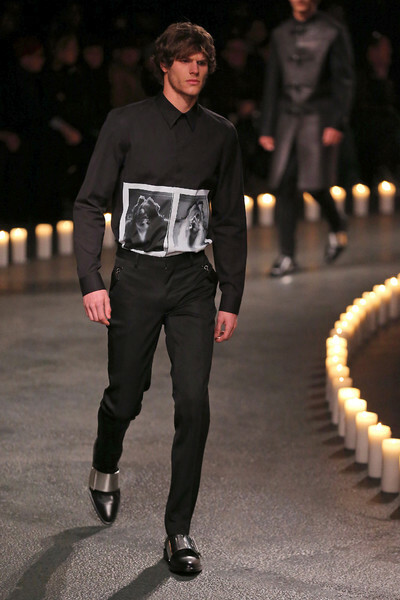 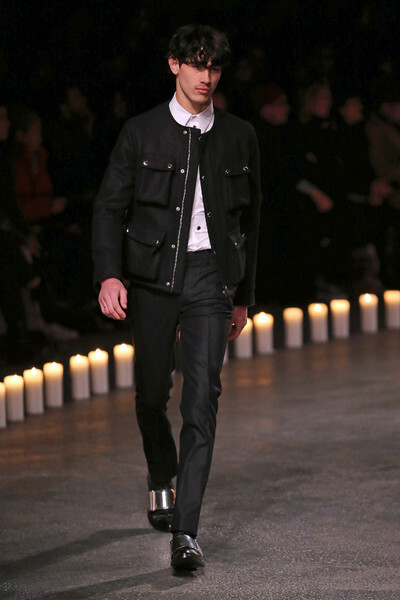 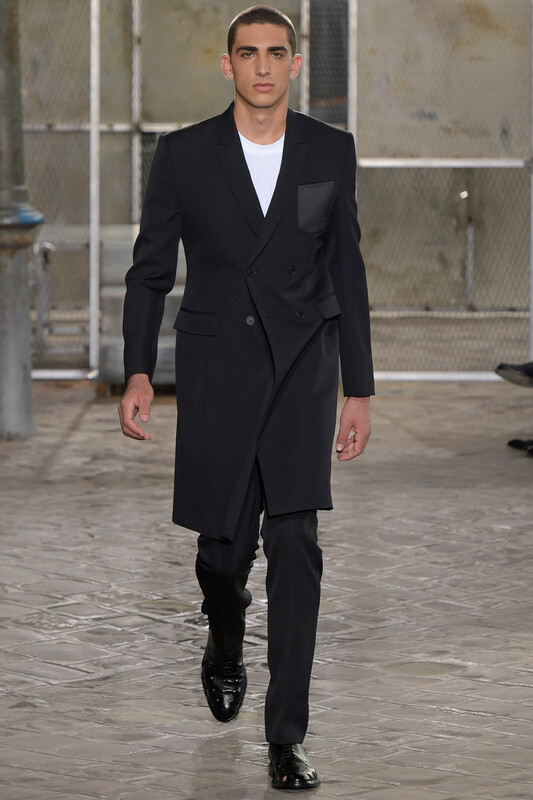 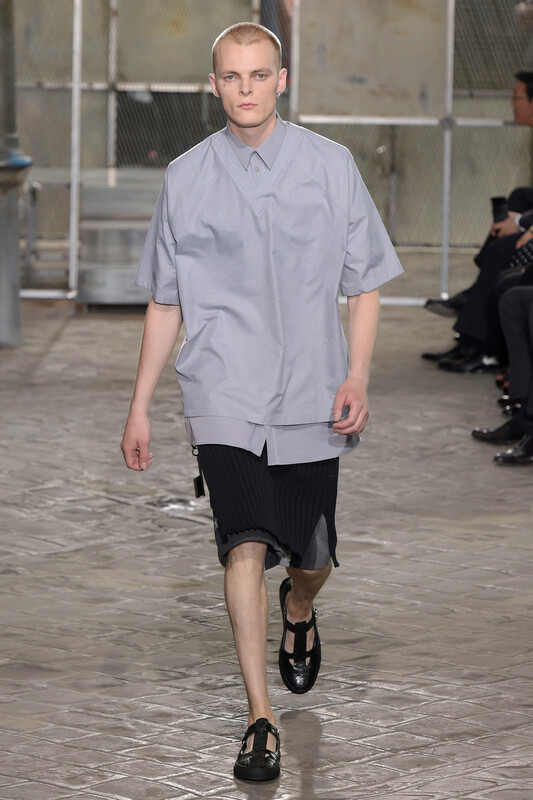 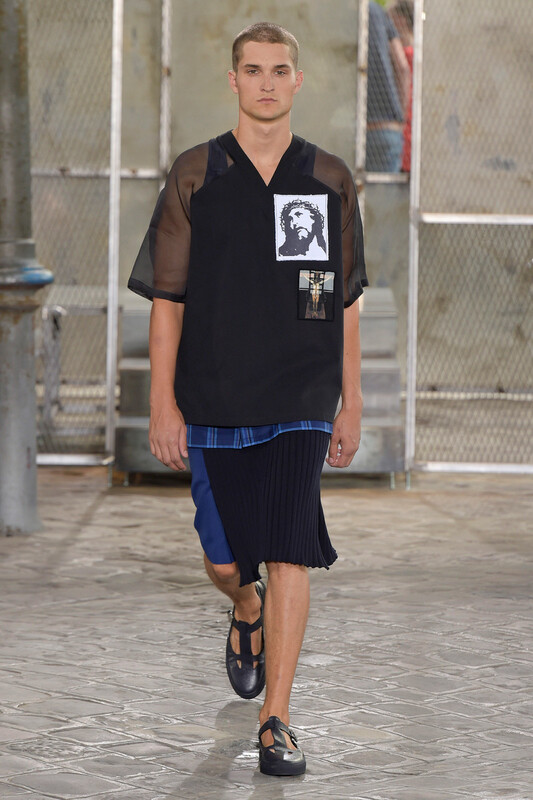 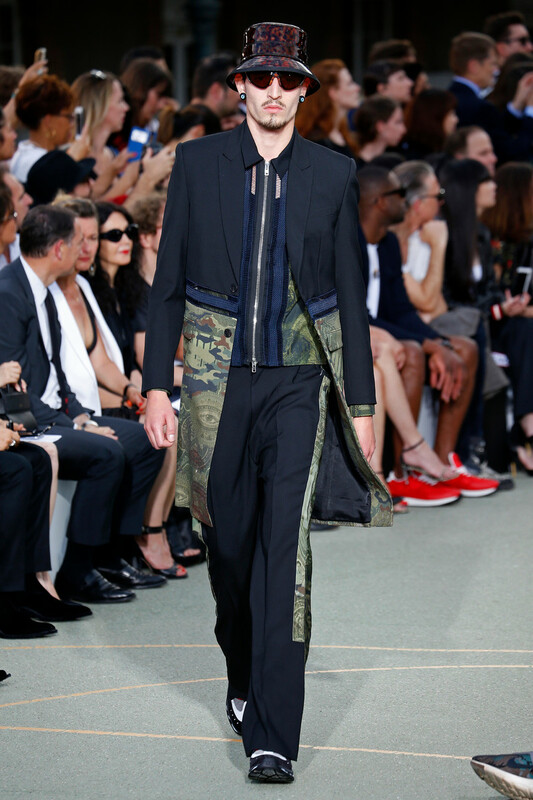 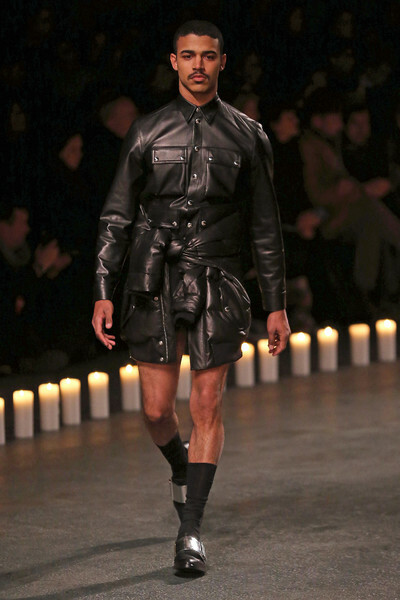 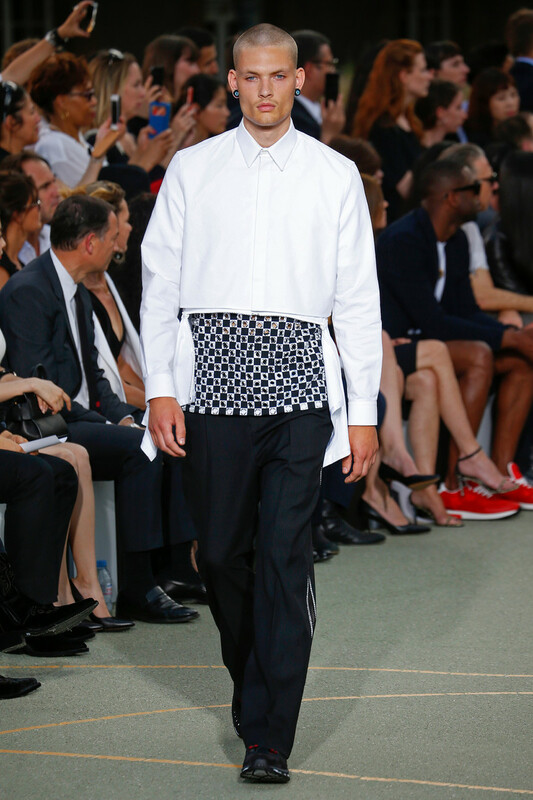 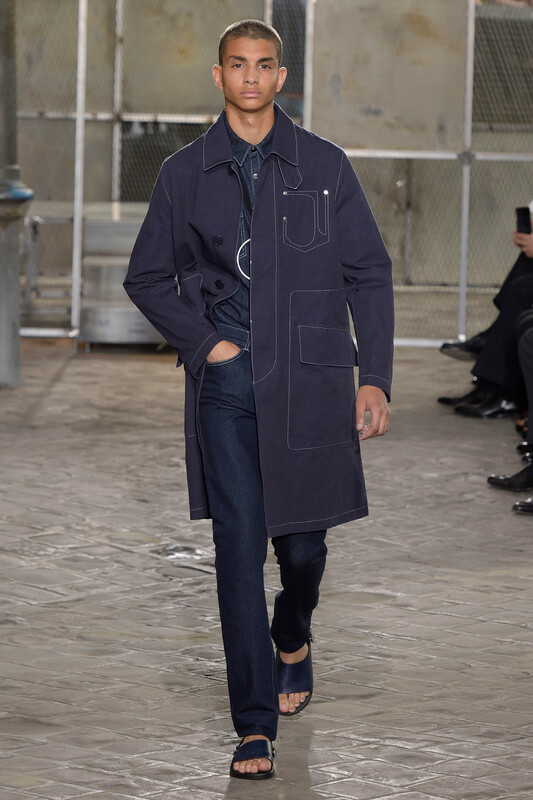 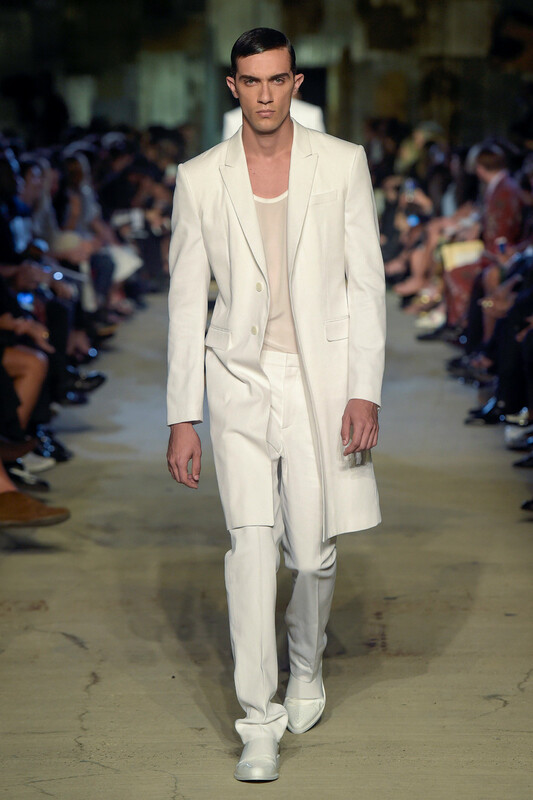 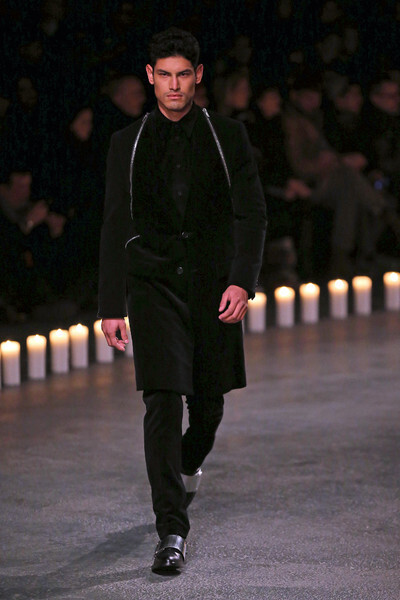 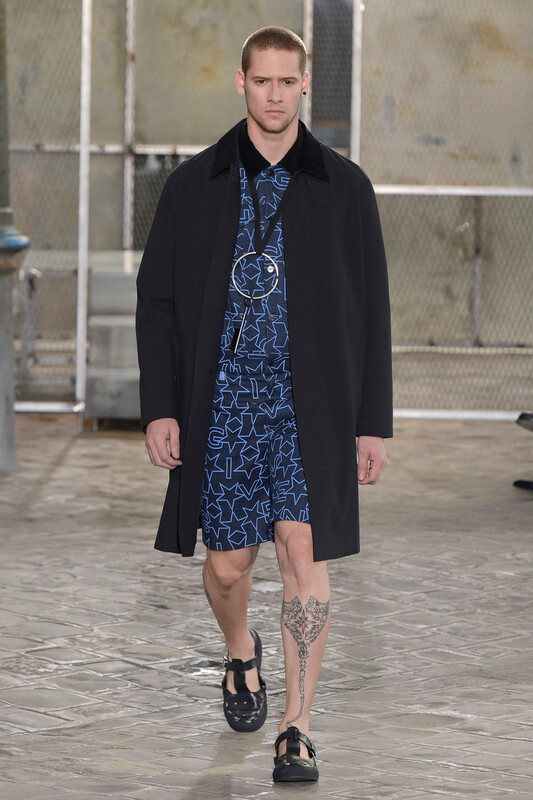 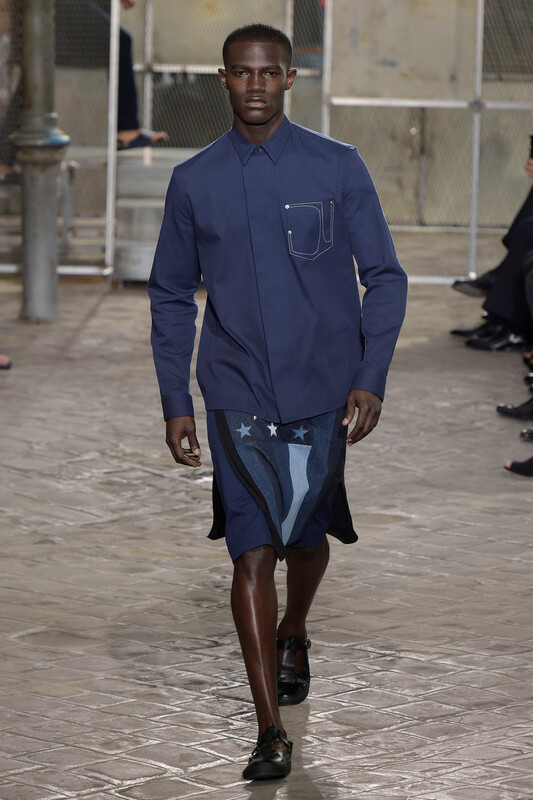 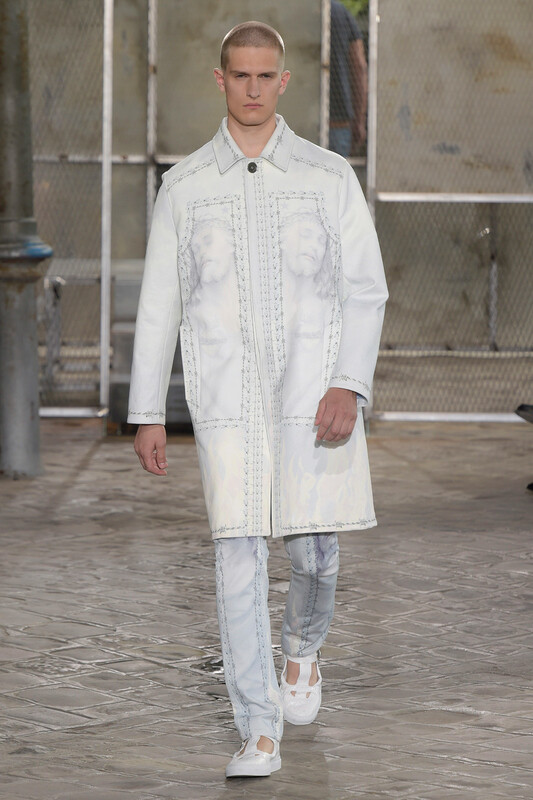 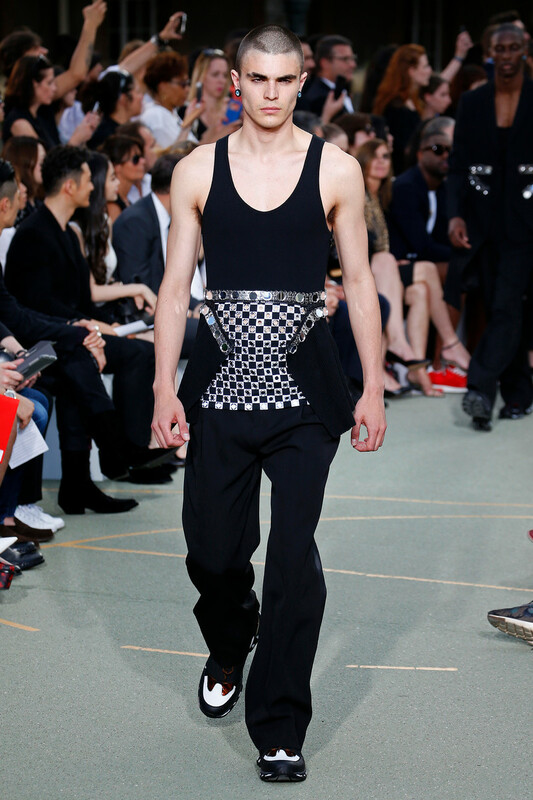 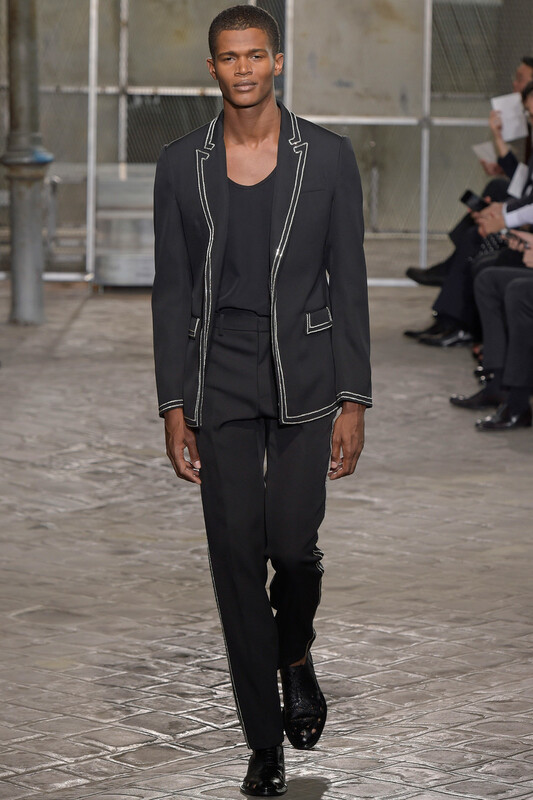 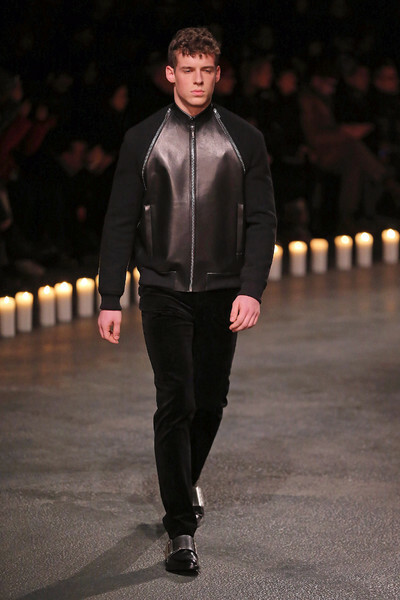 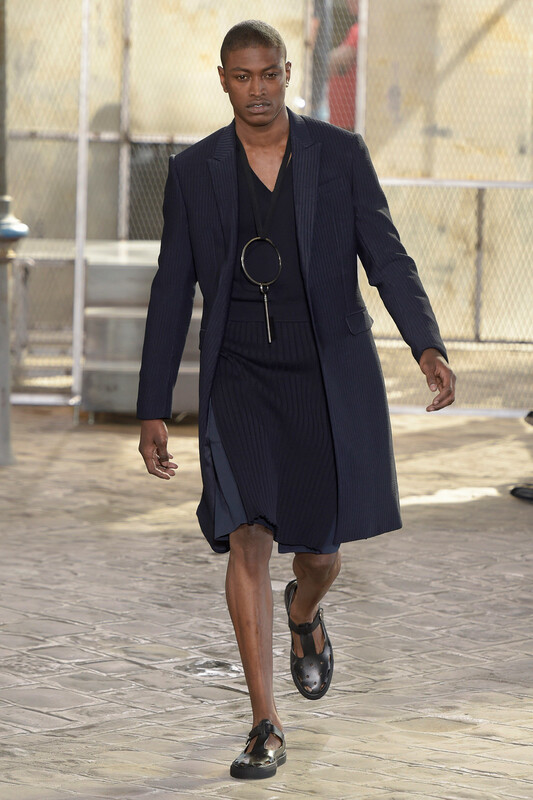 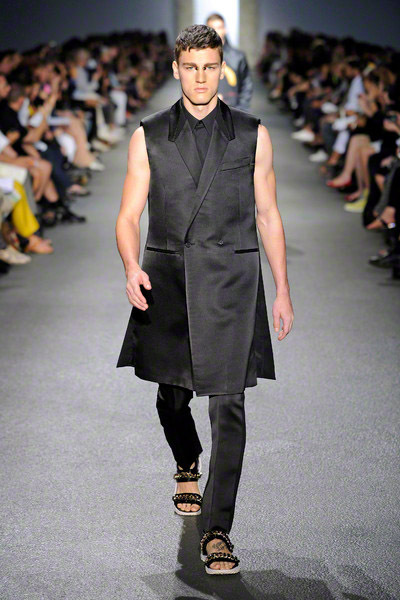 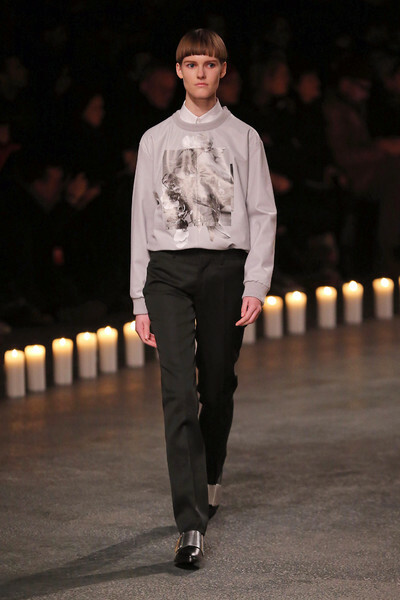 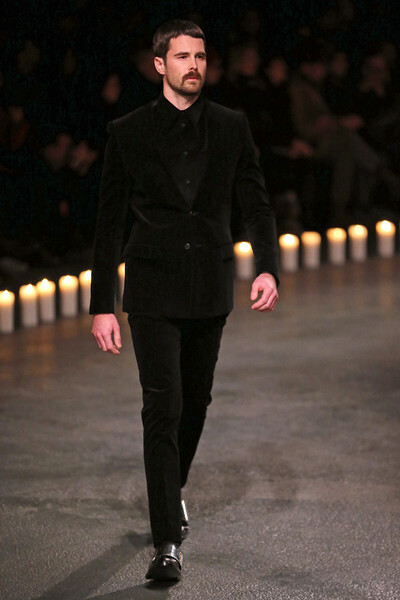 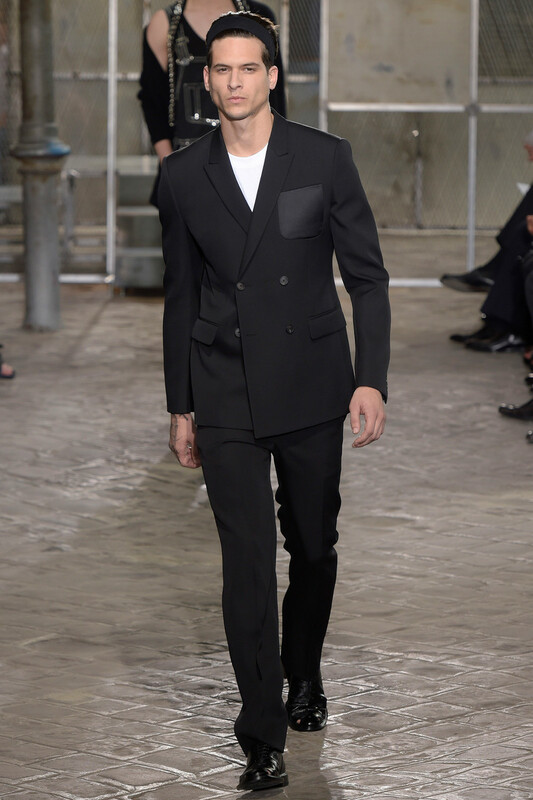 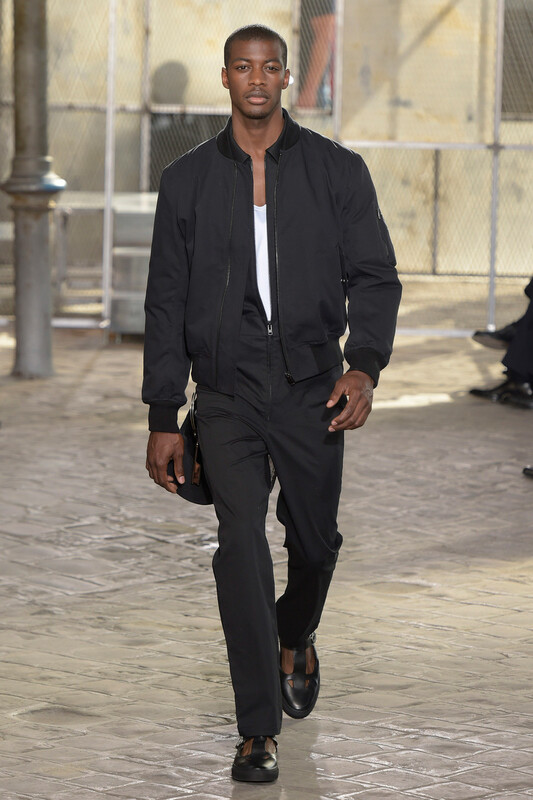 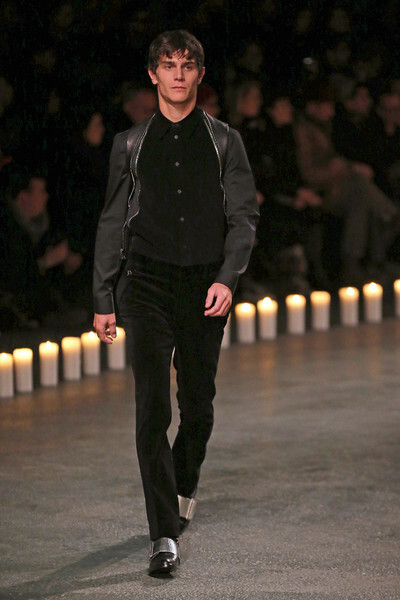 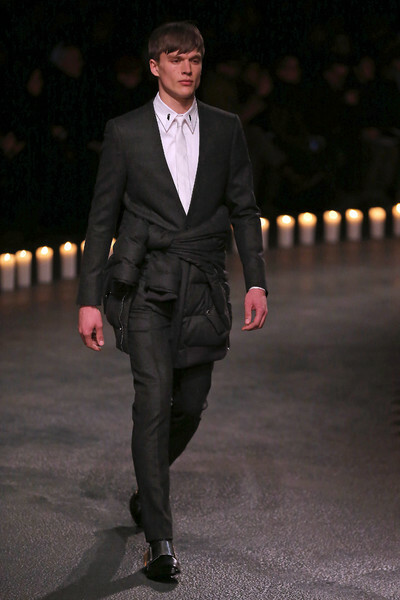 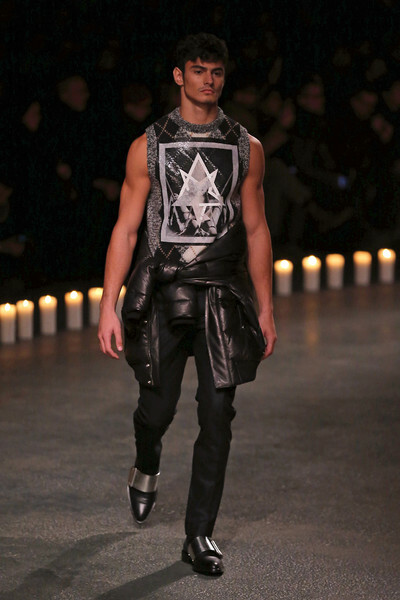 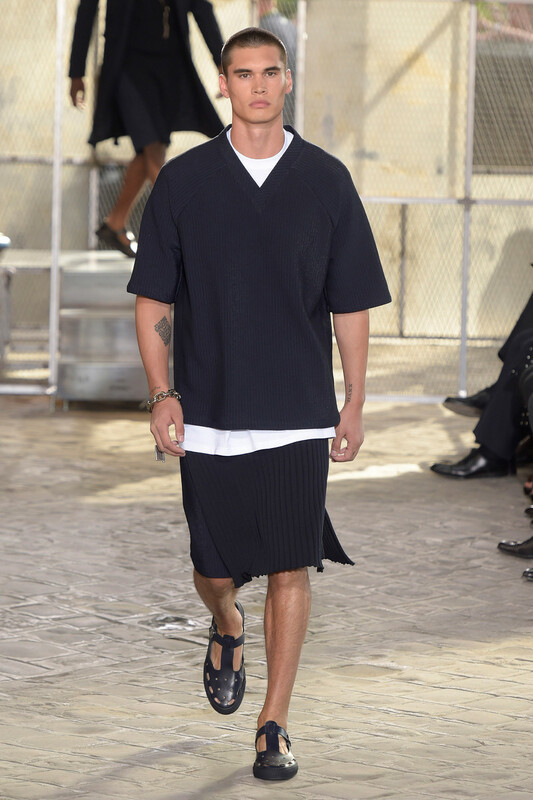 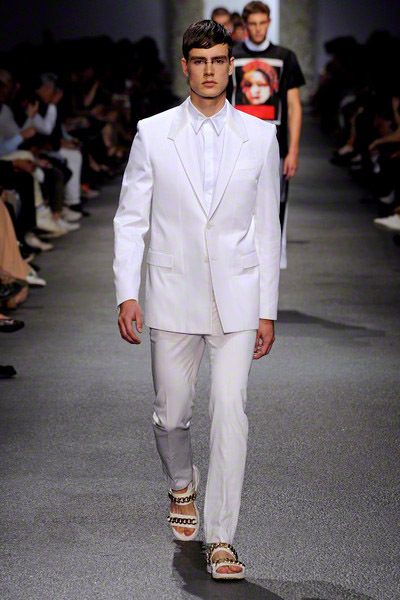 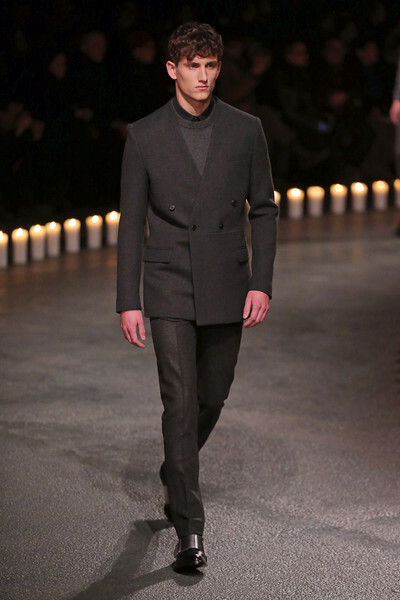 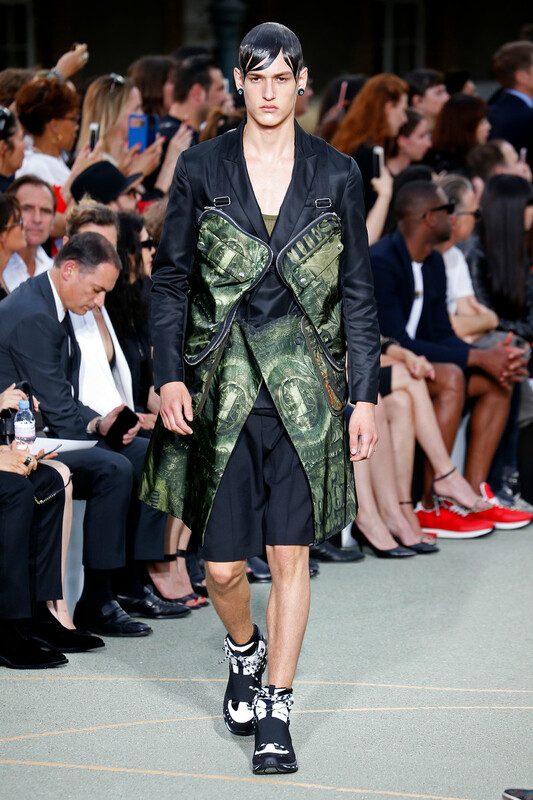 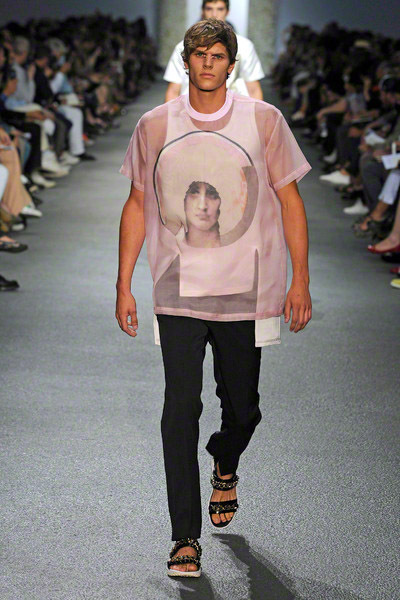 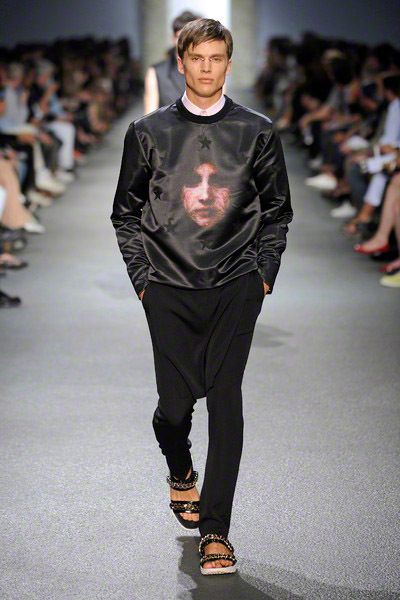 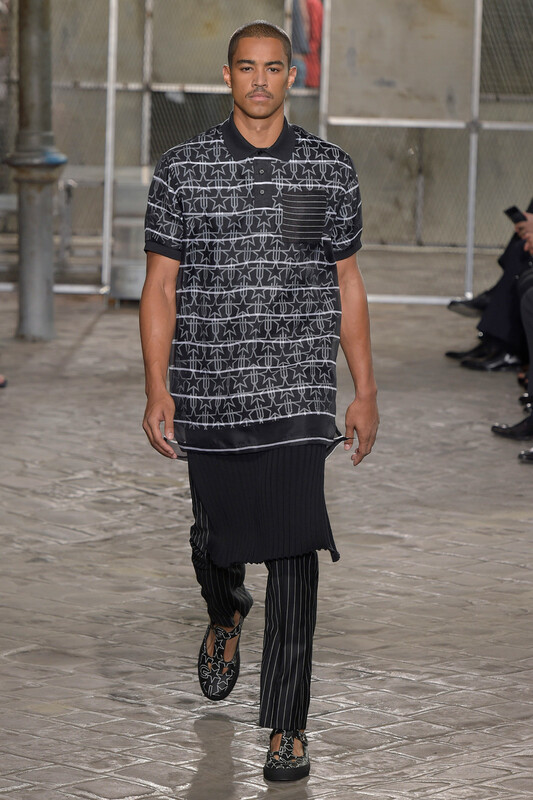 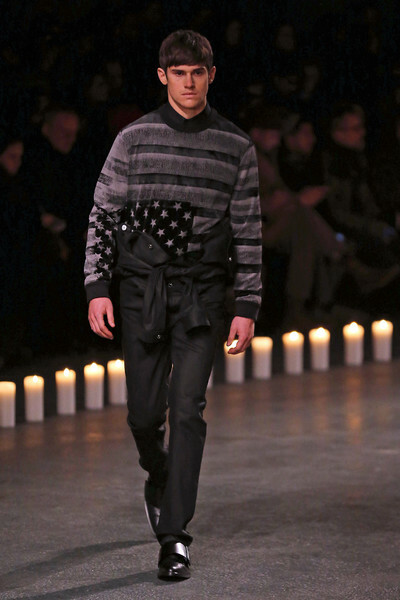 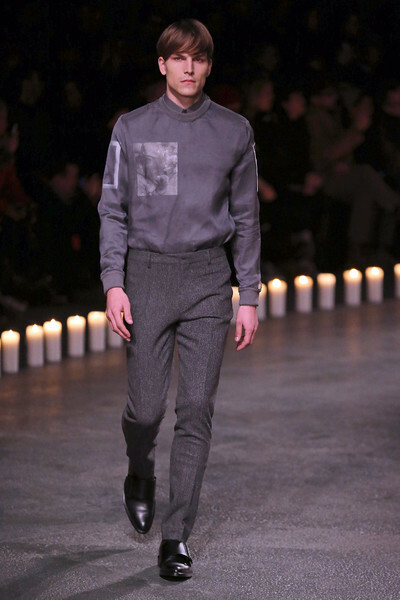 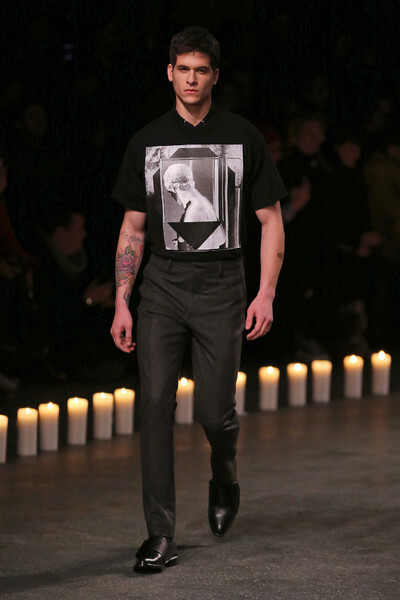 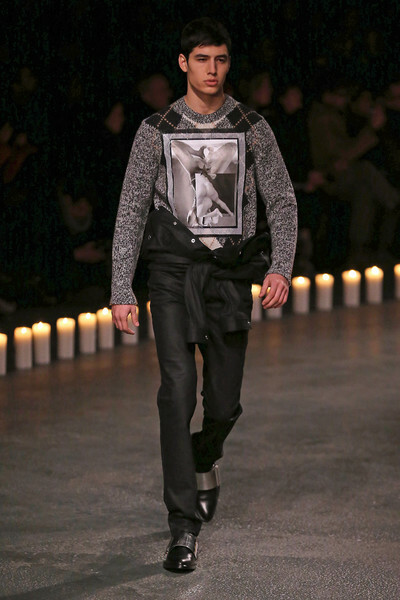 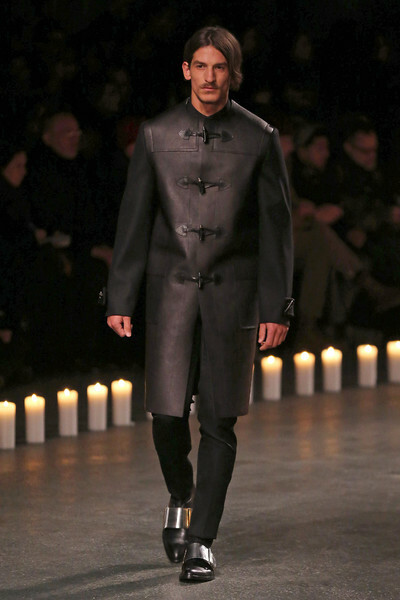 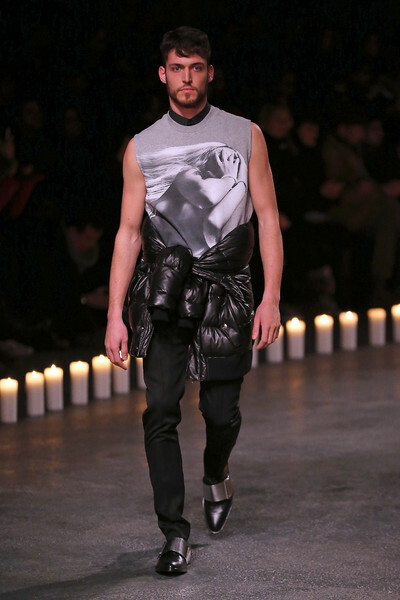 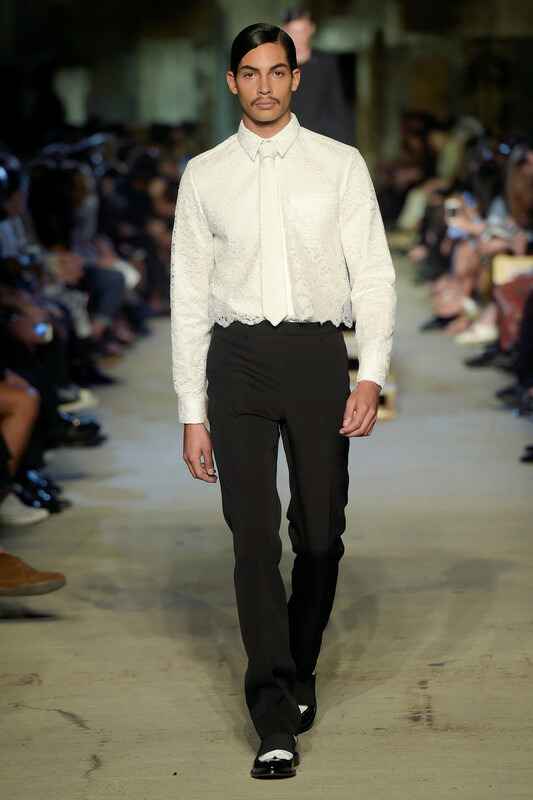 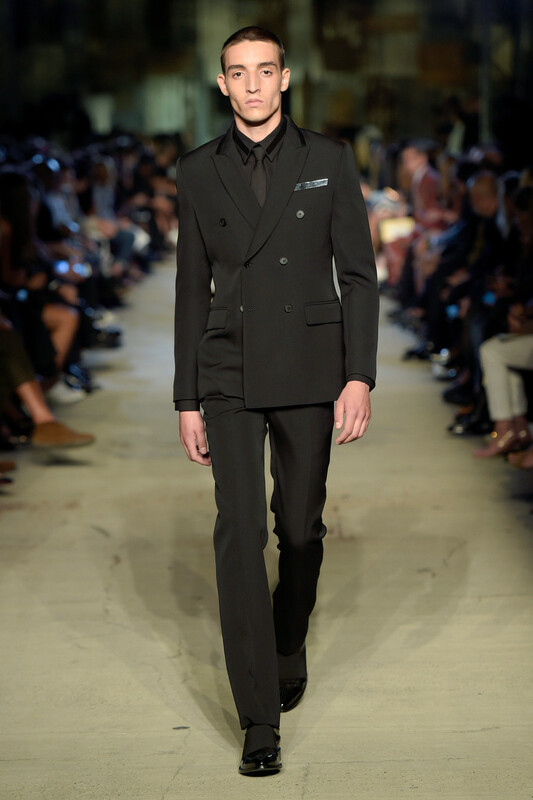 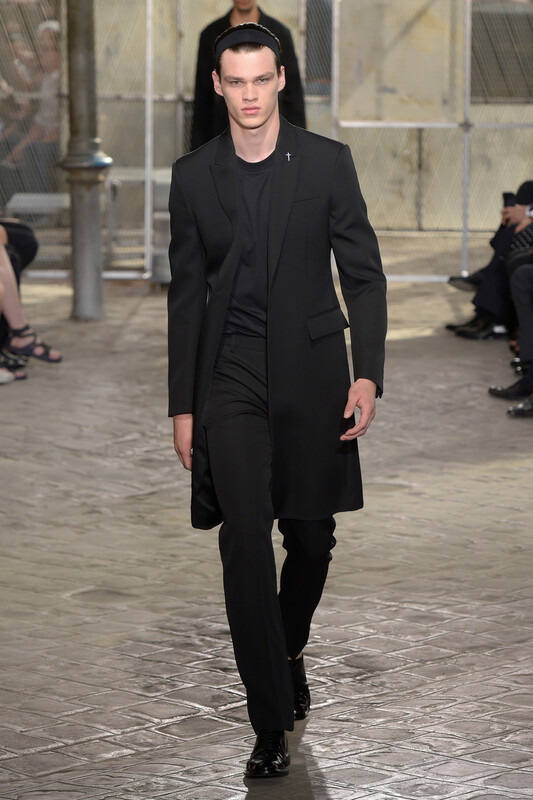 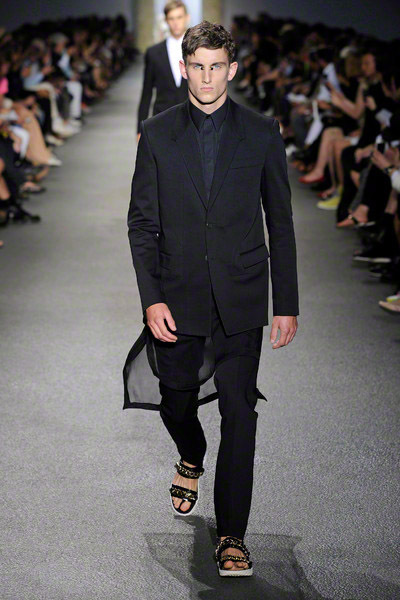 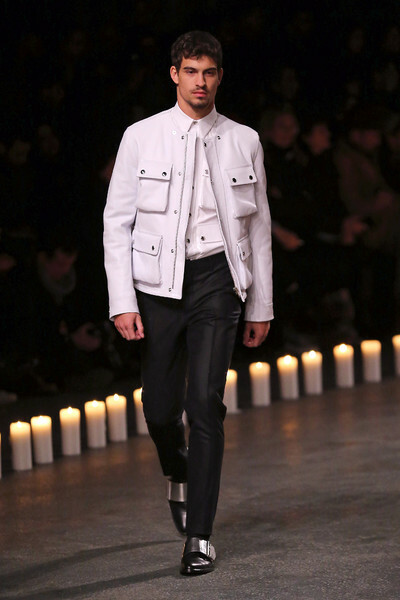 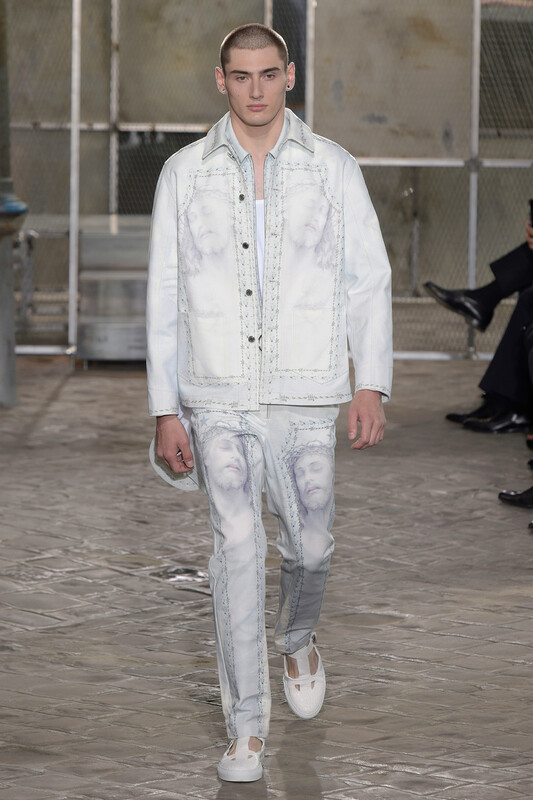 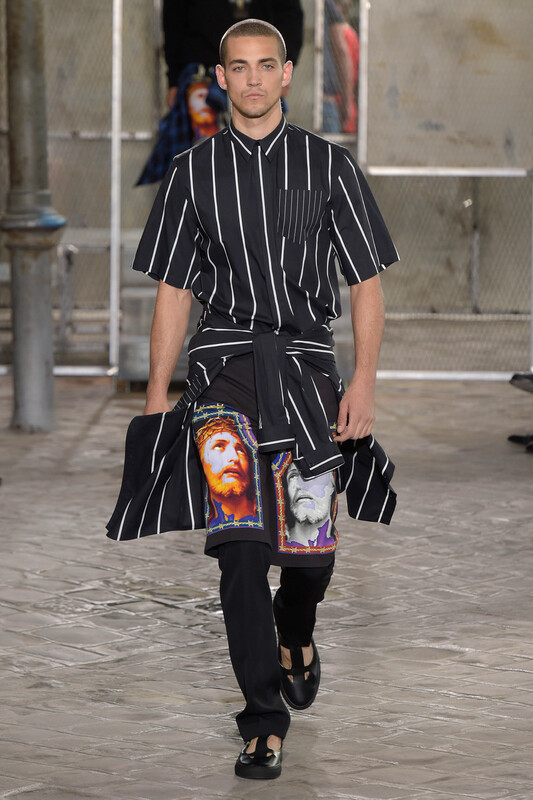 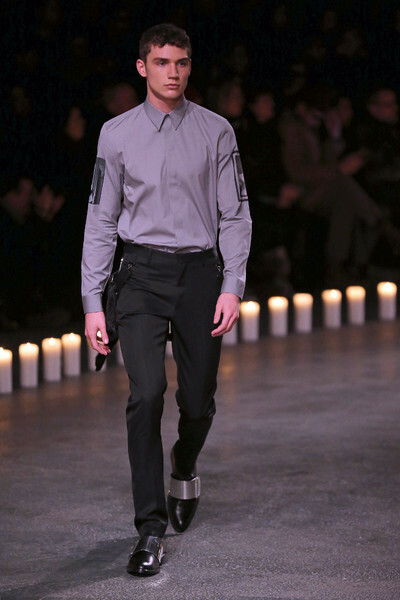 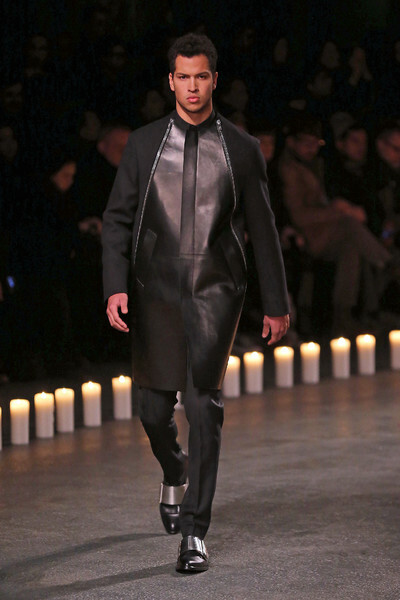 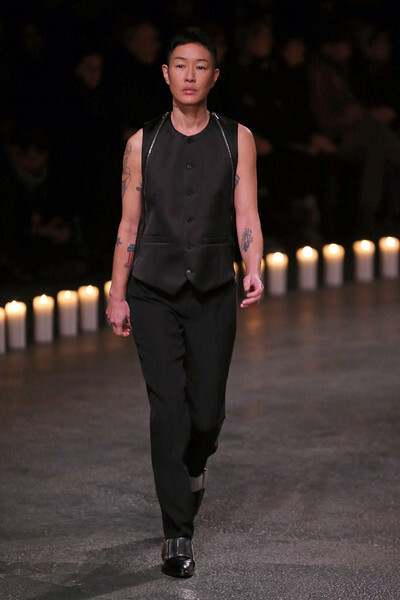 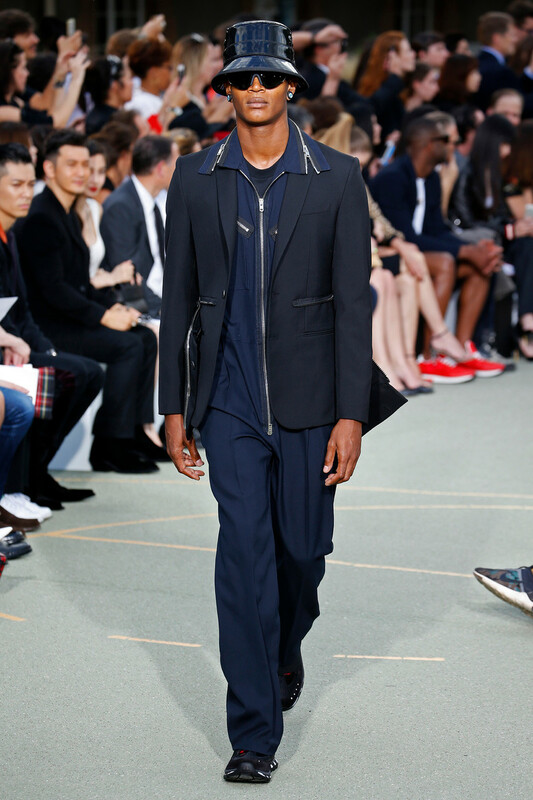 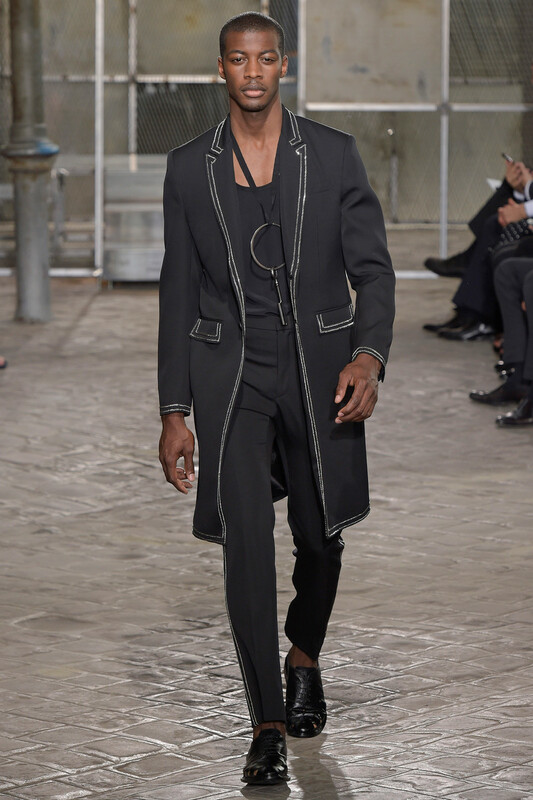 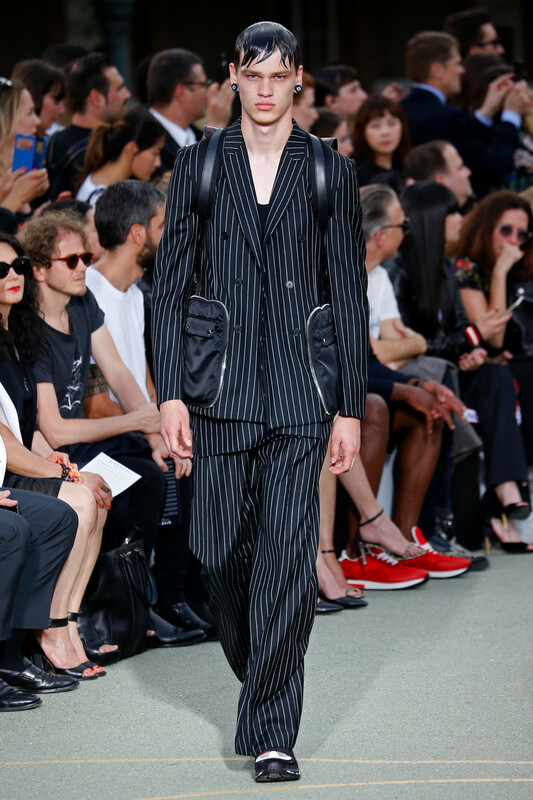 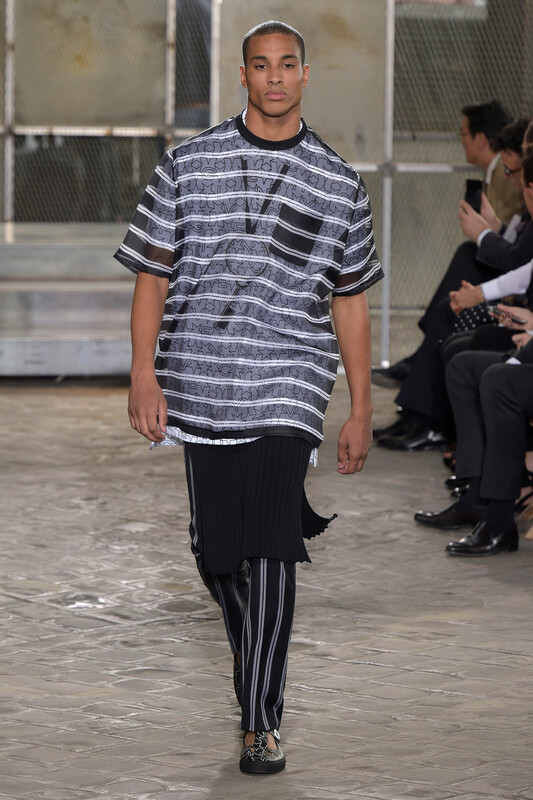 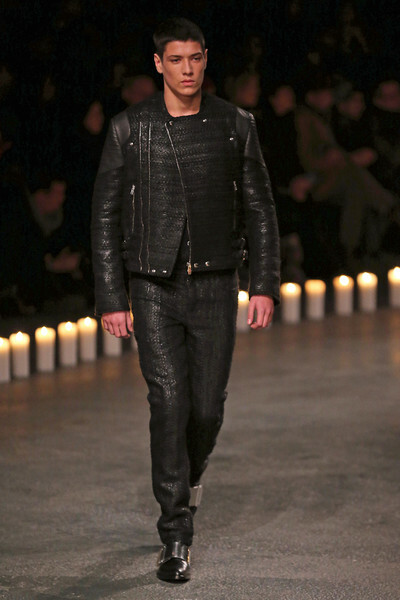 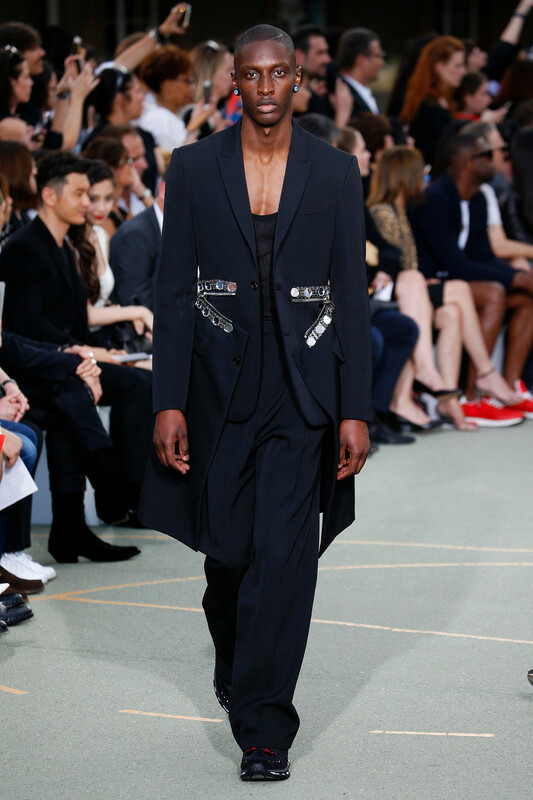 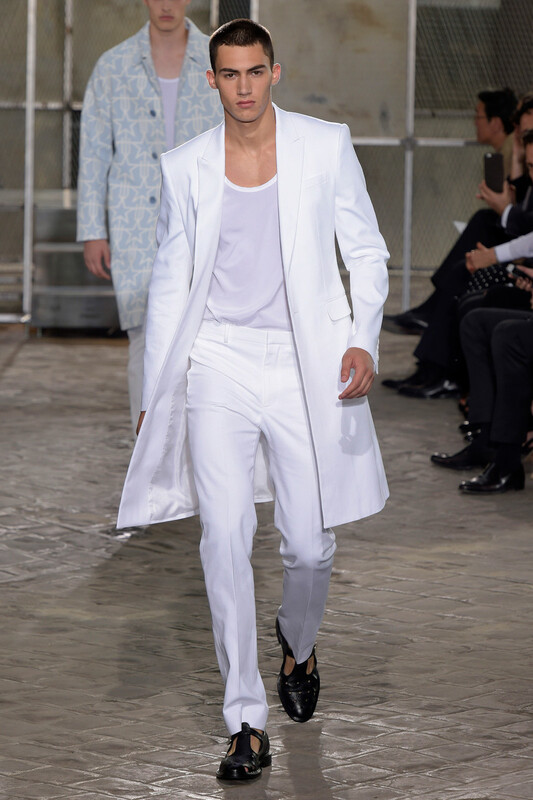 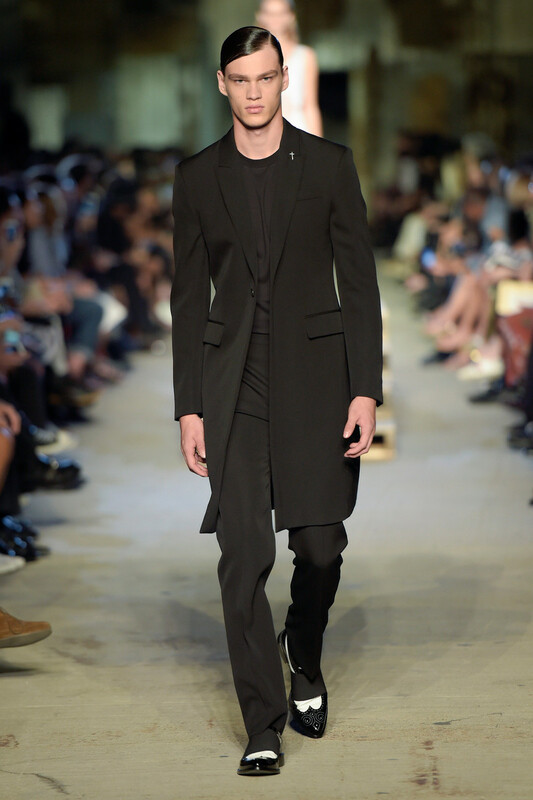 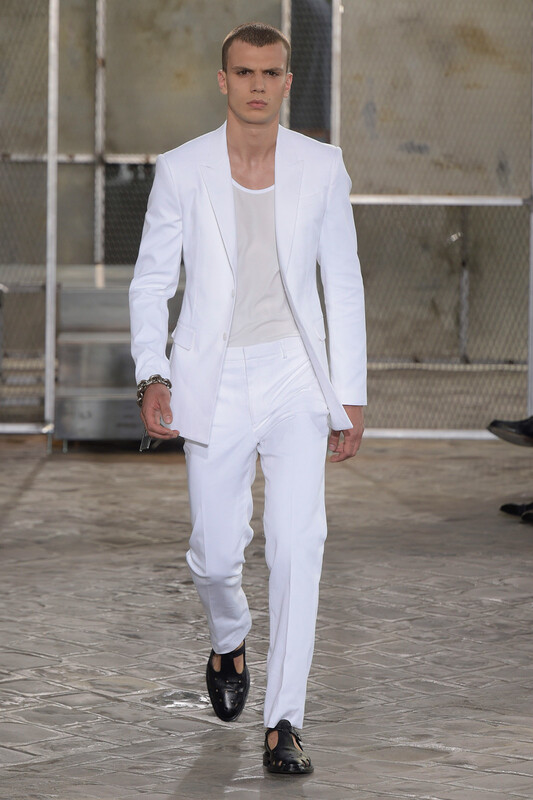 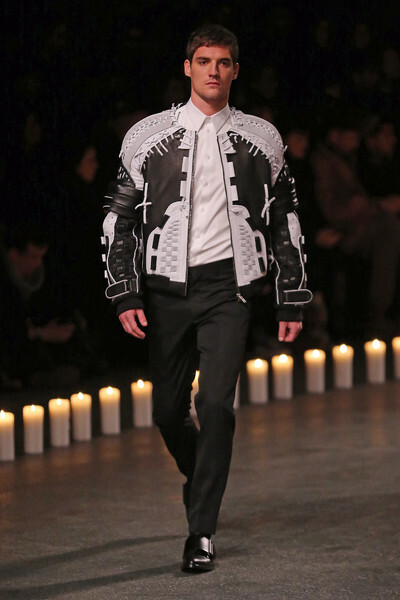 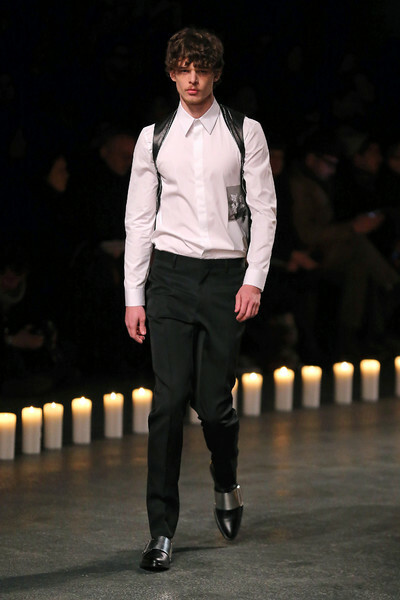 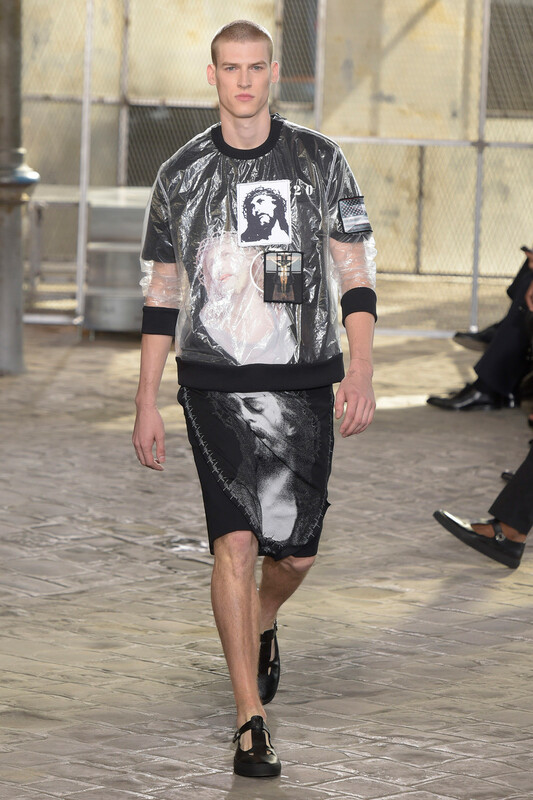 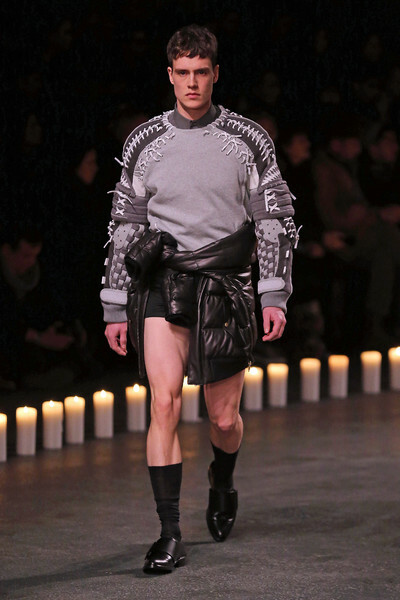 ‘The cult of communion’ was the starting point of the Givenchy menswear-collection. 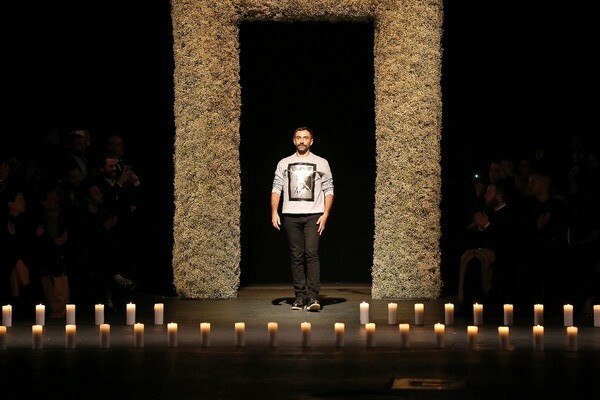 The church incense and organ music that preceded the show set the mood already. 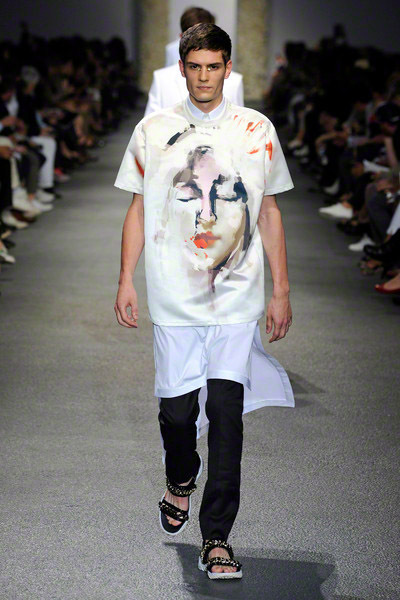 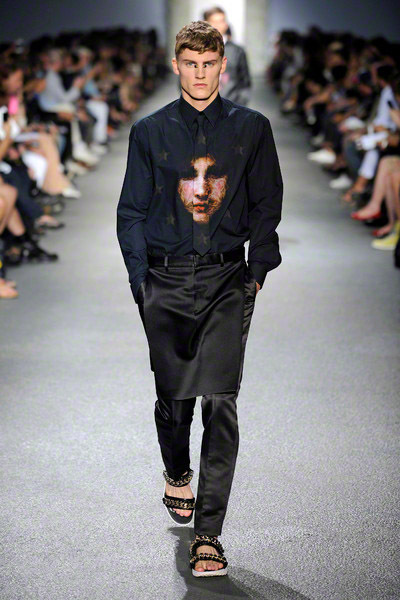 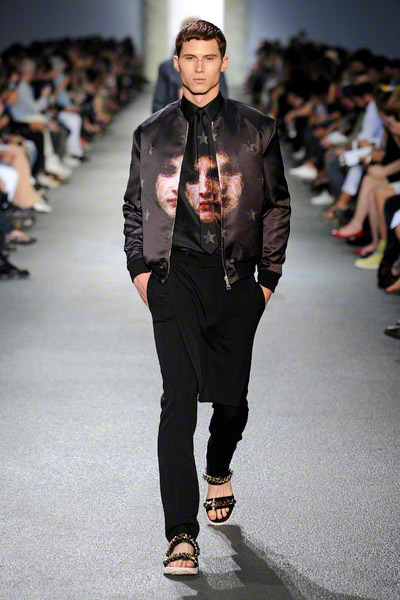 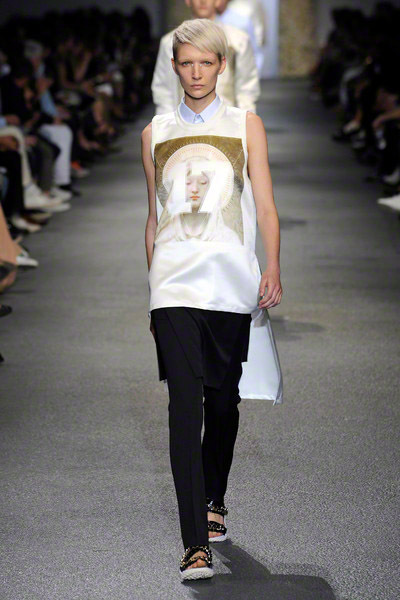 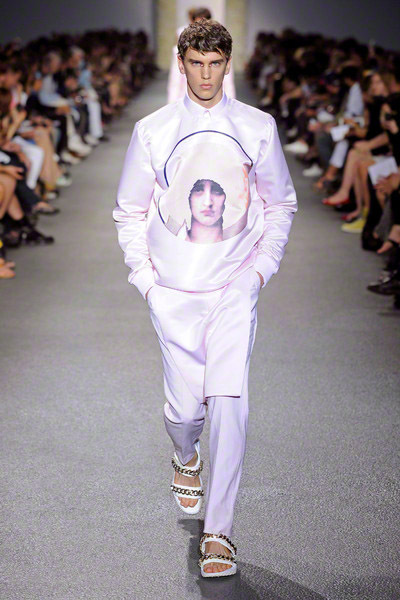 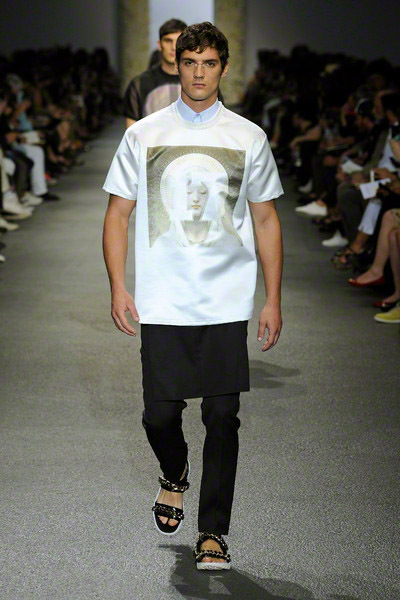 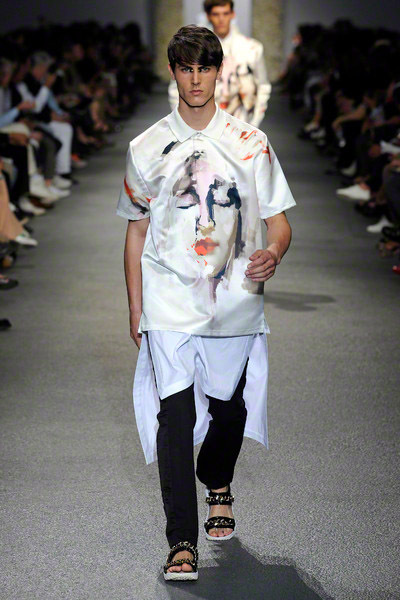 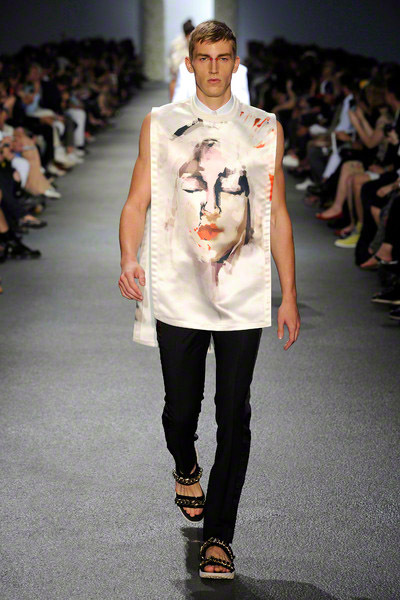 Tisci printed innocent white brocade with spooky looking vestigial faces. 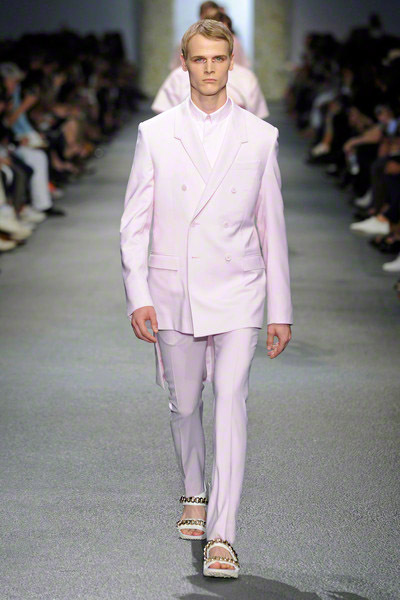 He played with layering and proportion and gave just a small reference to priestly vestments by adding a white collar that peeked from under black coats or ice-pink satin. 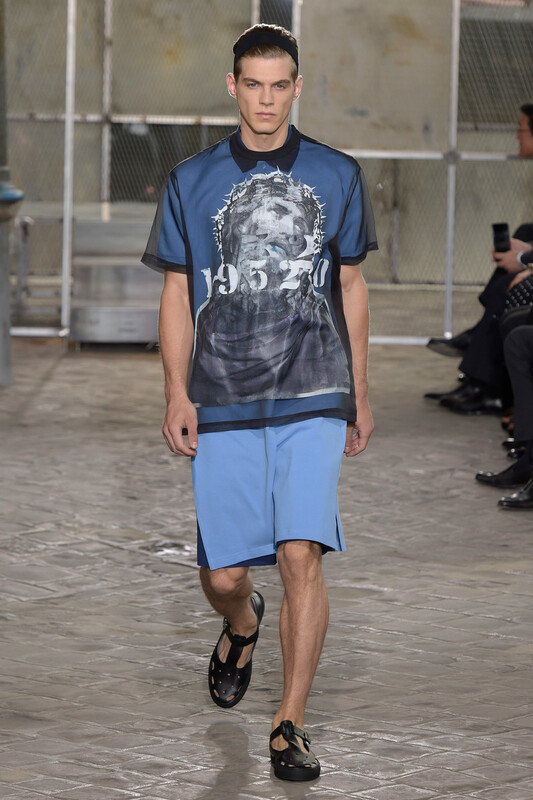 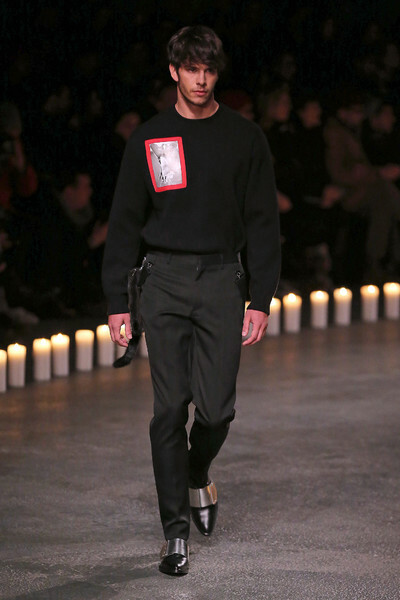 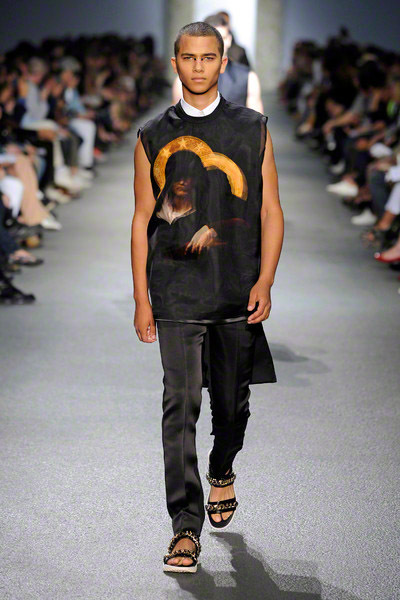 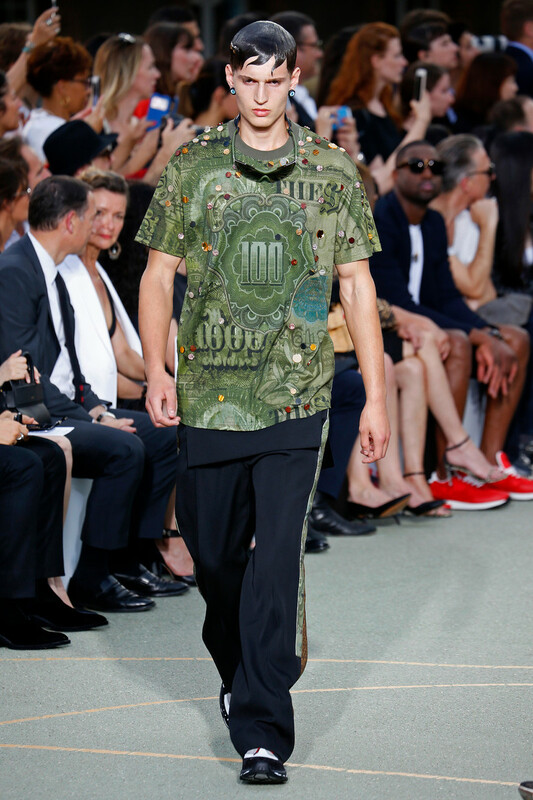 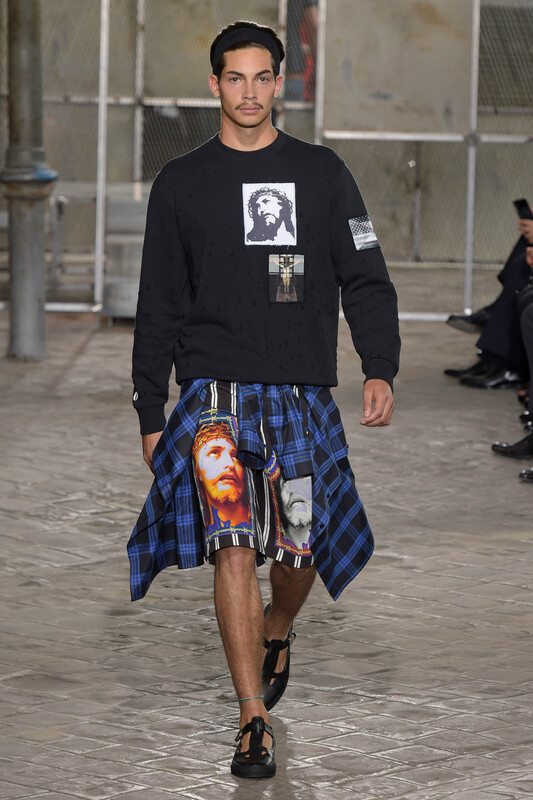 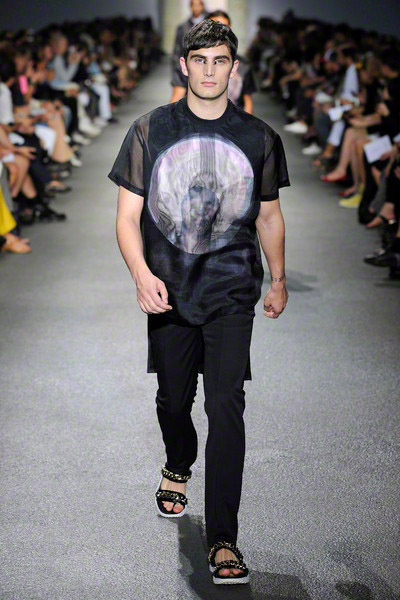 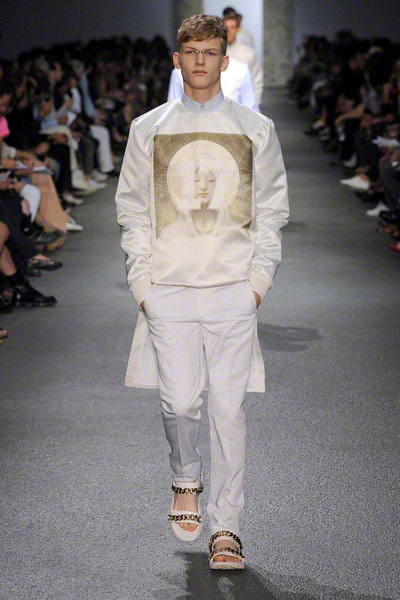 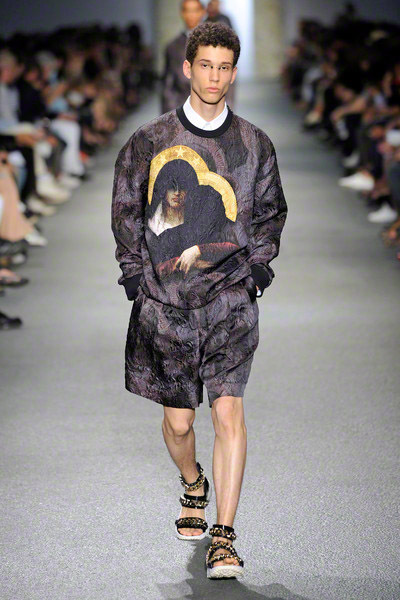 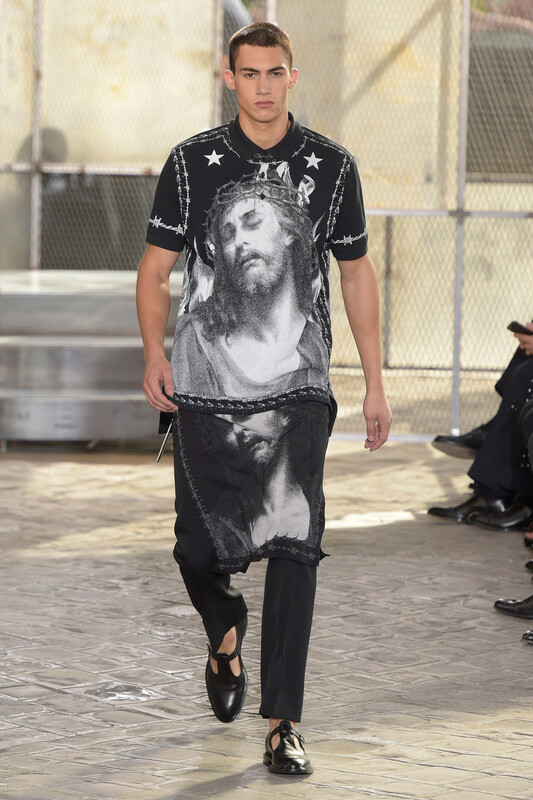 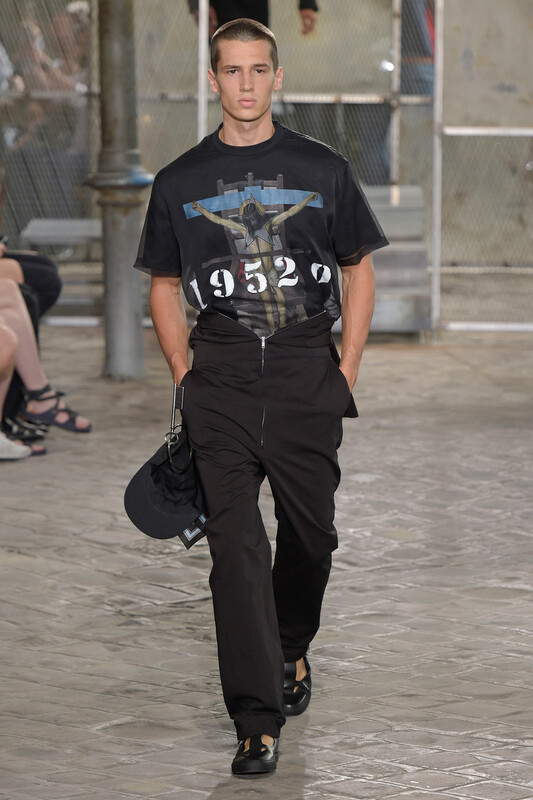 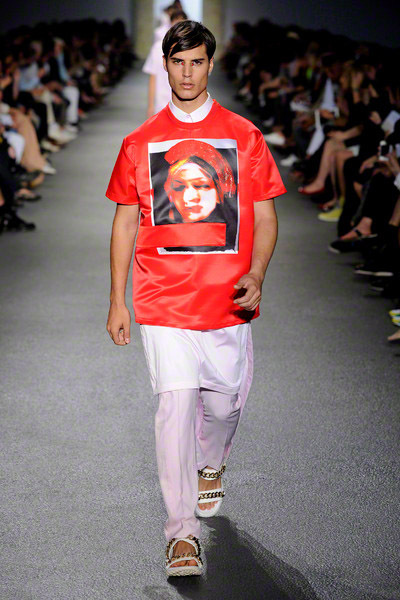 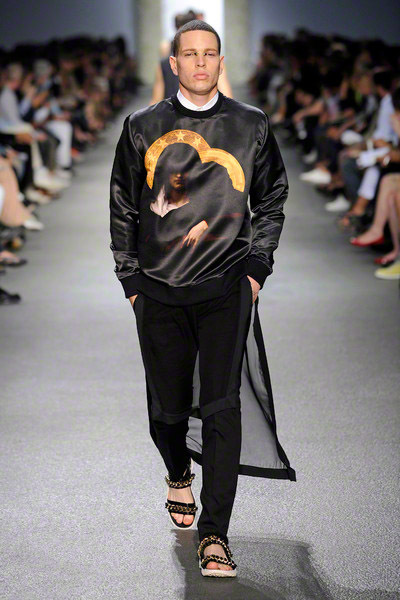 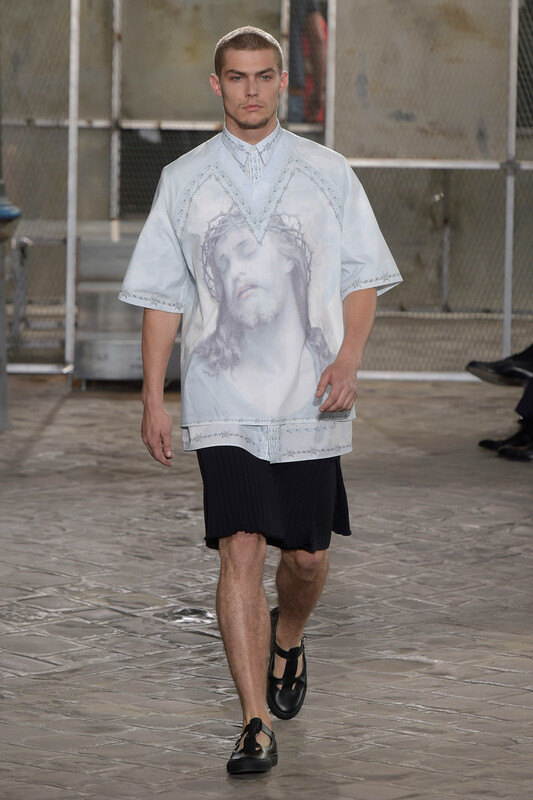 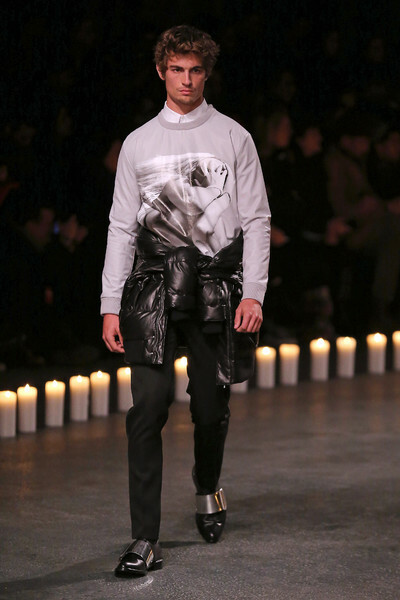 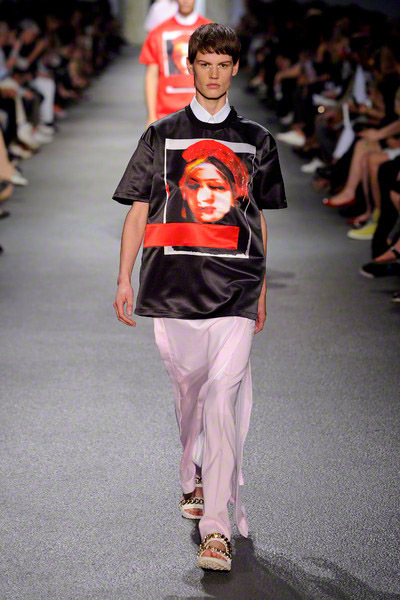 The designer had artists reinterpret classic religious imagery to provide the collection’s graphic tees and sweats, which have made Tisci’s work for Givenchy such a visible presence around the world. 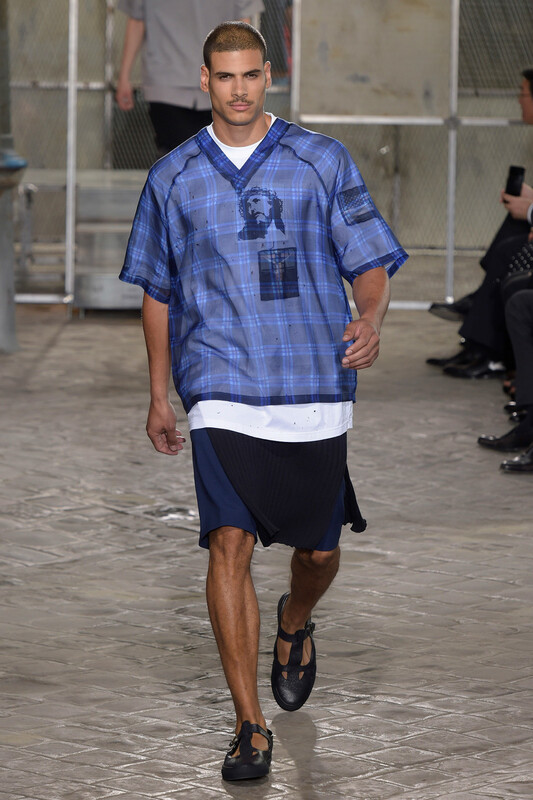 While the designer continued his devotion to active shapes — sweatshirts, polos, T-shirts and baseball jackets — he set aside his recent fixation with skirts for men. 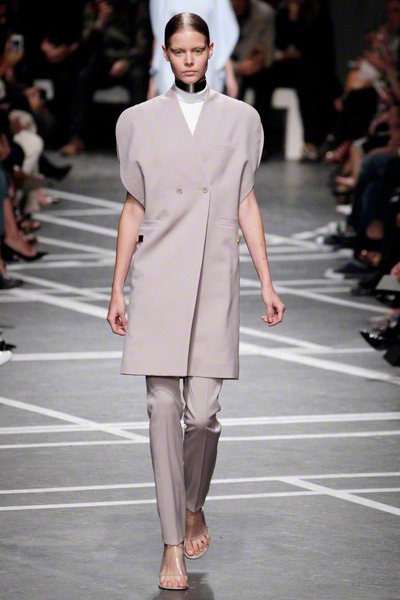 Instead, bi-level tunics flapped under suit jackets. 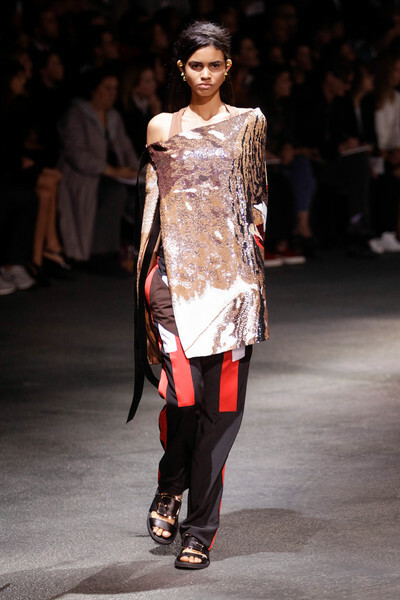 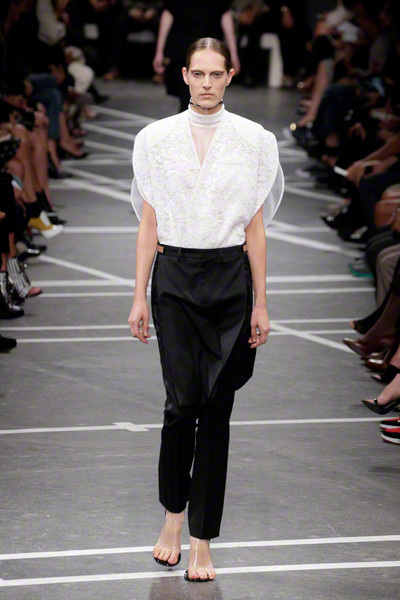 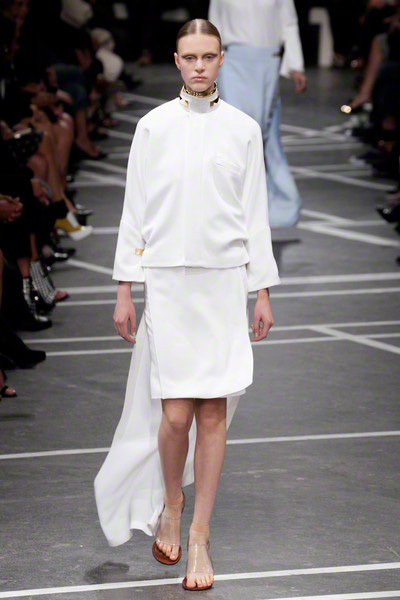 Inspired by the Bauhaus movement, the tailoring was bold and linear, with triangles of fabric inset into lapels and shirt collars.Tisci treated feminine fabrics like satin and organza as sweatshirt material, stamping his sporty jerseys with female religious icons instead of player numbers.